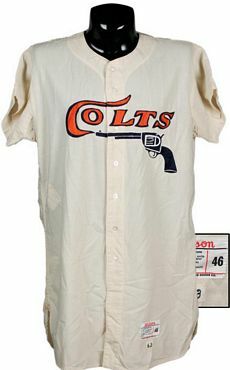 Houston joined MLB in 1962 as the Houston Colts. 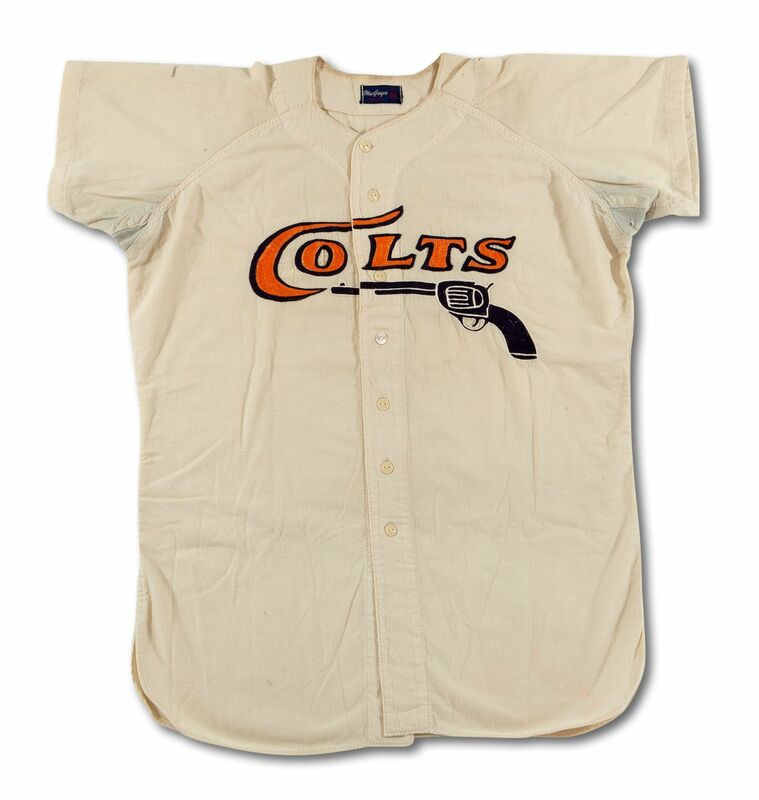 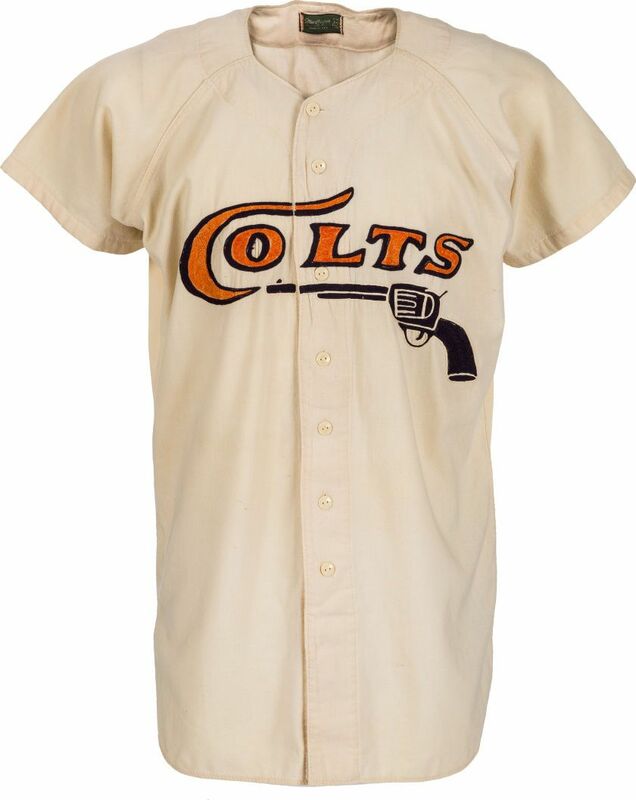 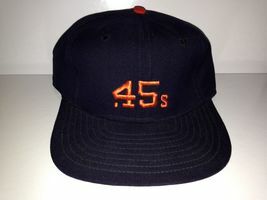 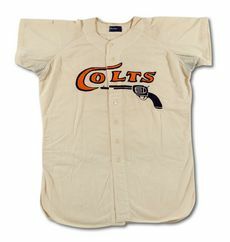 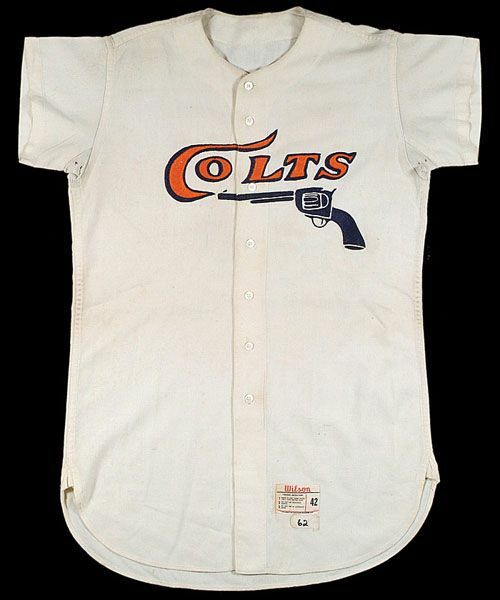 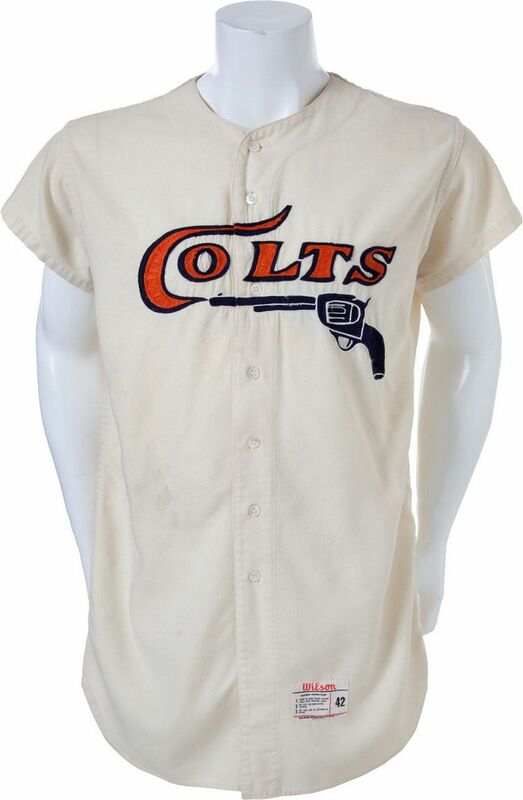 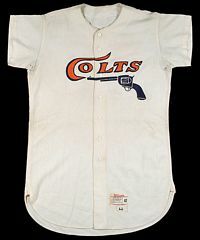 The nickname became the Colt .45's as ownership wanted to be clear that Colts meant the gun, not the horse. 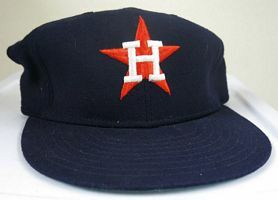 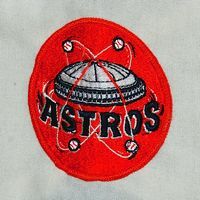 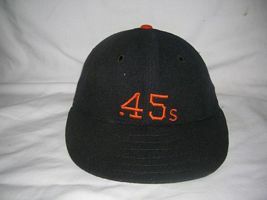 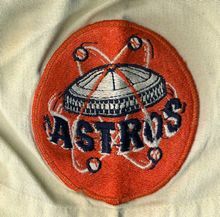 By 1965, embroiled in a dispute over mechandising with gun maker Colt Firearms, the team changed its name to Astros for the move into the new Astrodome. 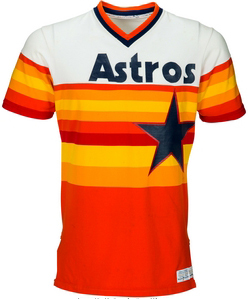 By the mid-1970's the team had one of the more colorful looks in baseball. 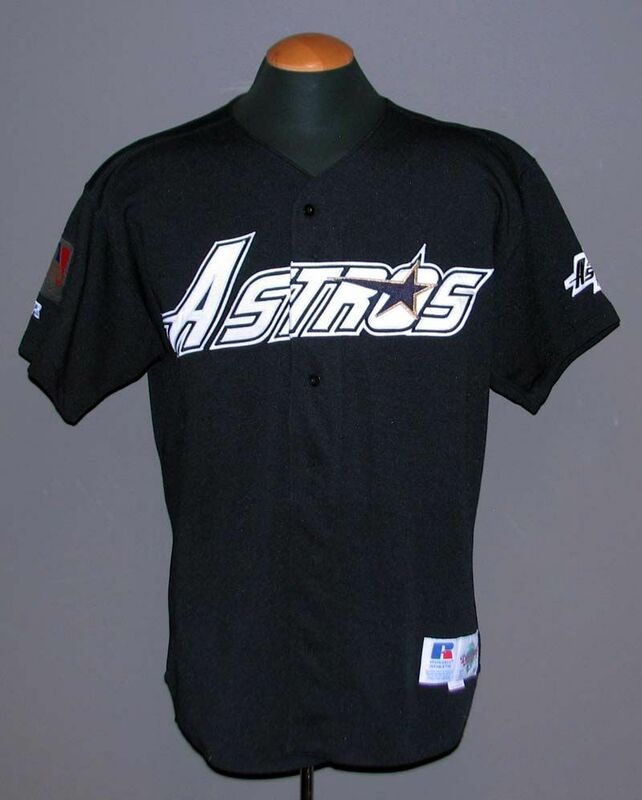 The look was completely redesigned in 1994. 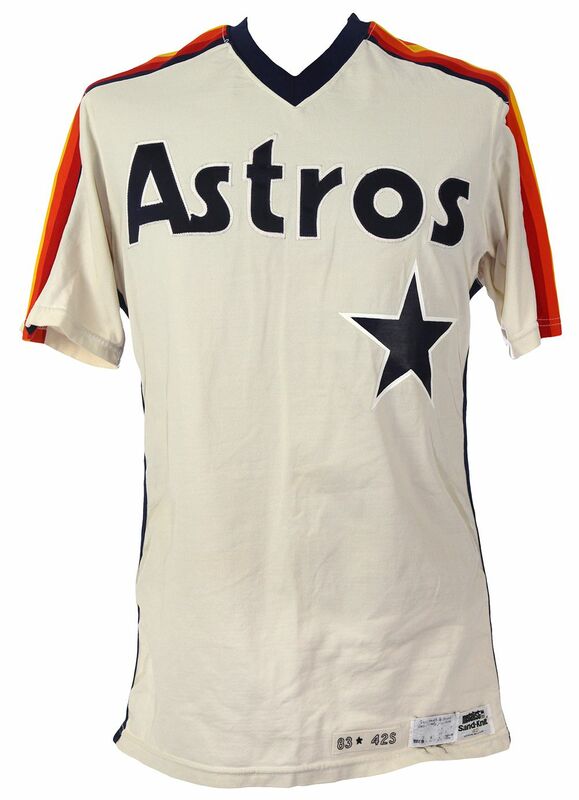 In 2013, upon moving to the AL from the NL, the Astros returned to a look reminiscent of the 1960's. 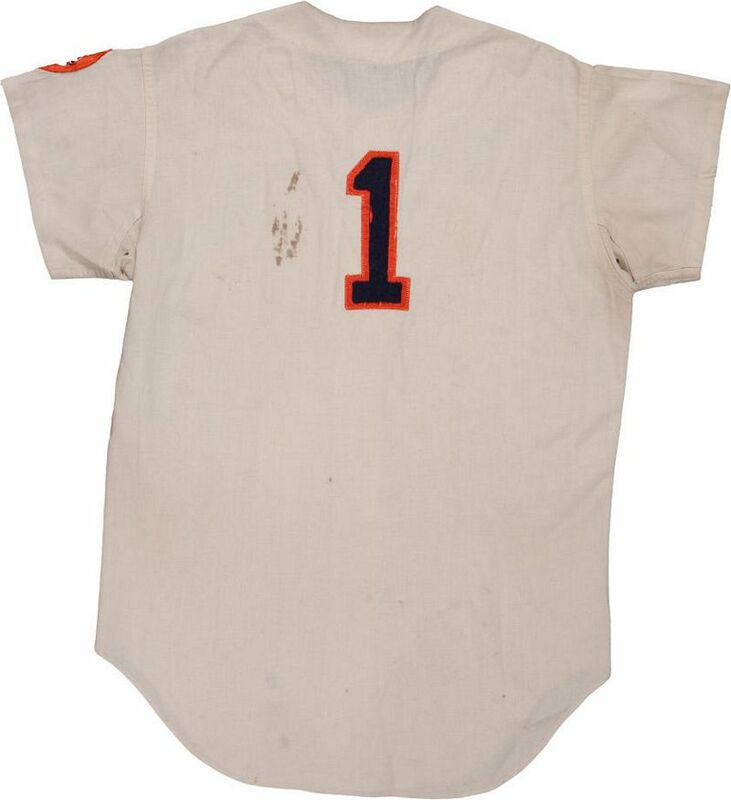 Number removed on this one. 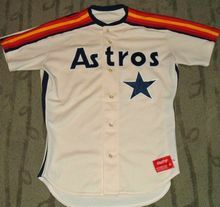 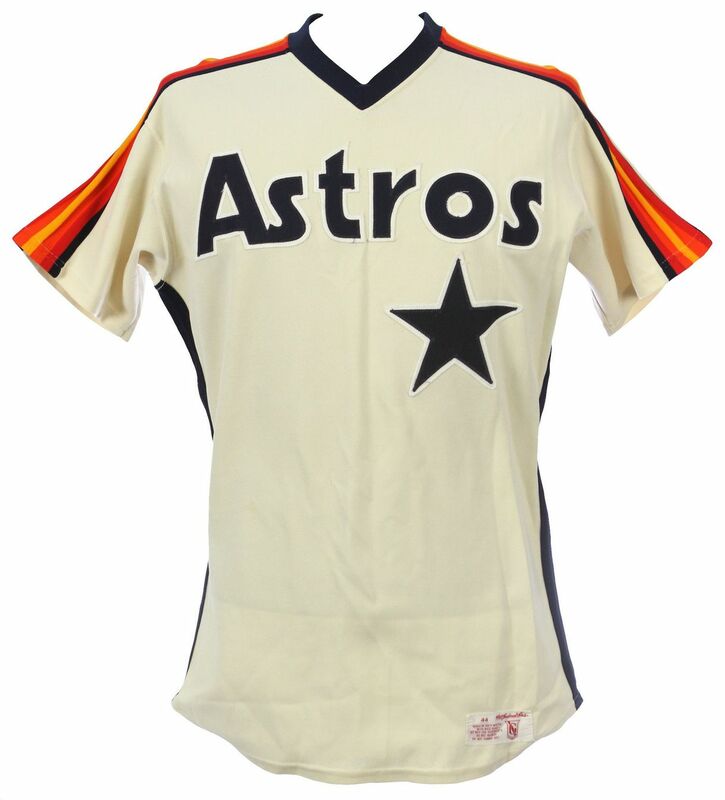 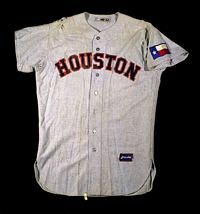 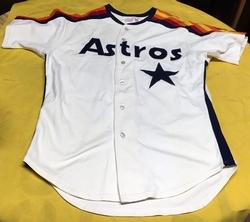 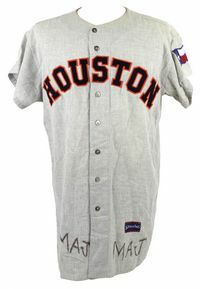 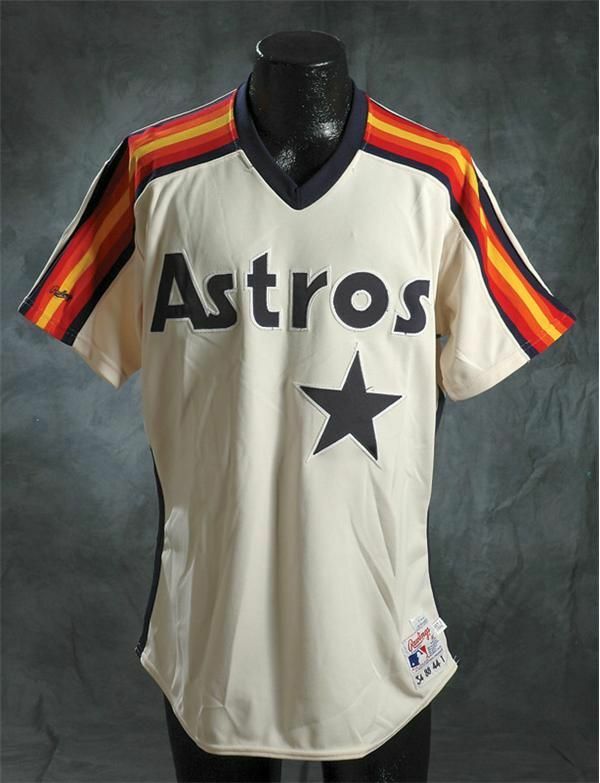 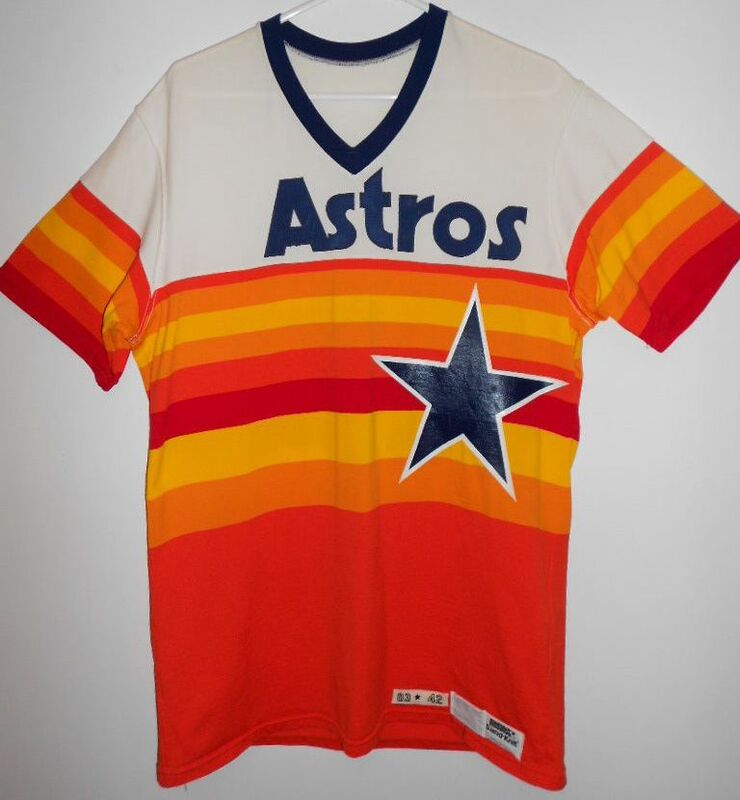 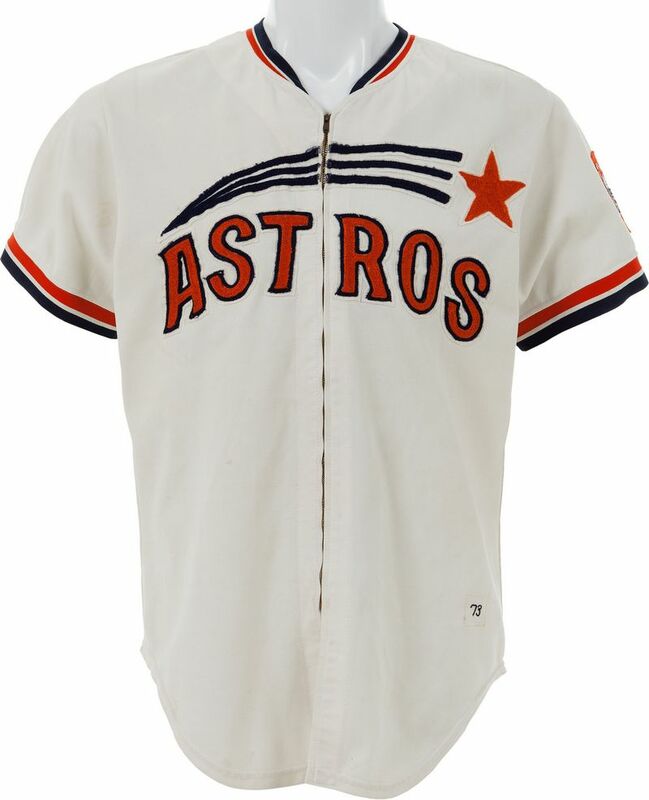 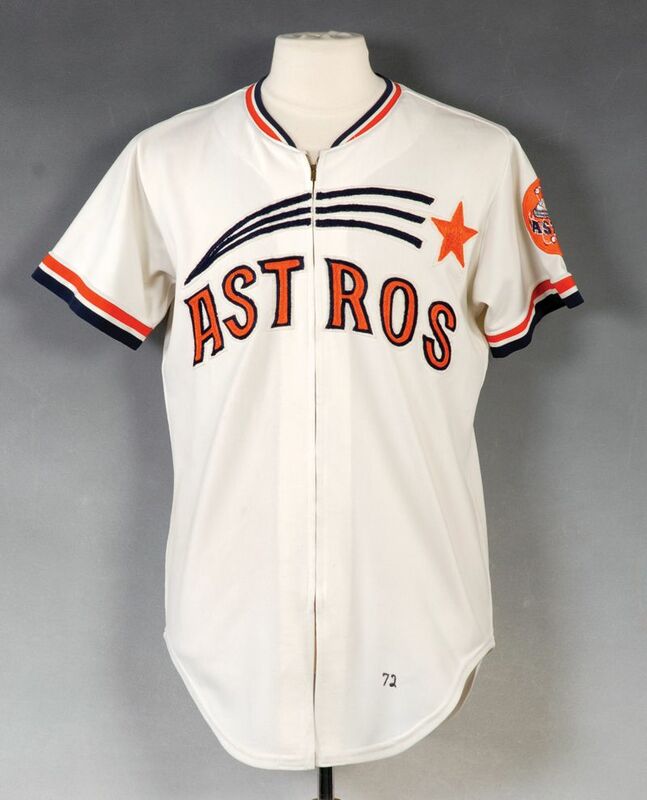 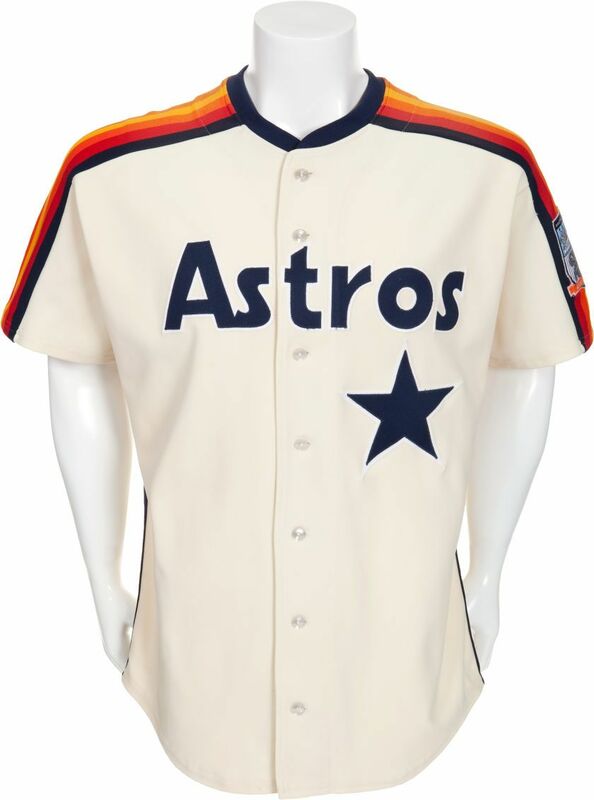 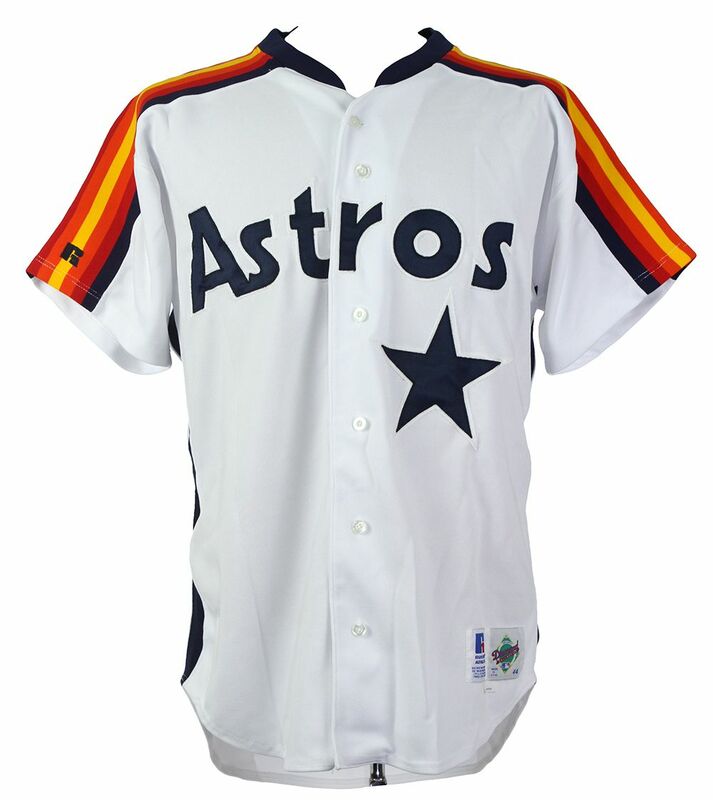 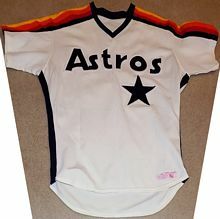 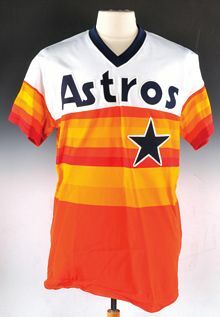 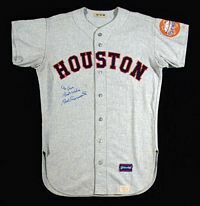 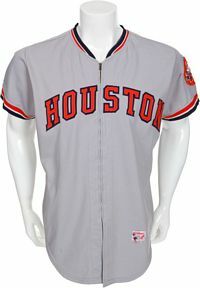 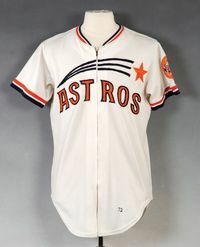 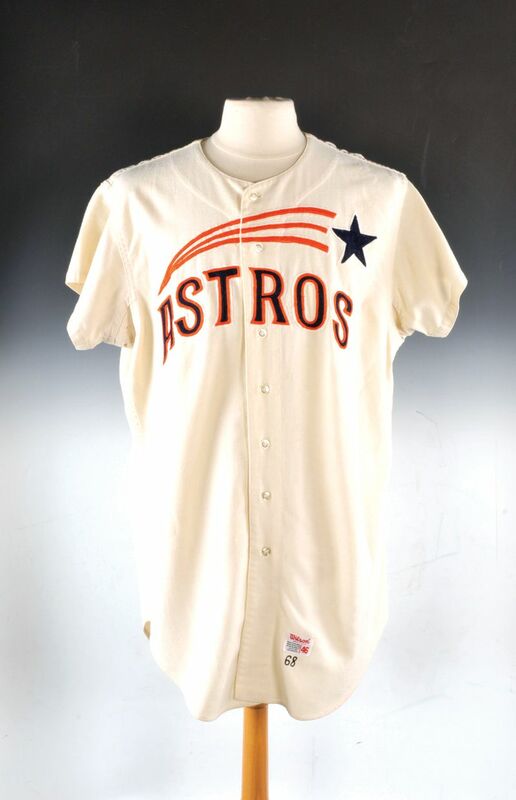 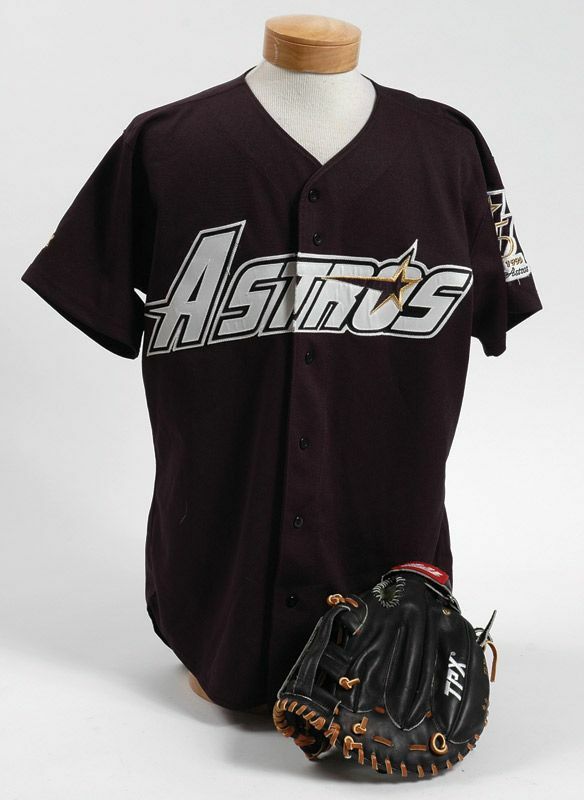 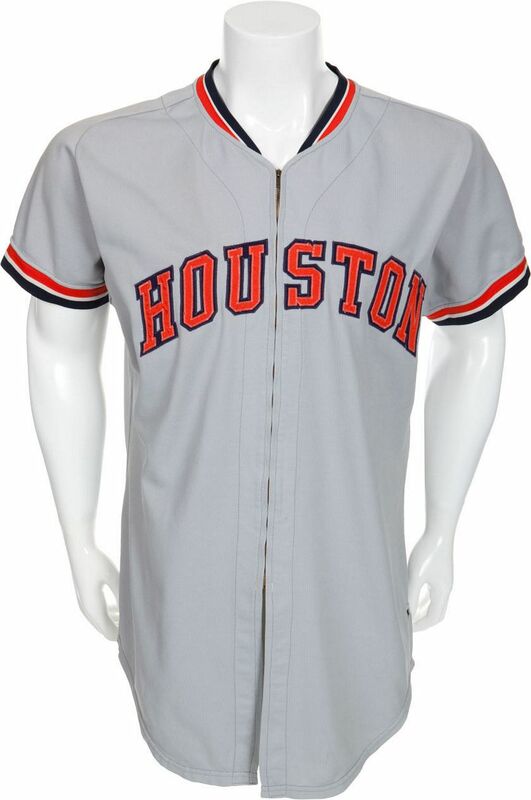 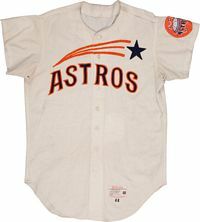 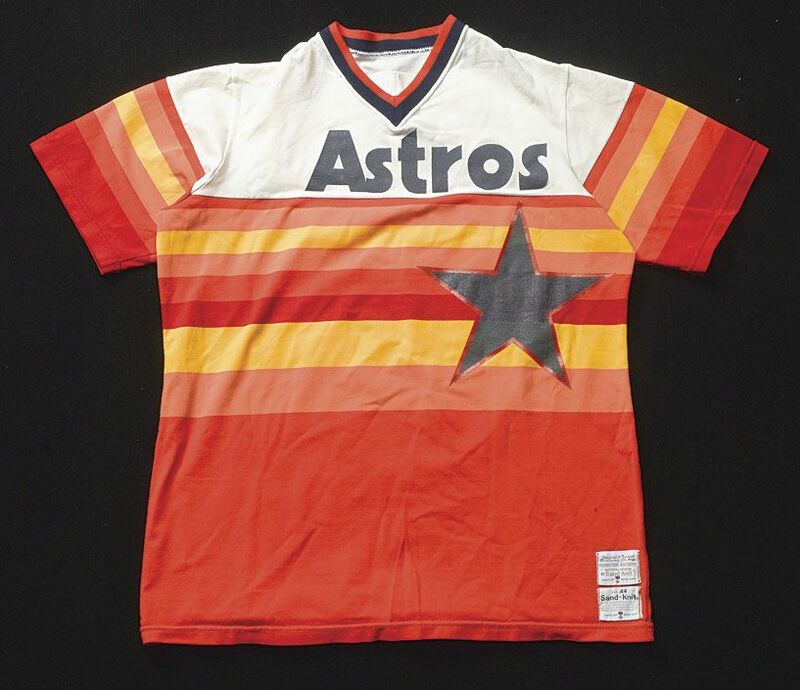 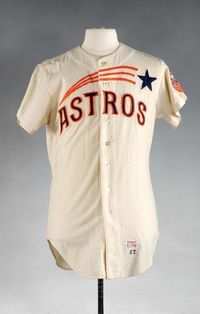 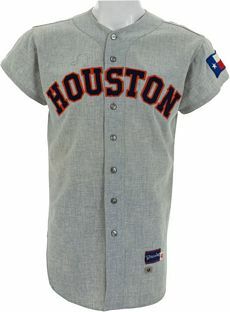 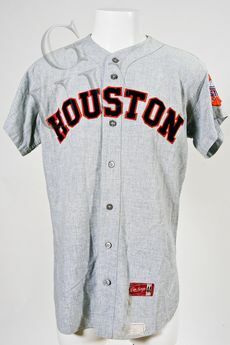 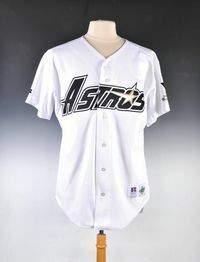 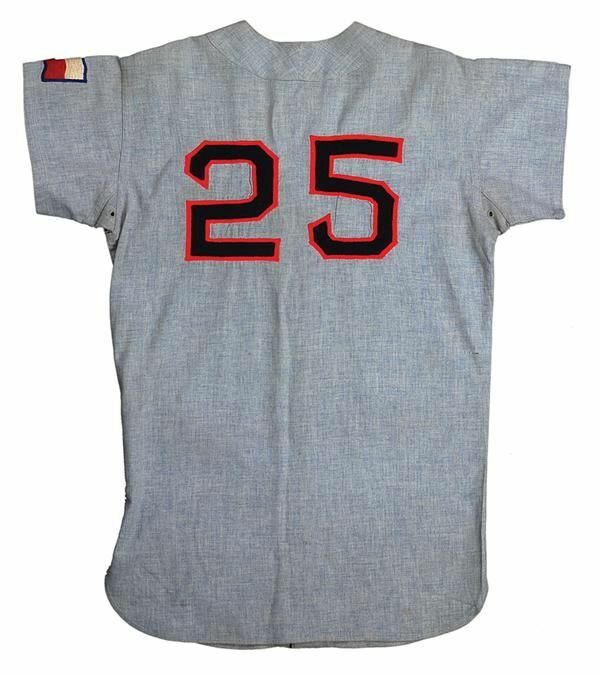 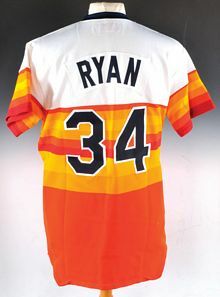 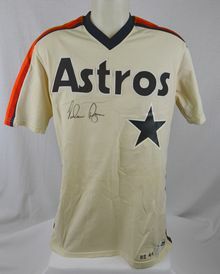 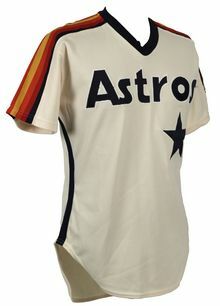 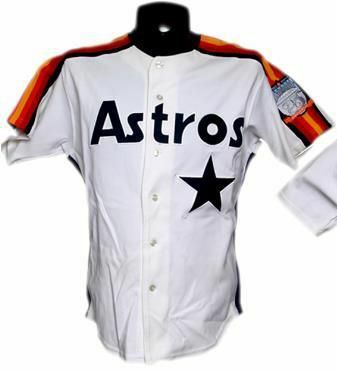 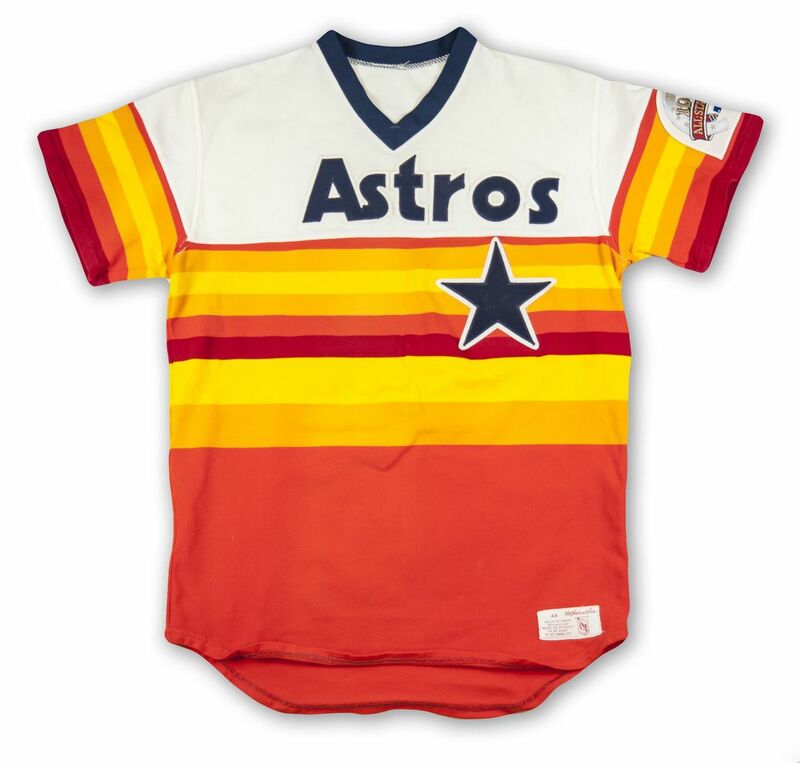 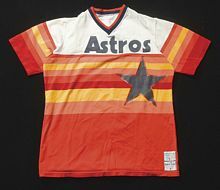 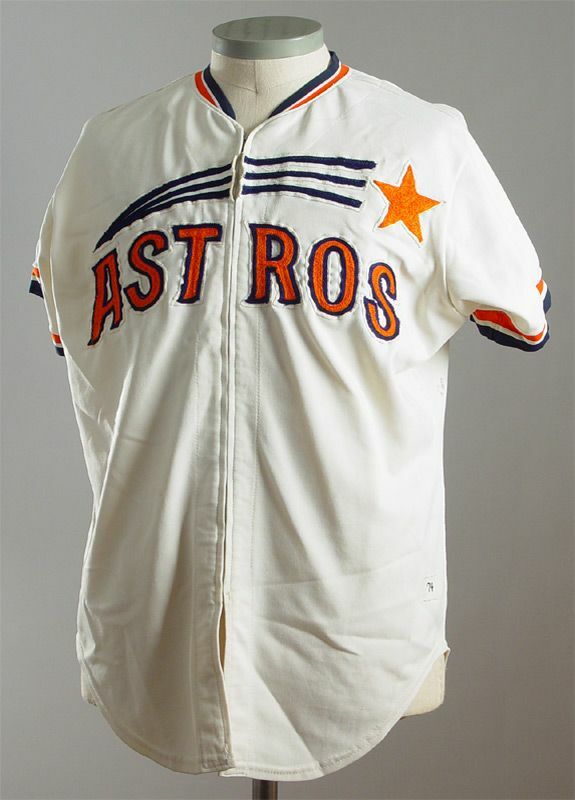 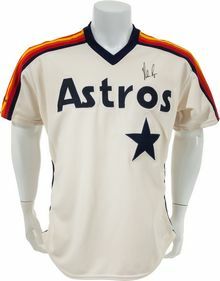 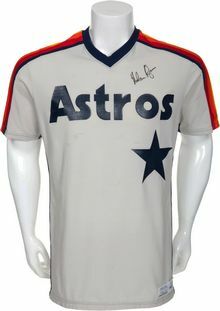 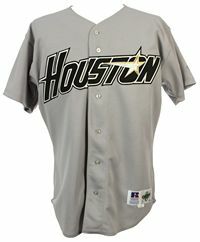 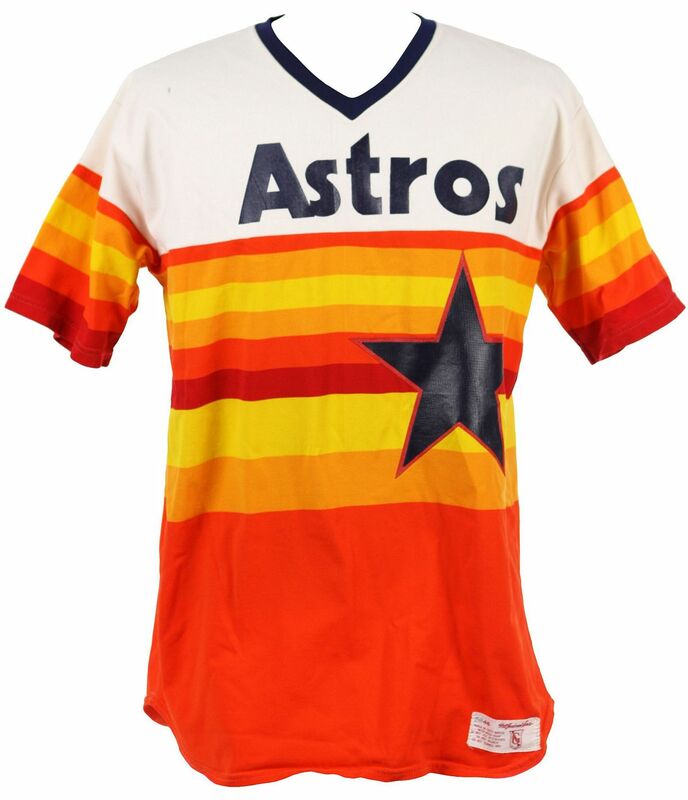 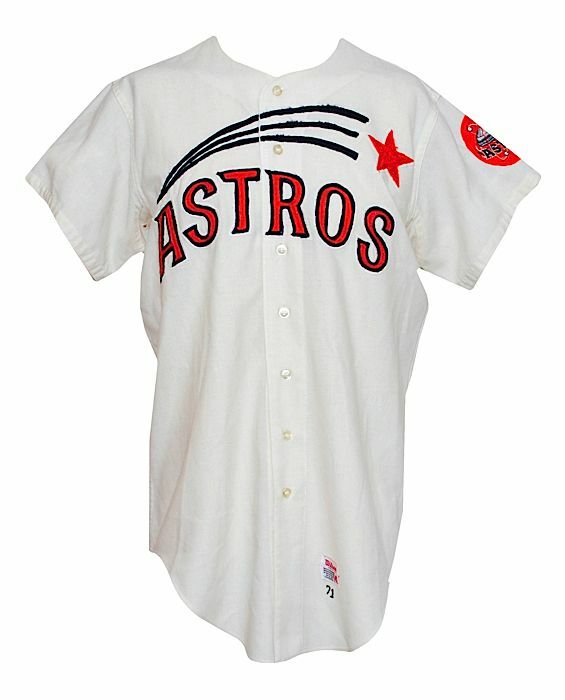 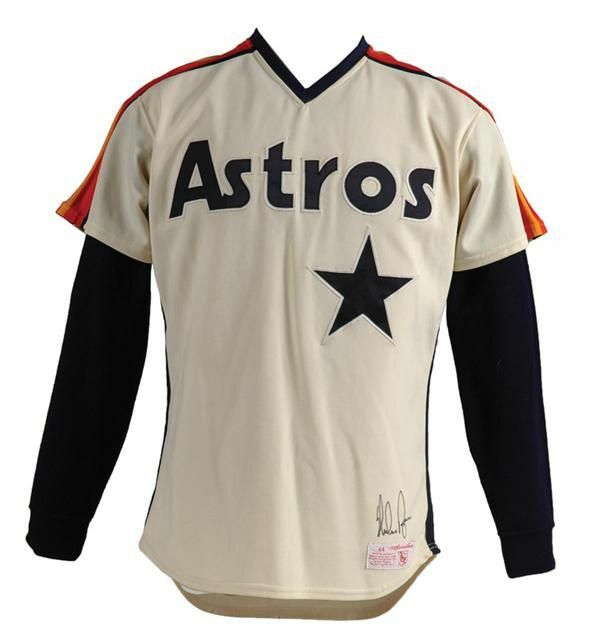 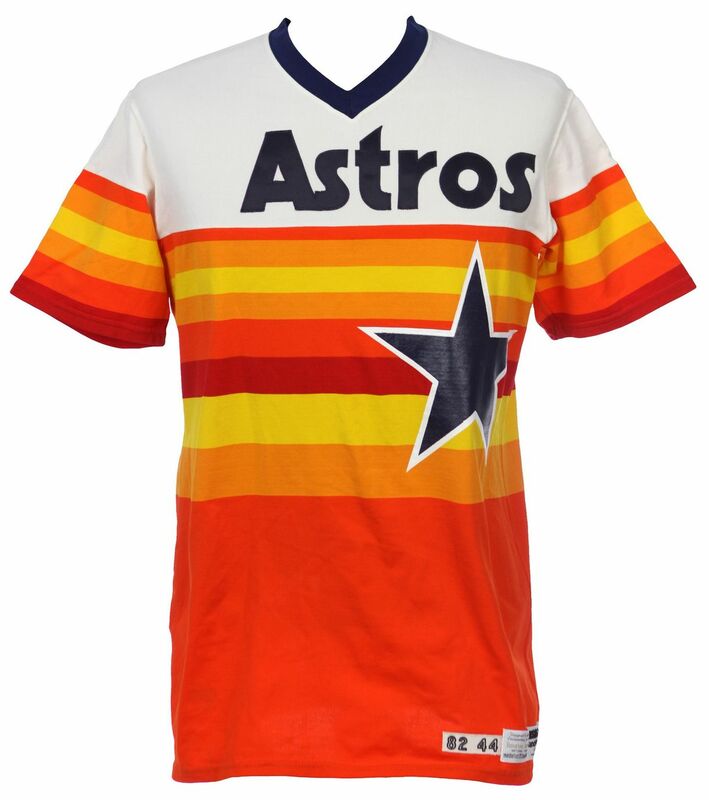 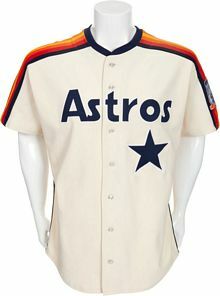 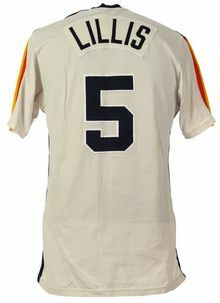 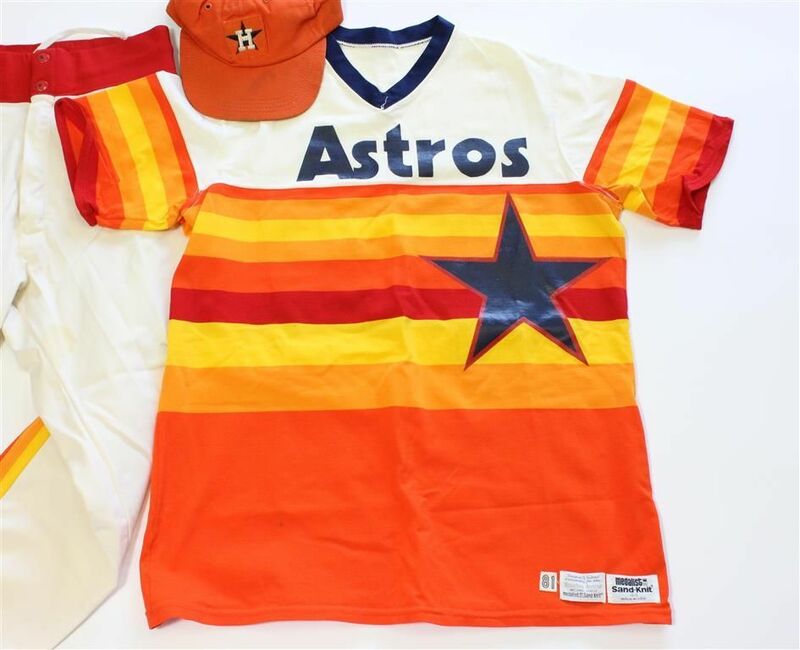 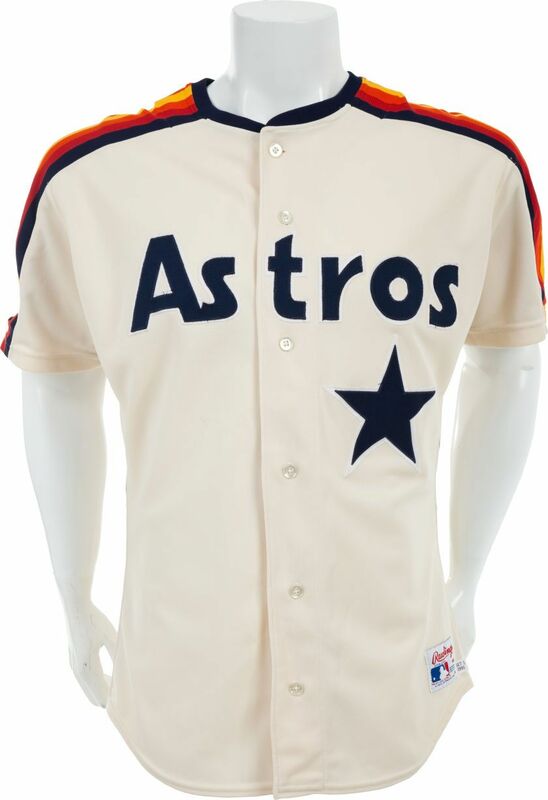 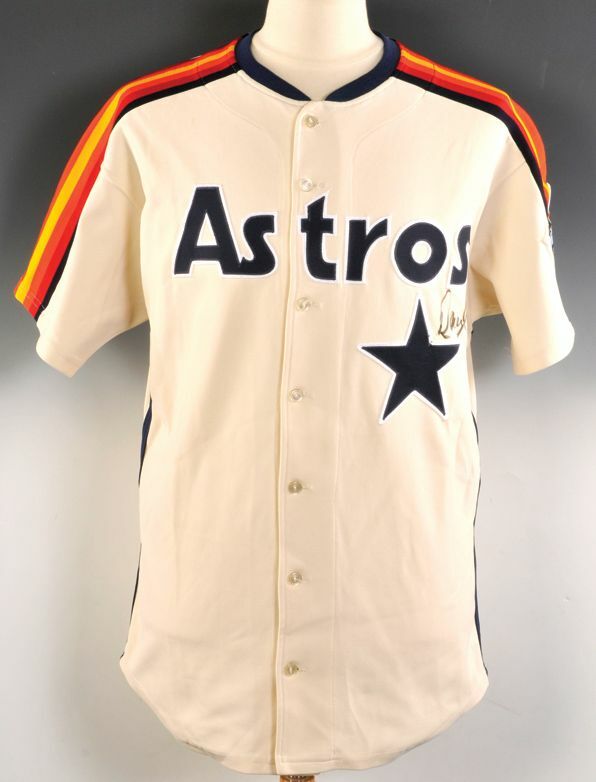 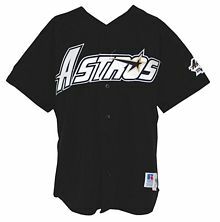 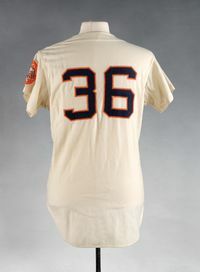 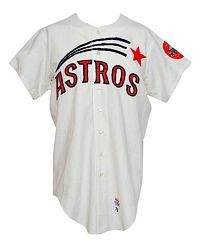 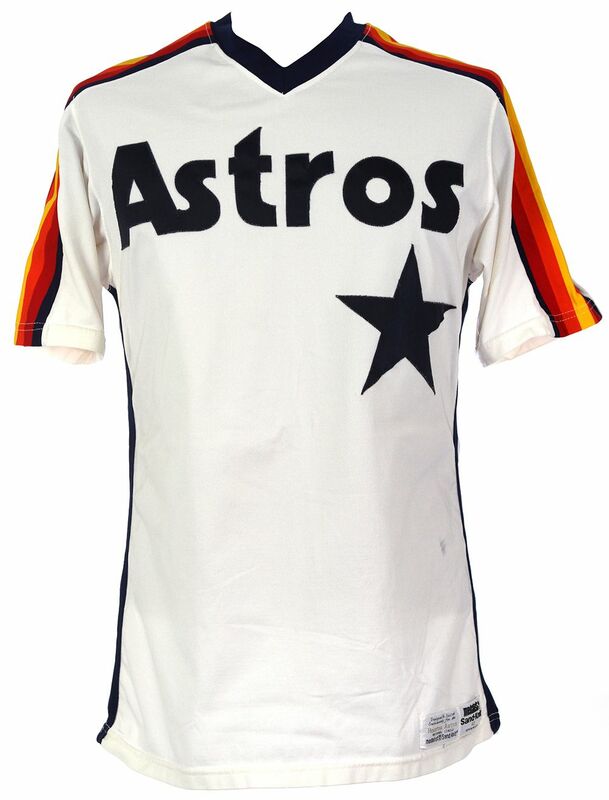 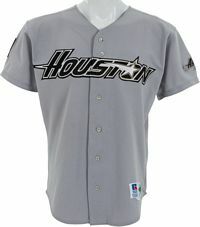 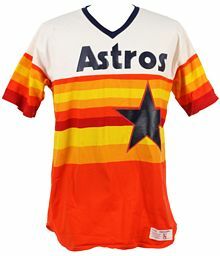 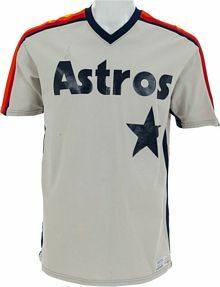 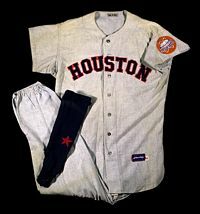 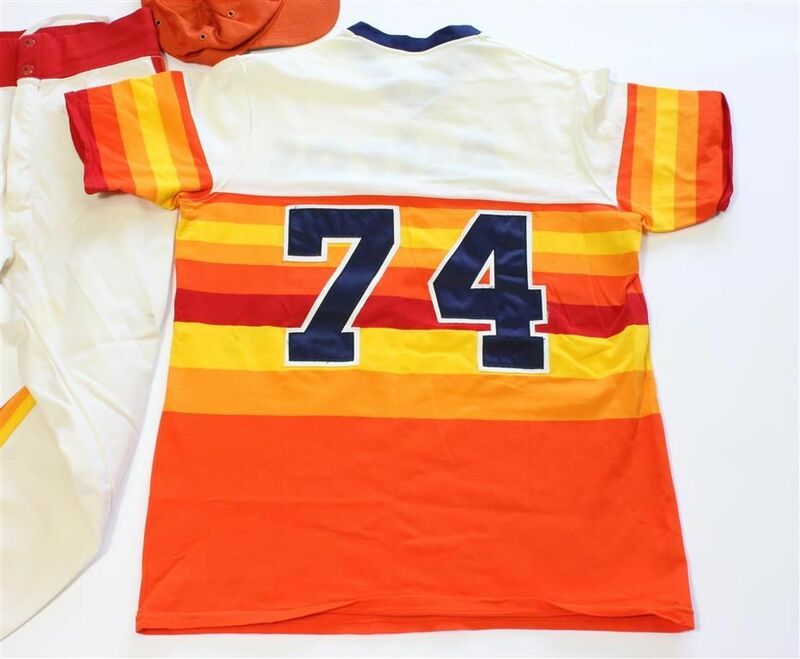 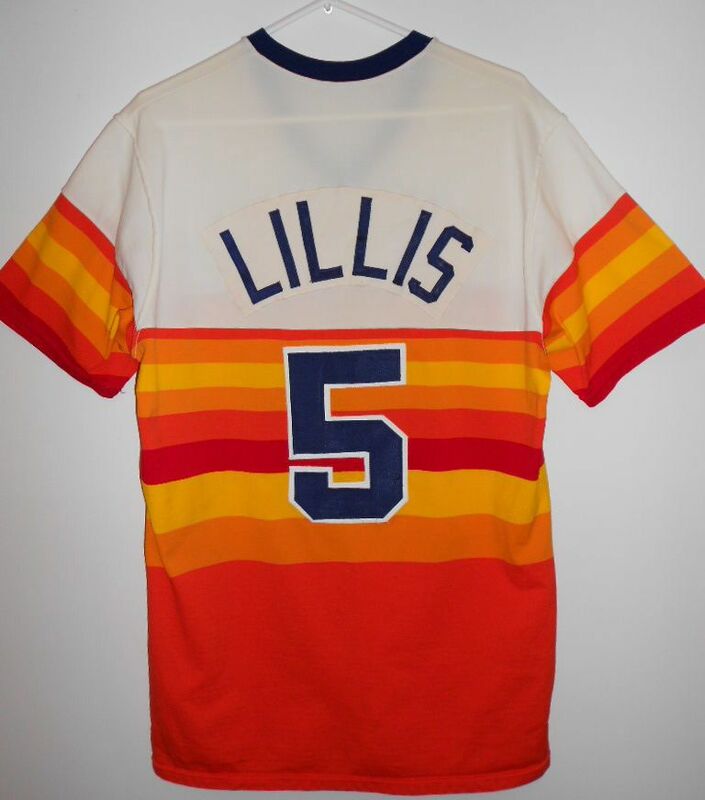 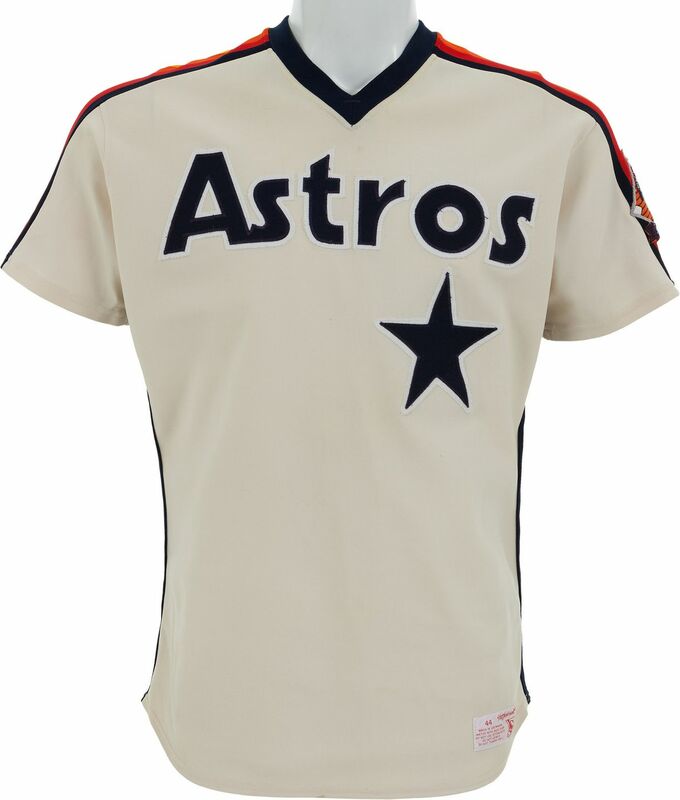 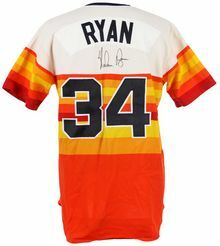 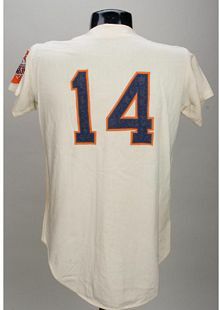 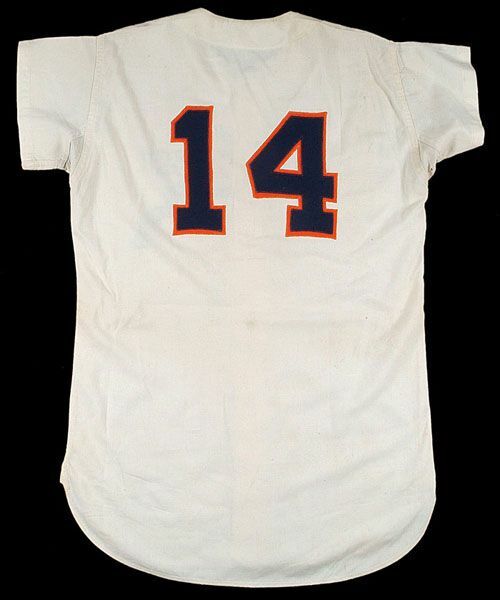 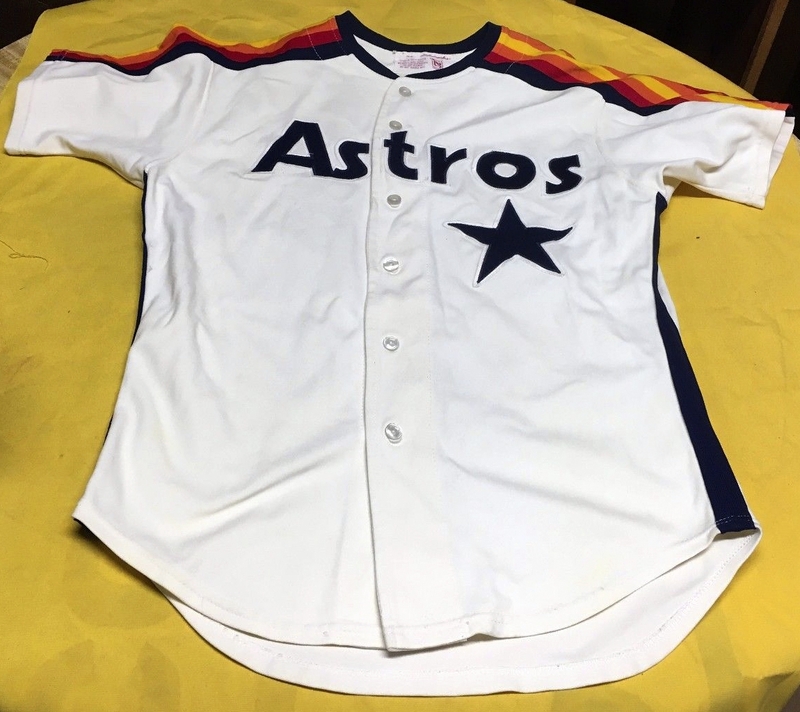 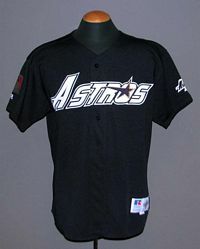 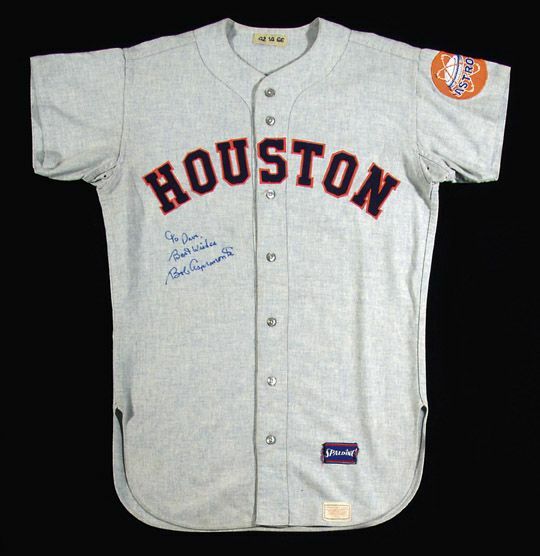 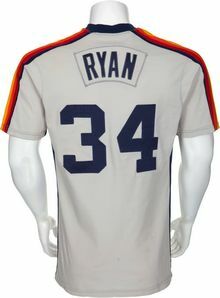 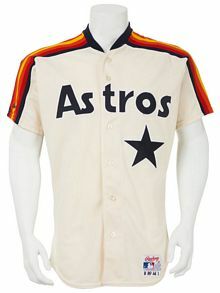 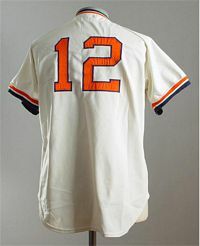 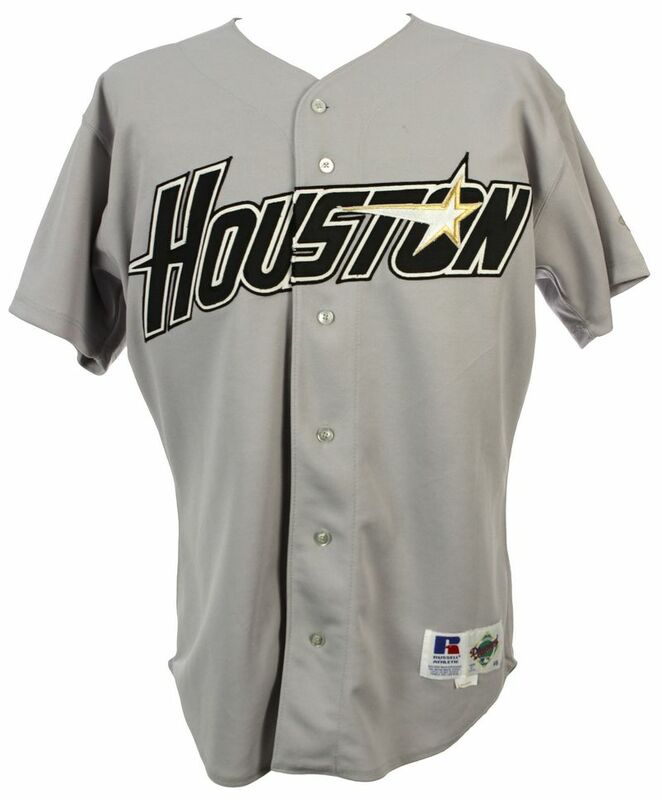 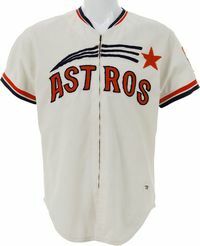 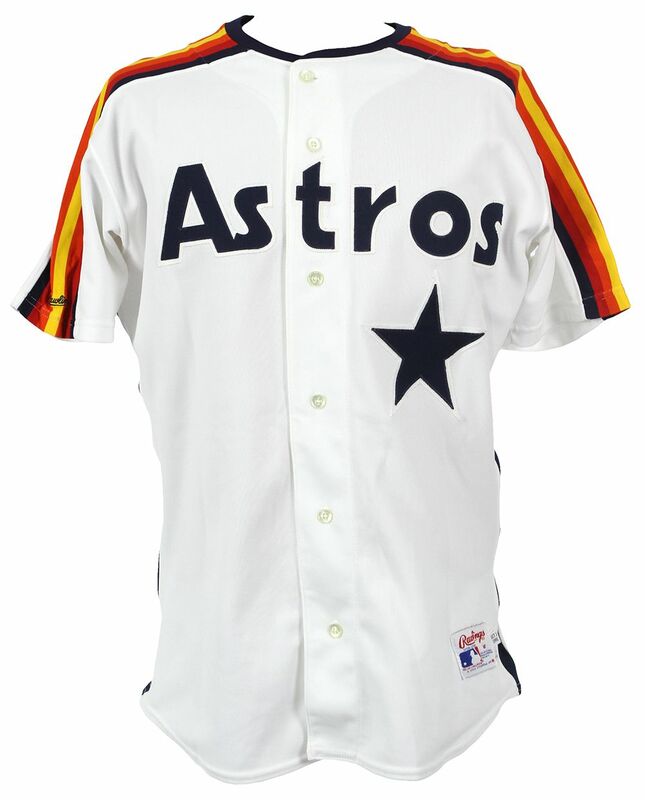 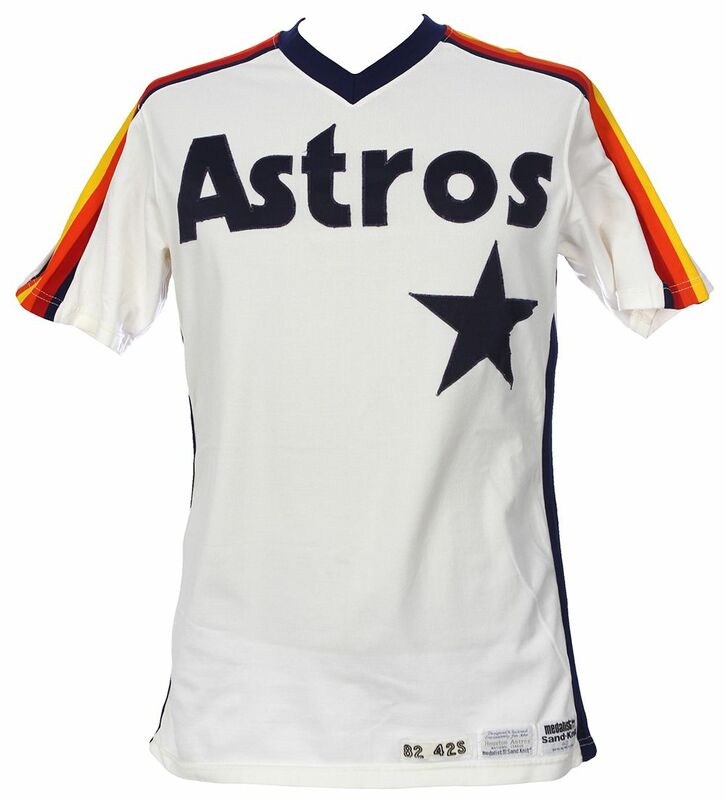 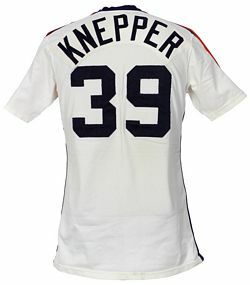 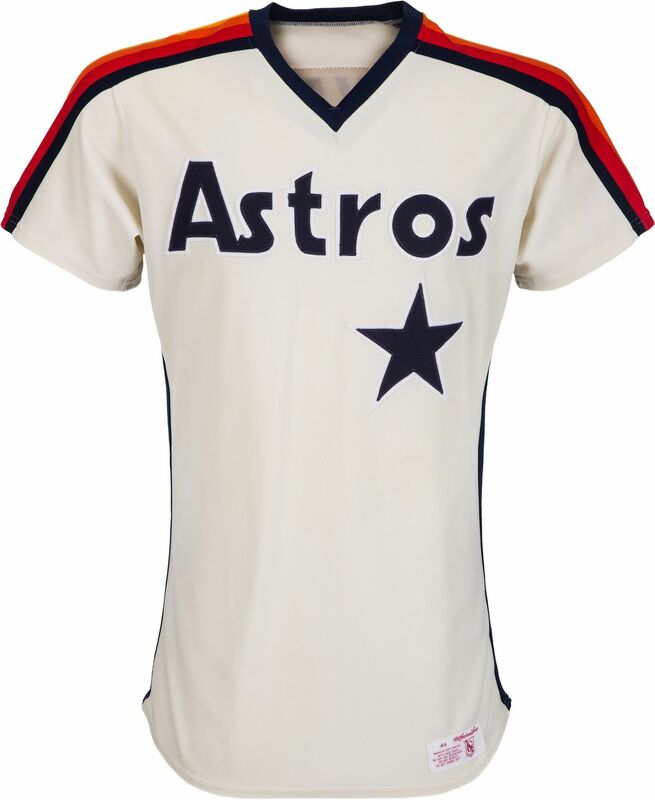 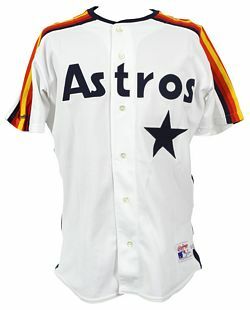 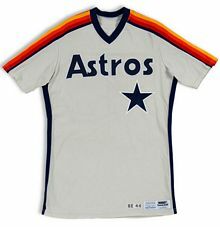 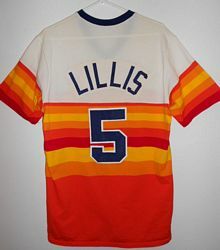 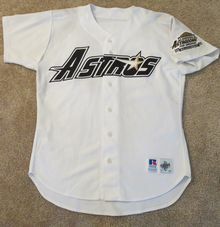 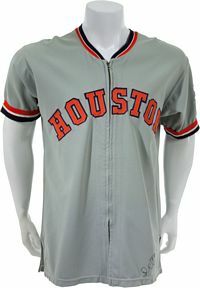 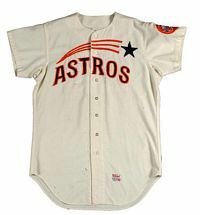 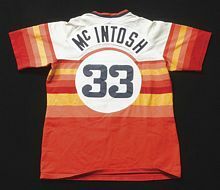 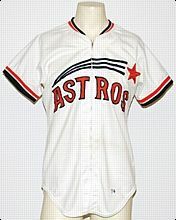 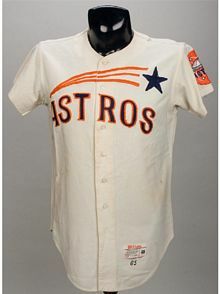 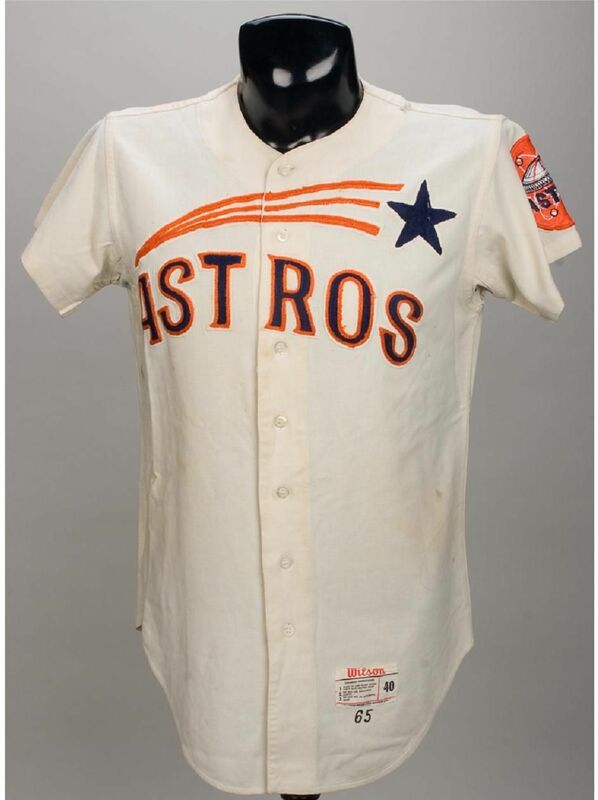 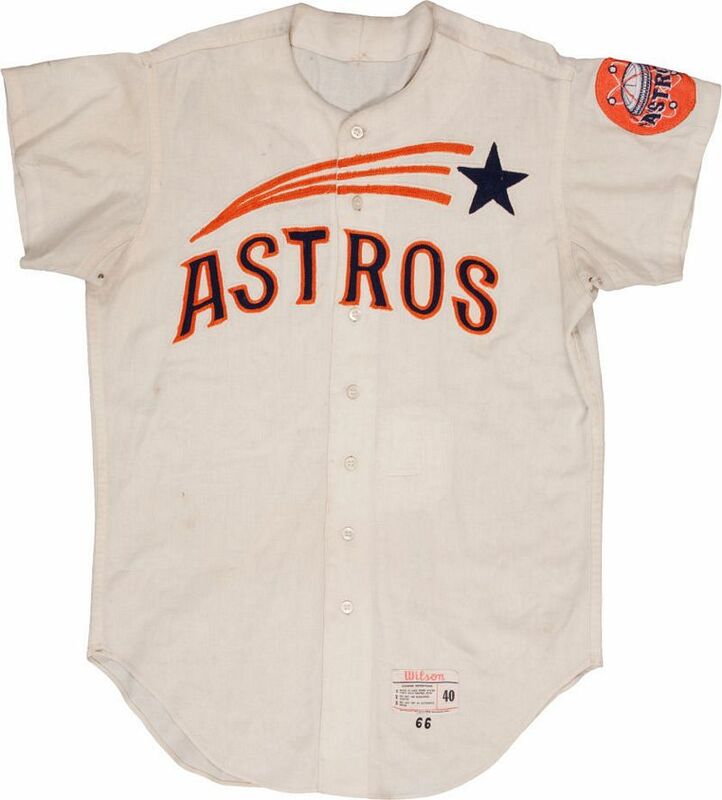 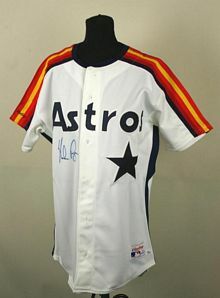 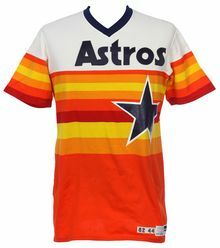 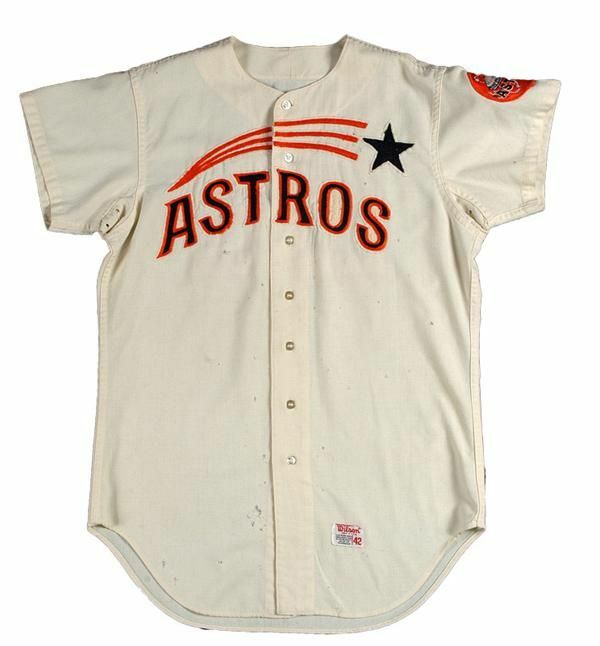 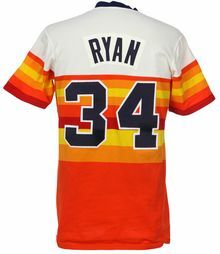 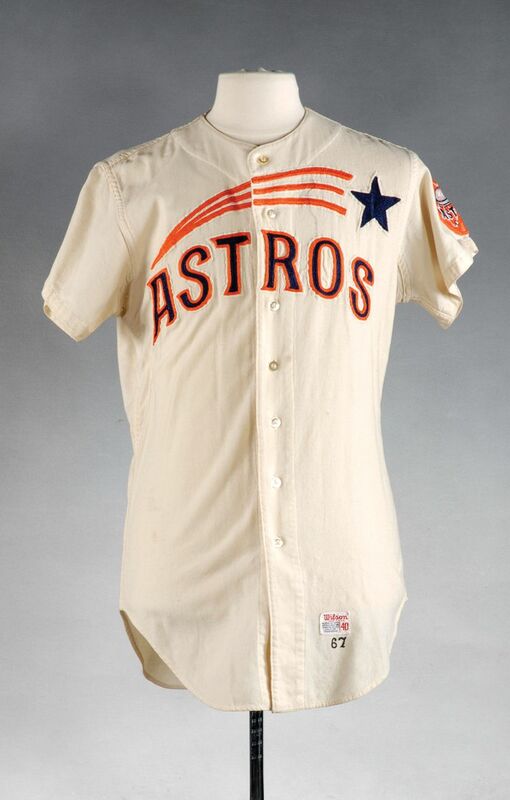 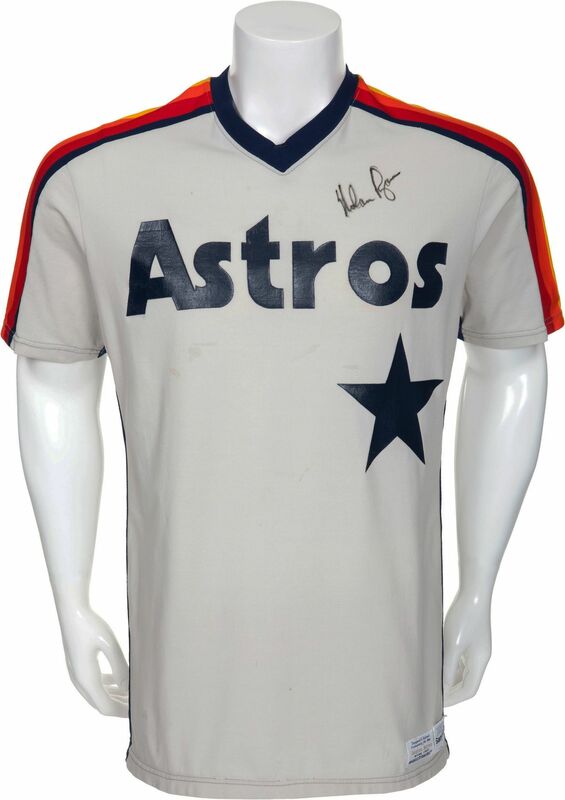 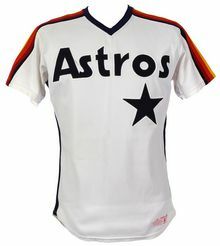 Embroiled in a dispute with Colt firearms, and moving into the new Astrodome, the team changes its name to Astros, and in turn creates one of the most classic home jerseys ever seen in MLB. 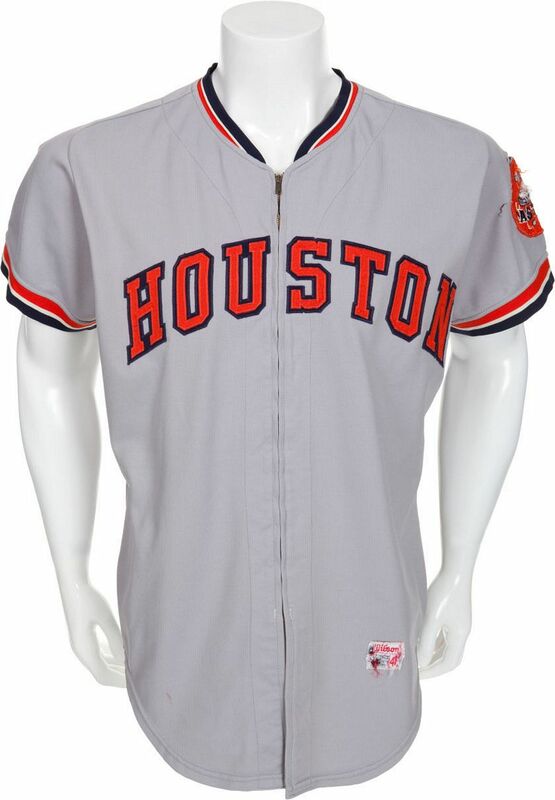 Road jerseys don't change except for the Astros patch replacing the Texas flag. Blue and orange are swapped. NOB added. 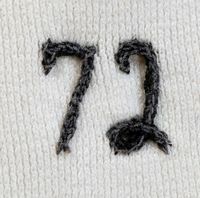 The team moves to double knit with zippers. 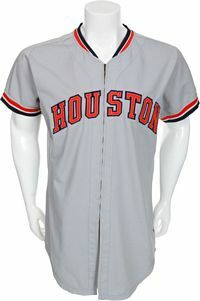 Other than adding trim on the collar and sleeves the look is the same. 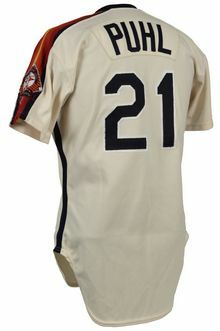 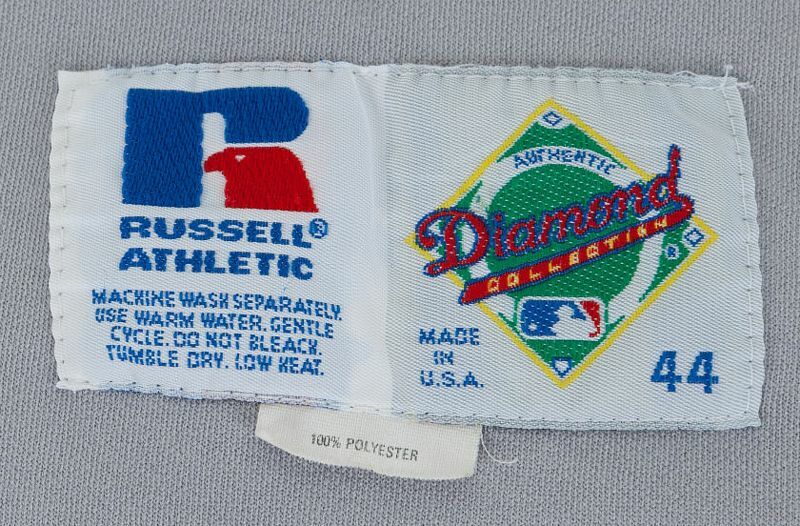 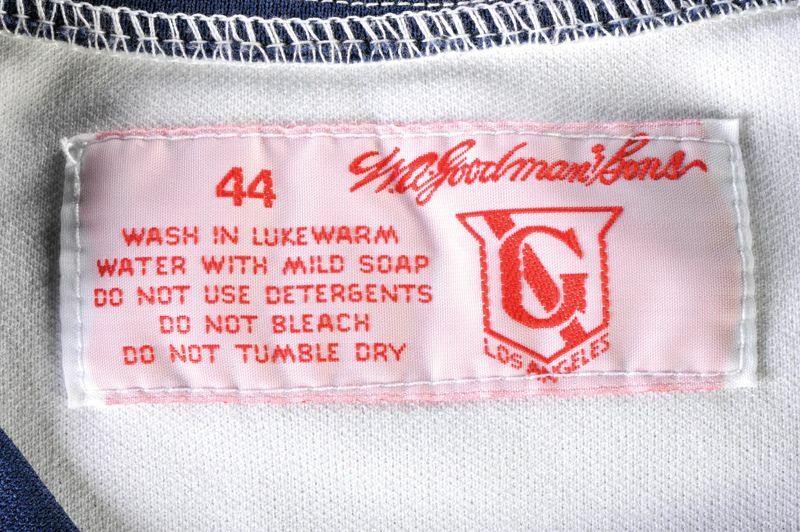 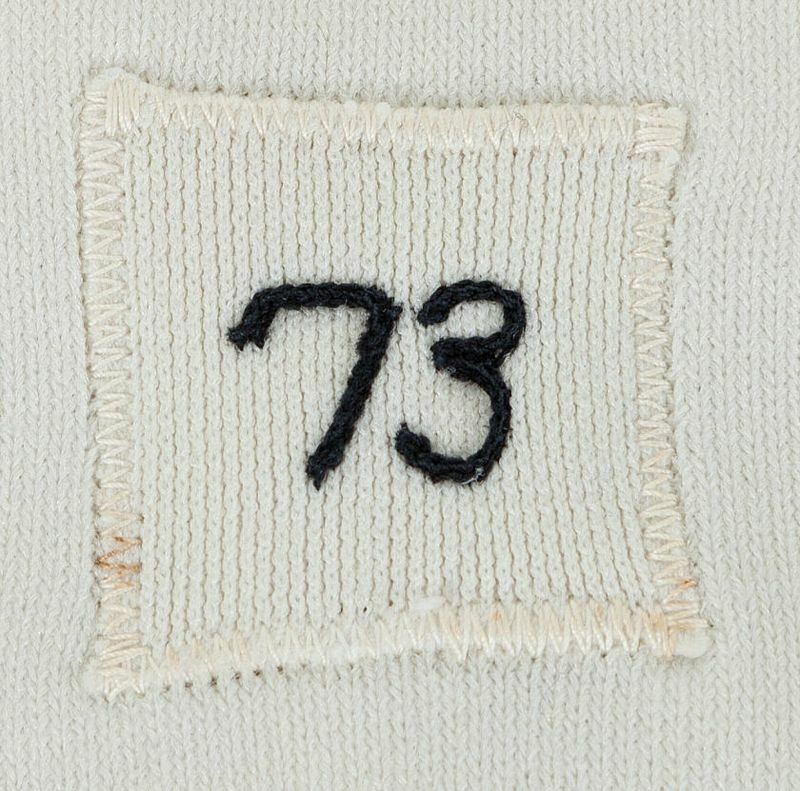 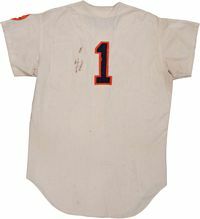 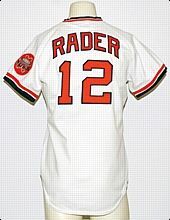 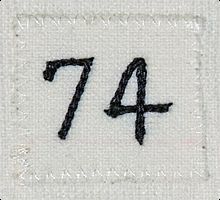 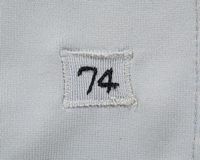 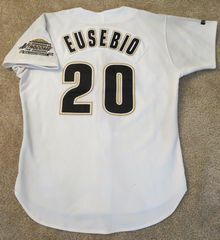 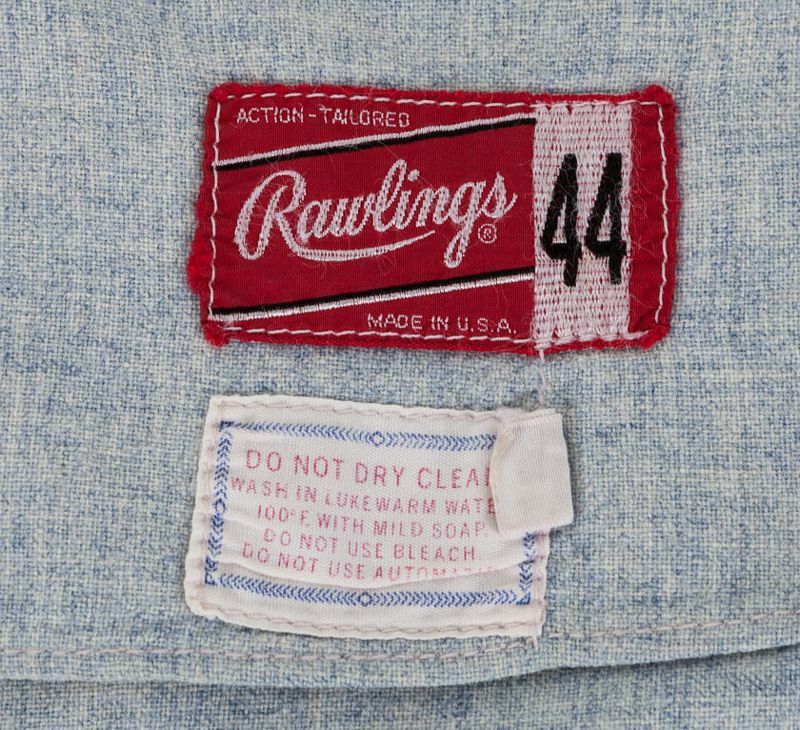 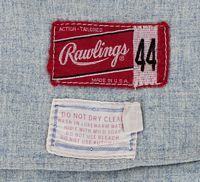 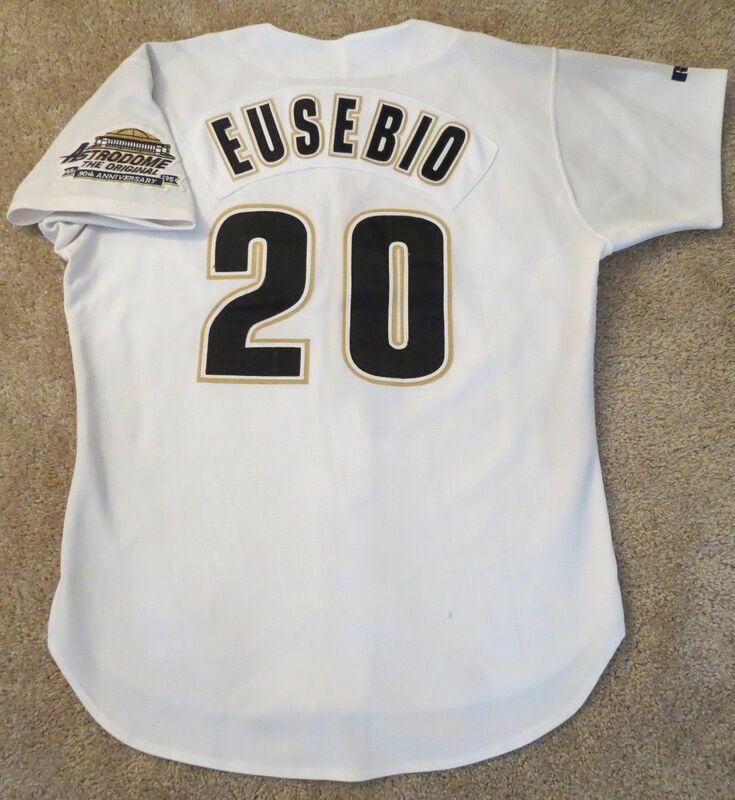 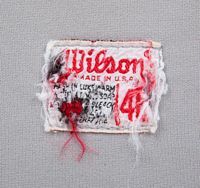 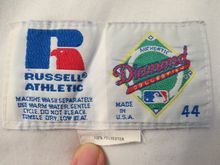 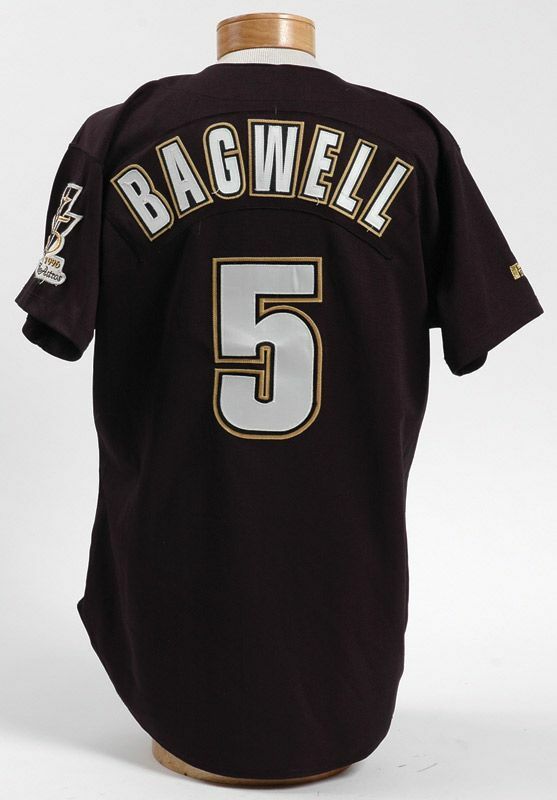 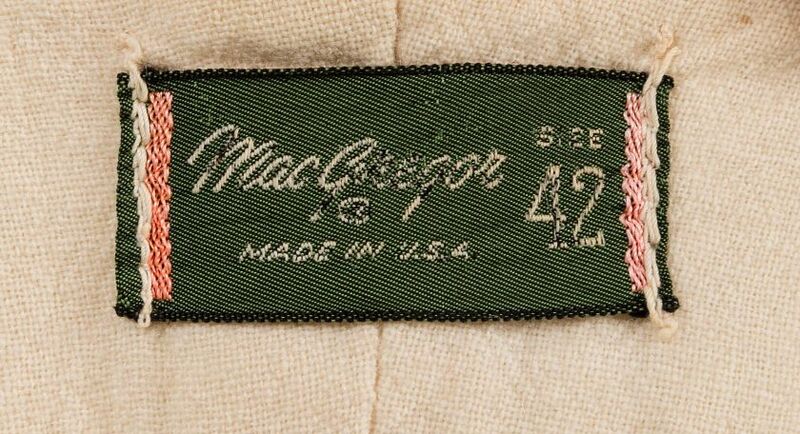 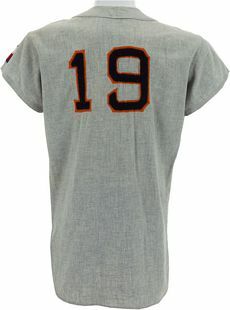 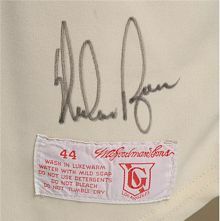 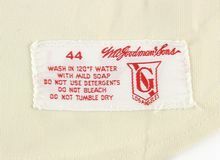 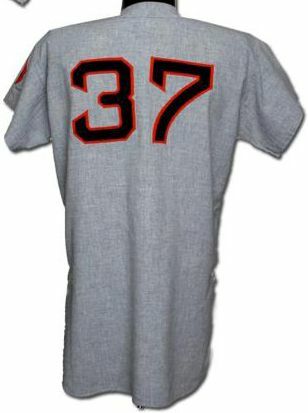 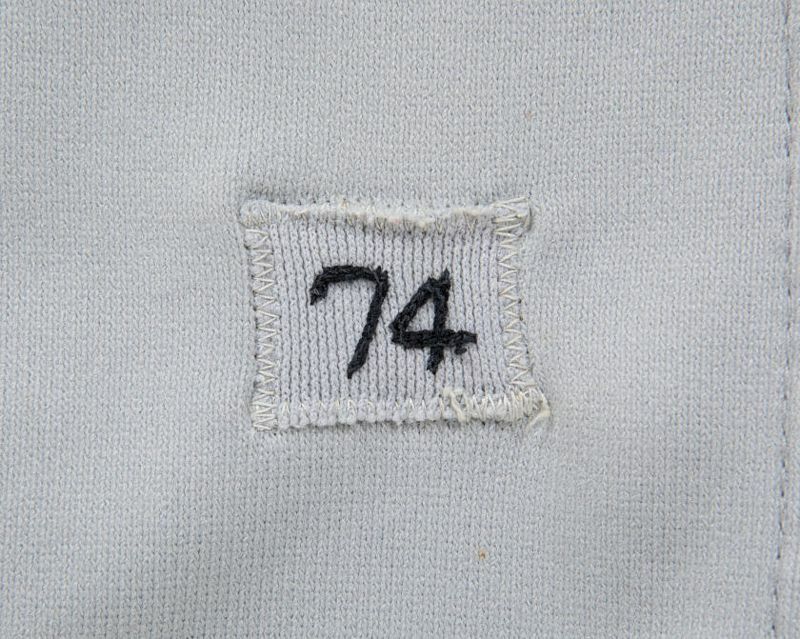 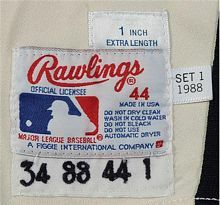 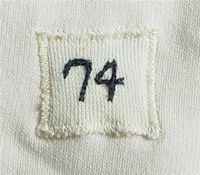 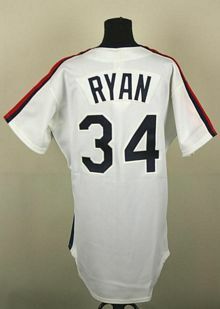 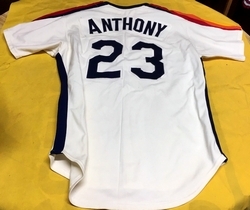 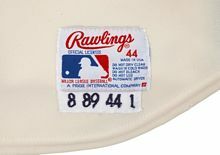 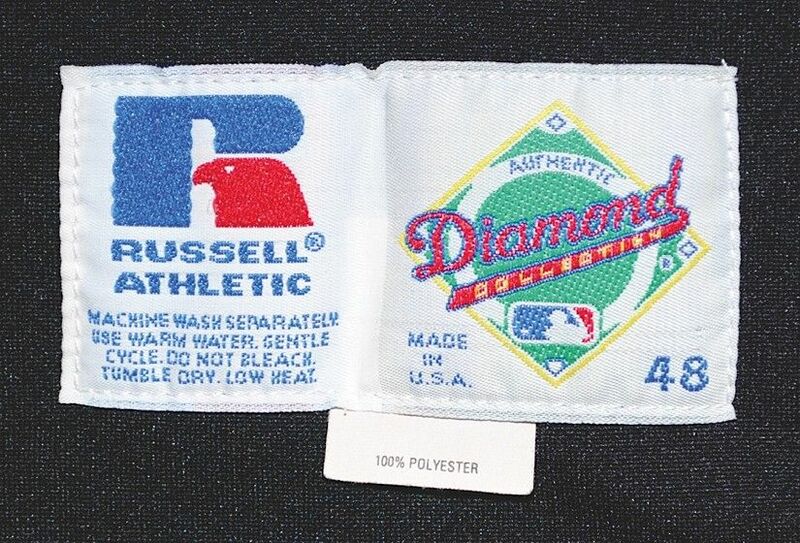 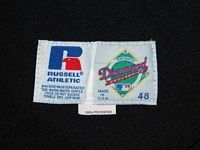 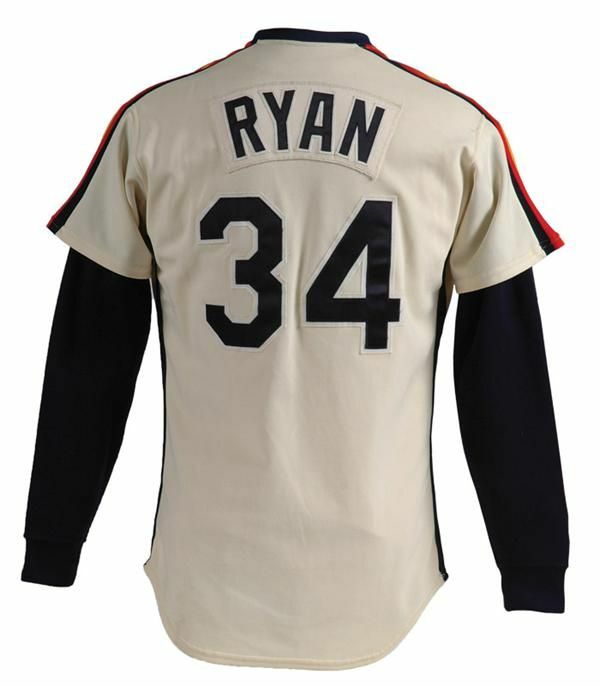 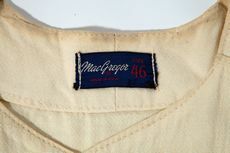 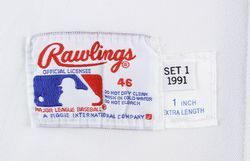 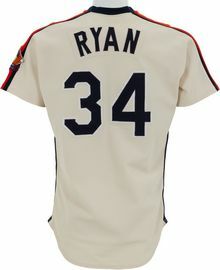 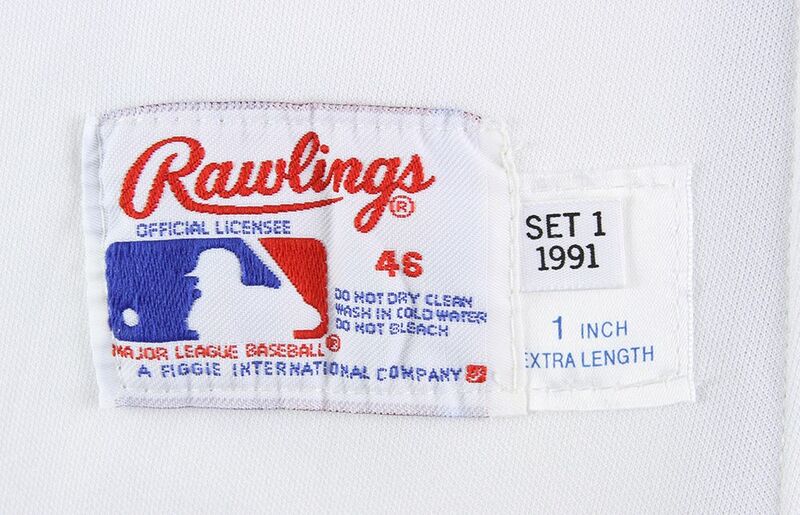 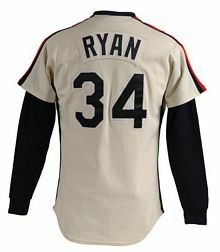 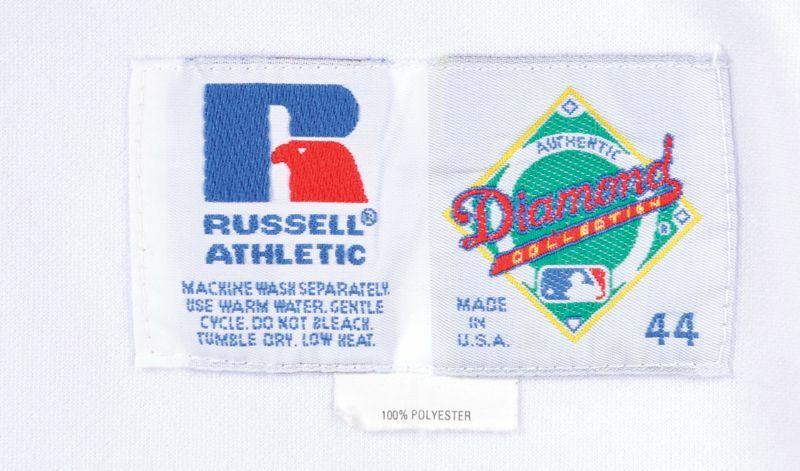 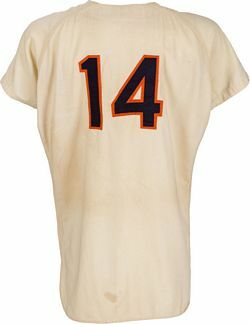 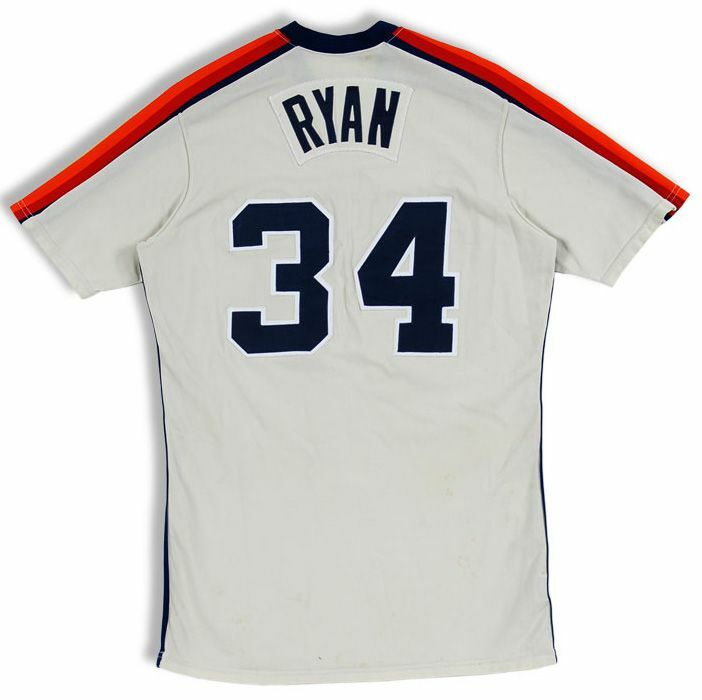 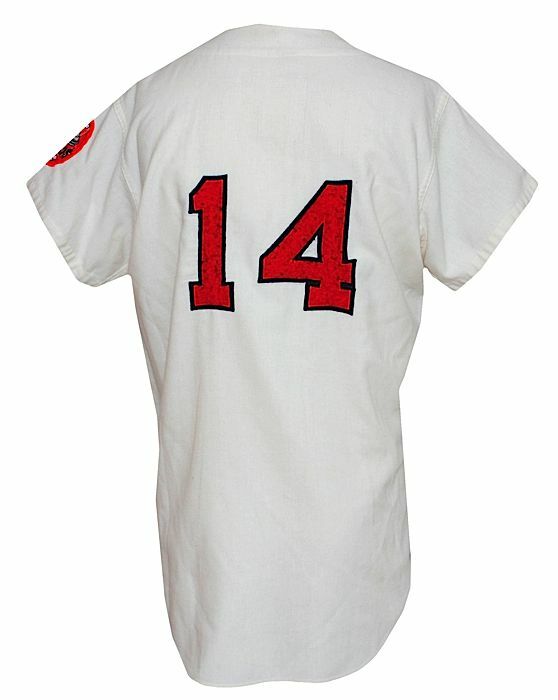 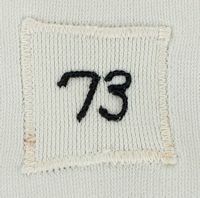 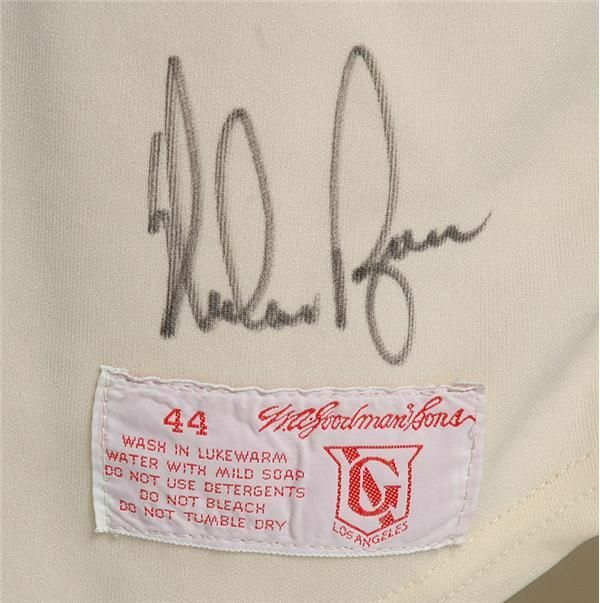 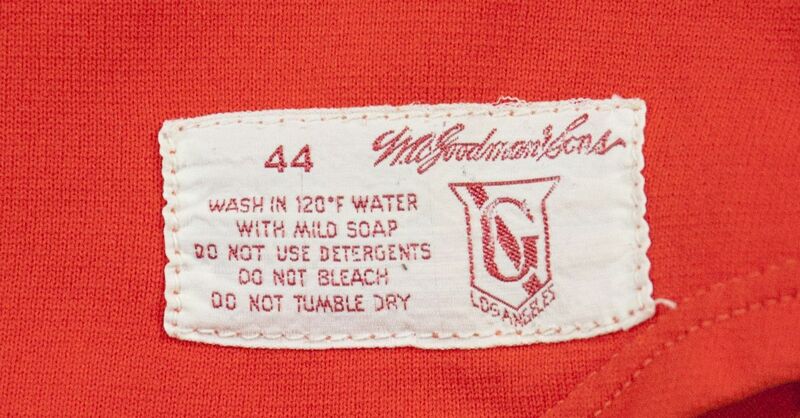 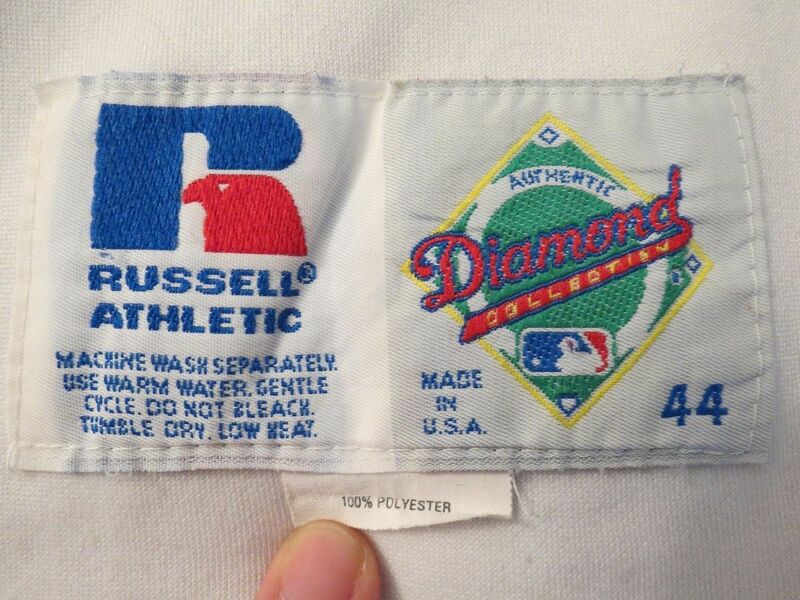 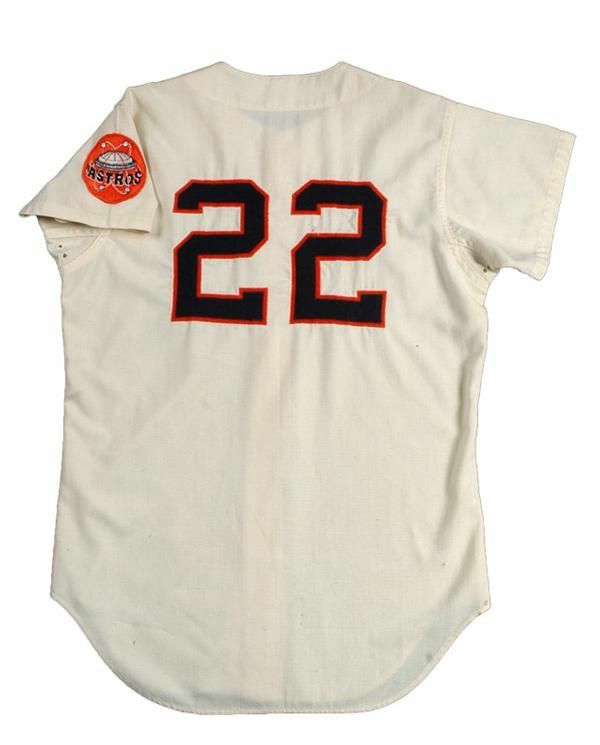 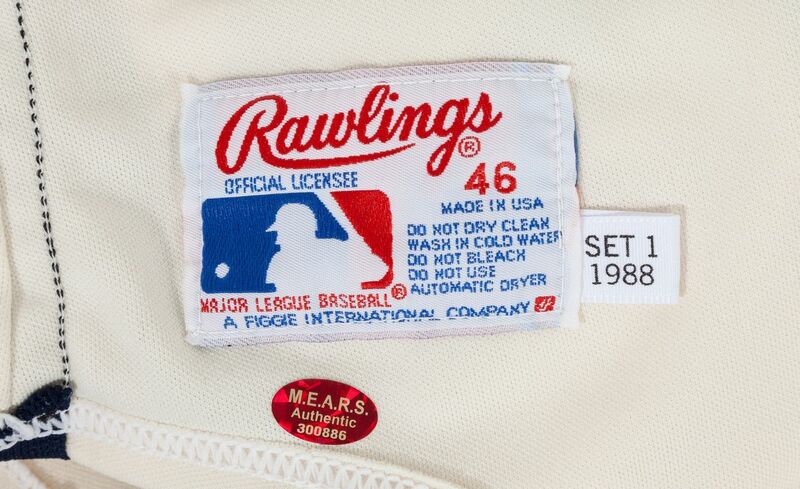 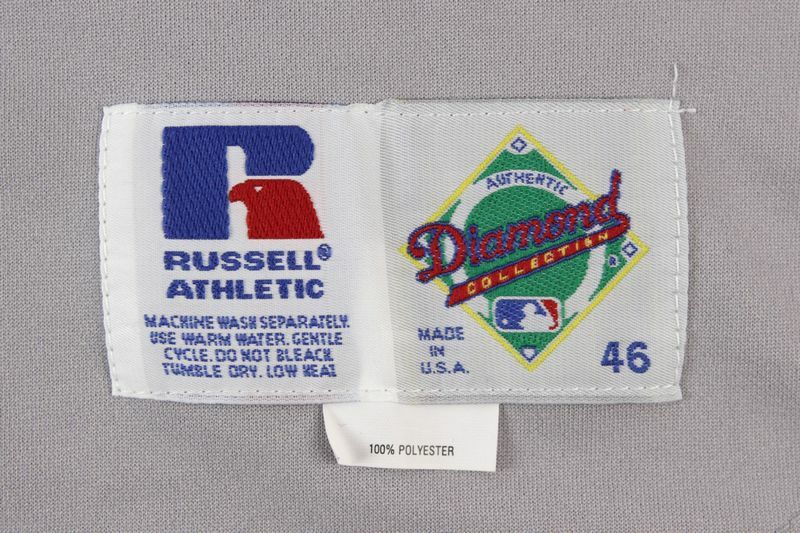 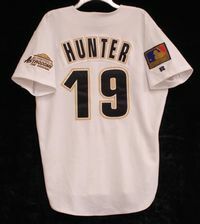 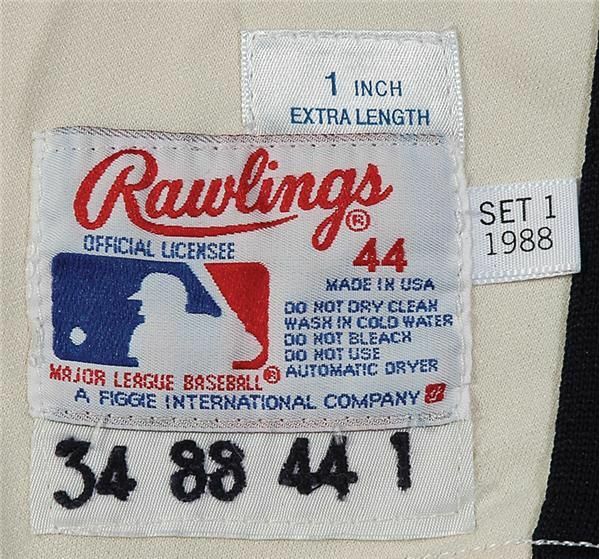 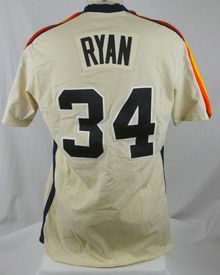 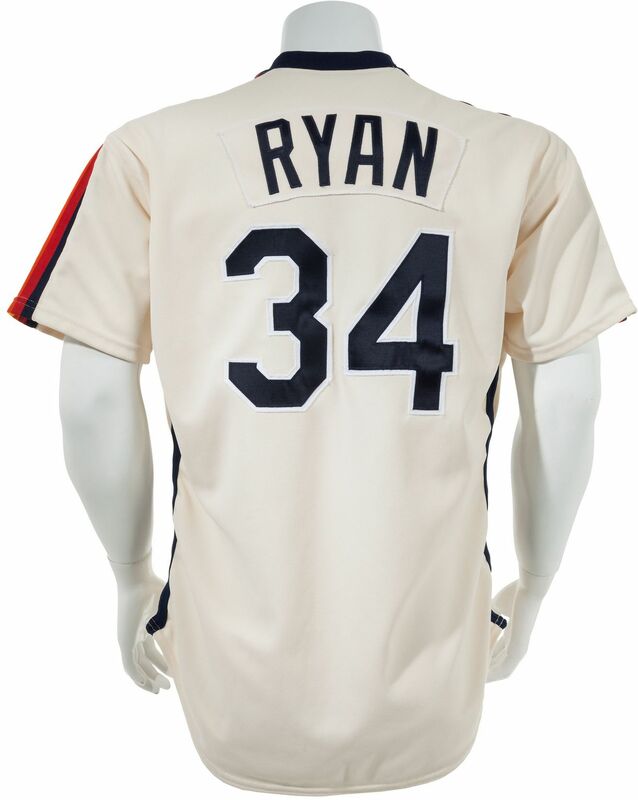 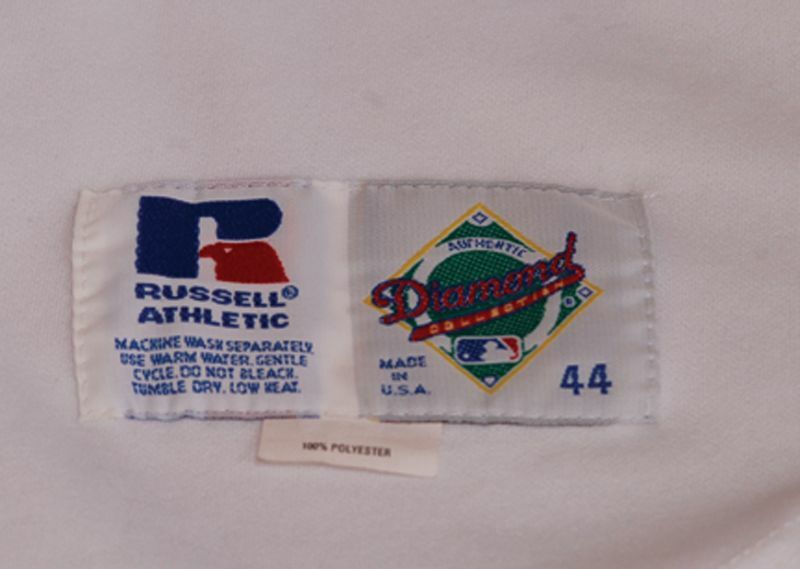 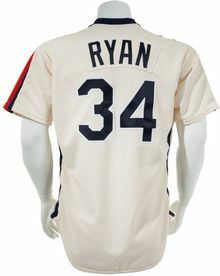 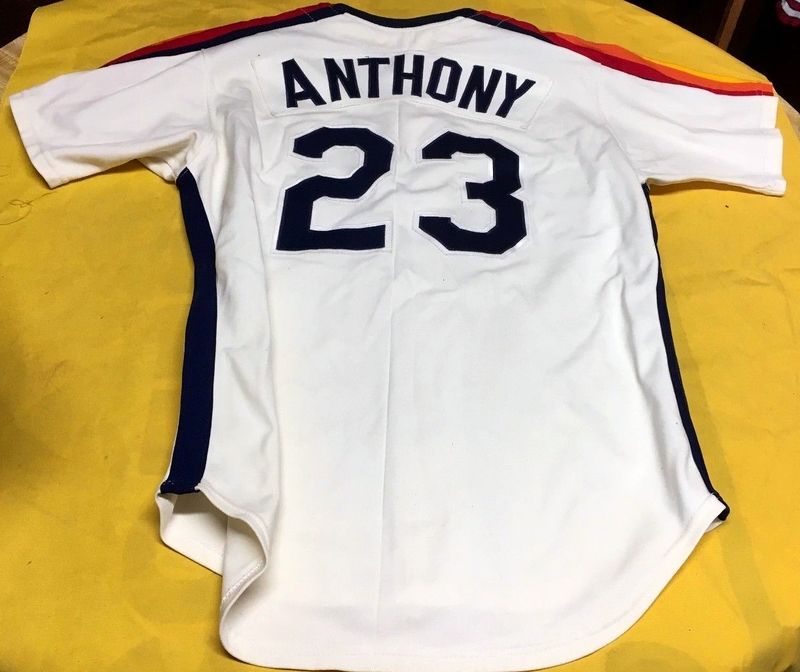 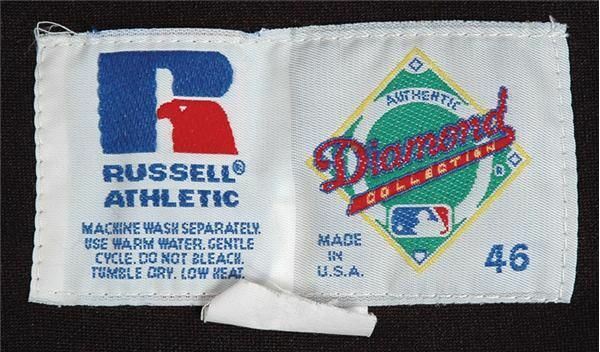 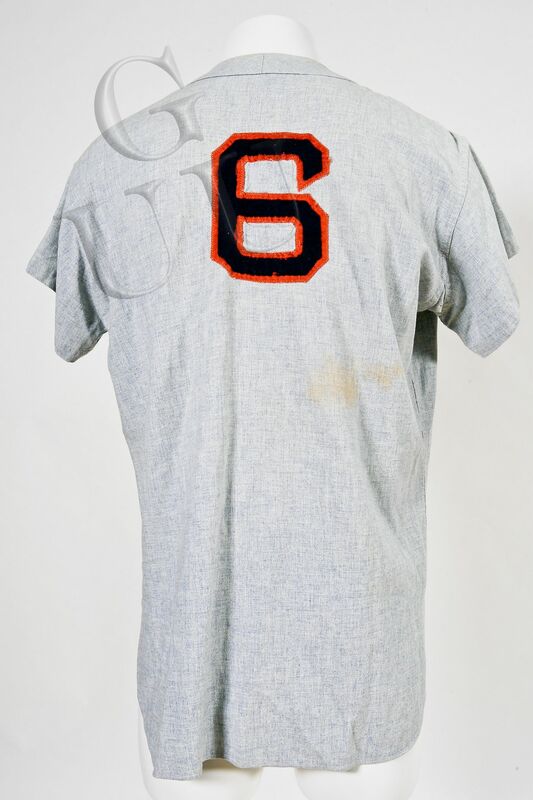 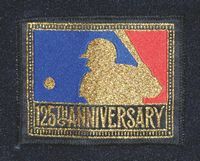 A different sleeve patch is worn only on the road jersey (the home jersey sleeve patch was NOT changed, the HOF Database is wrong). 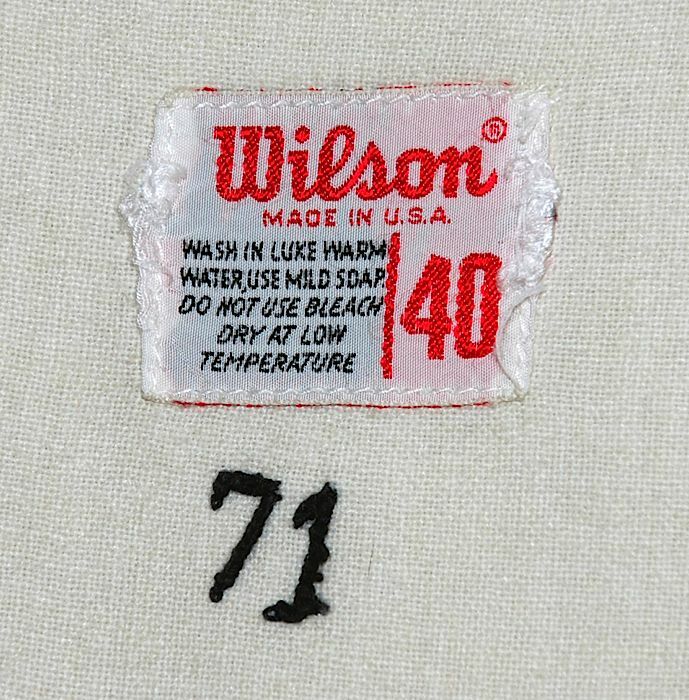 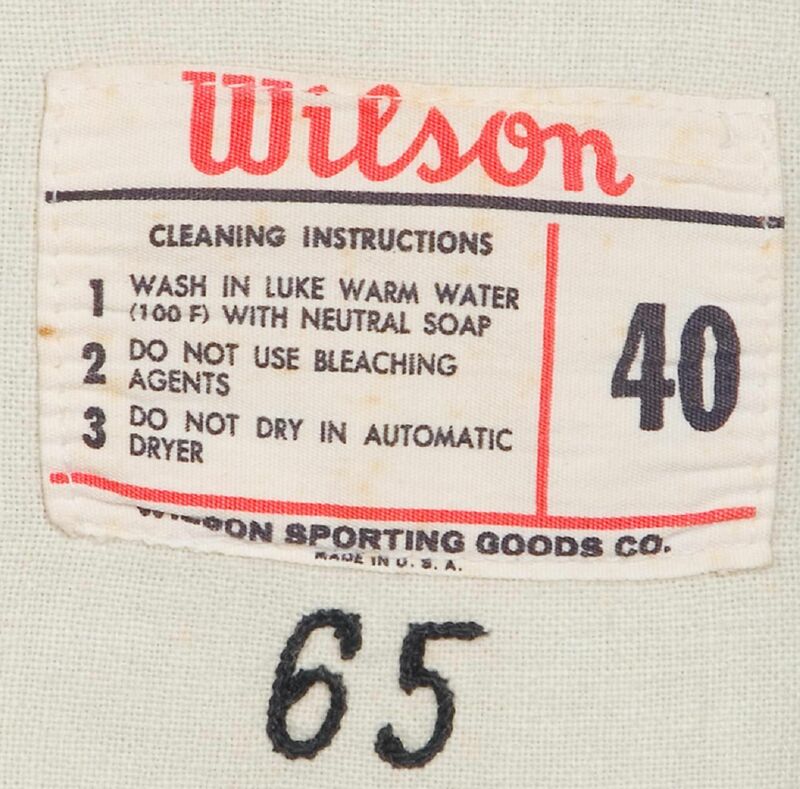 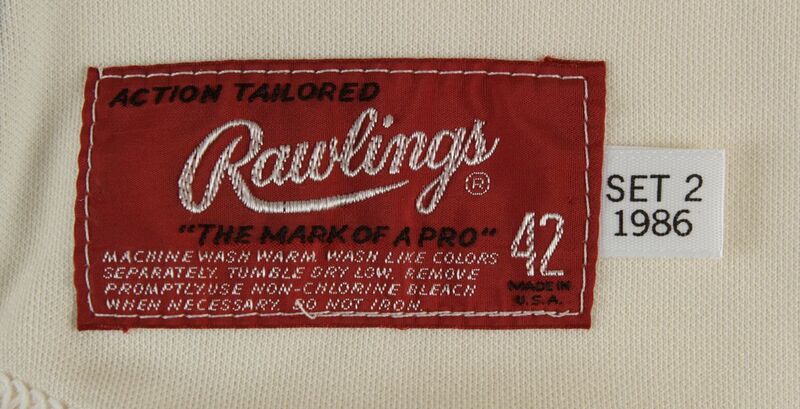 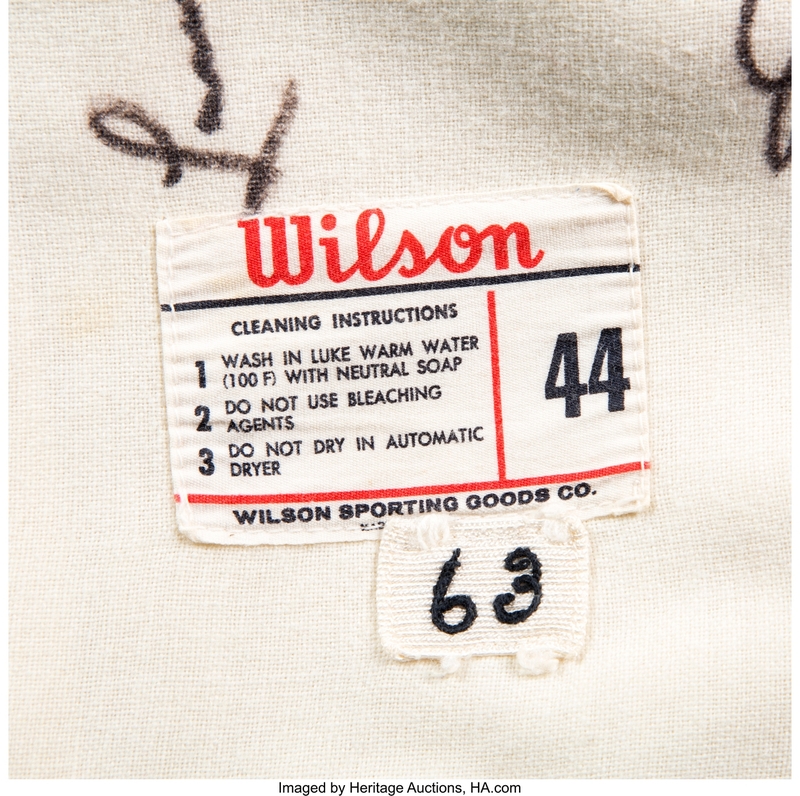 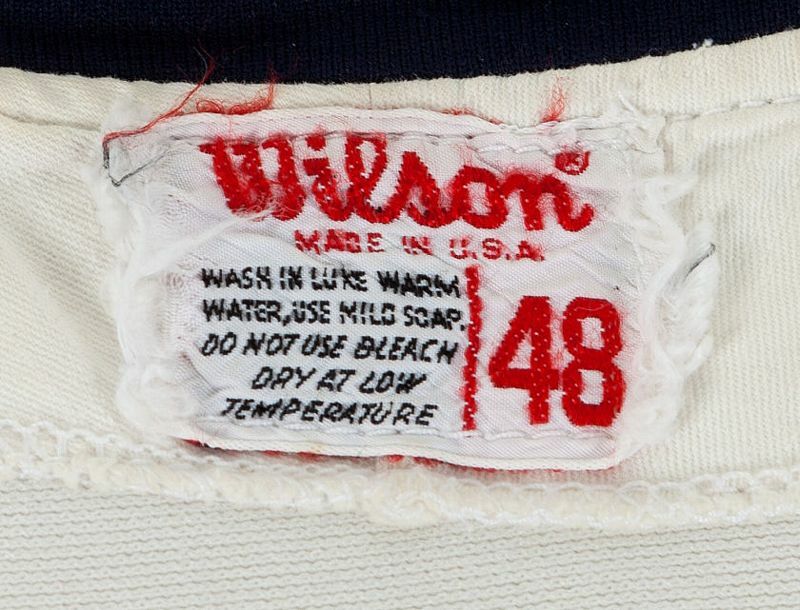 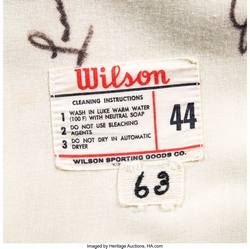 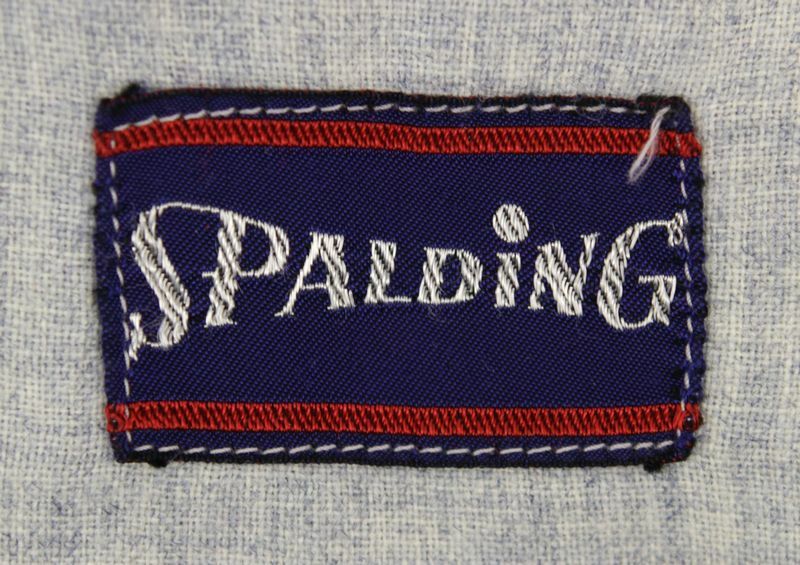 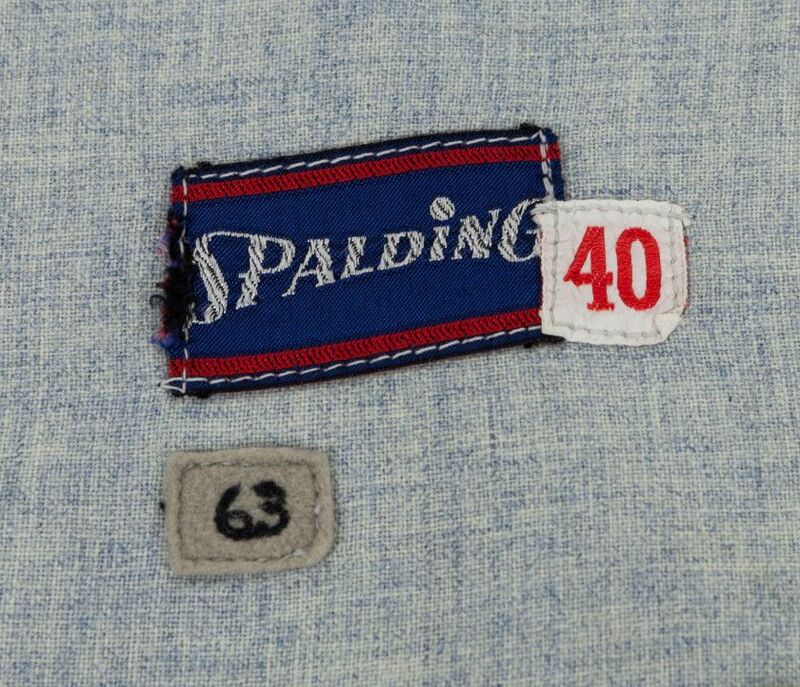 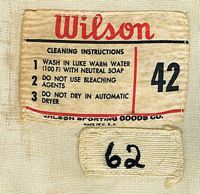 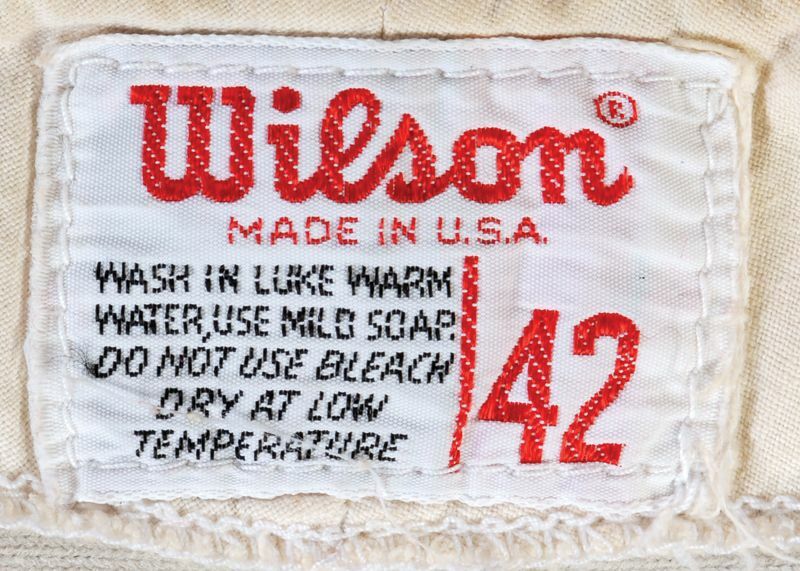 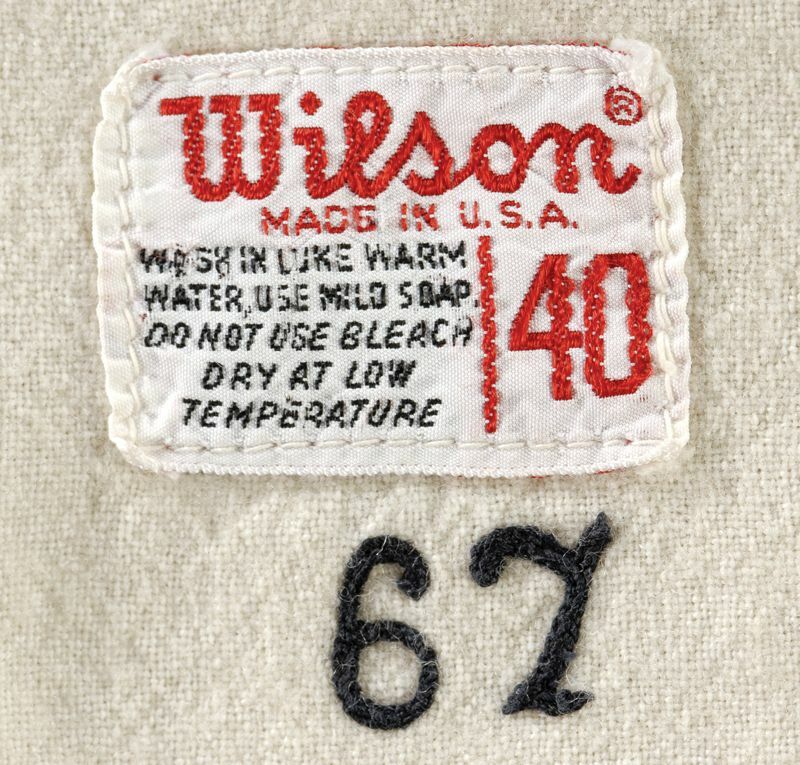 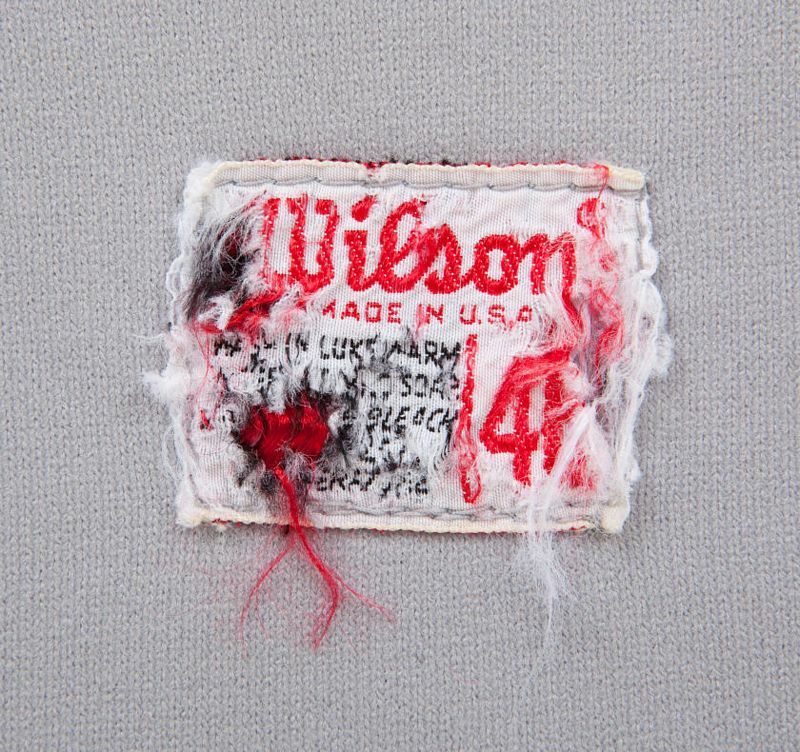 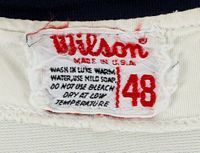 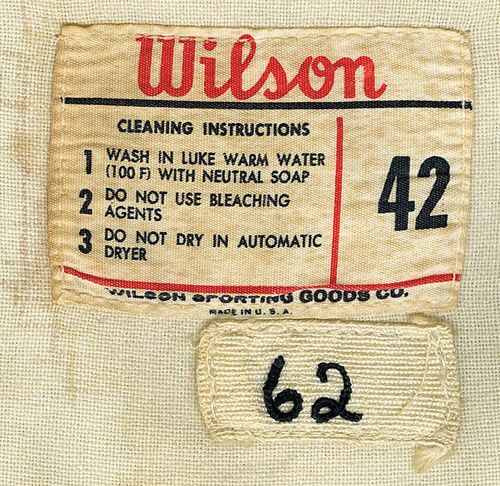 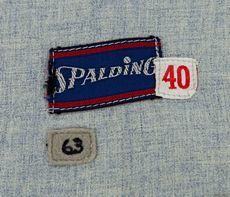 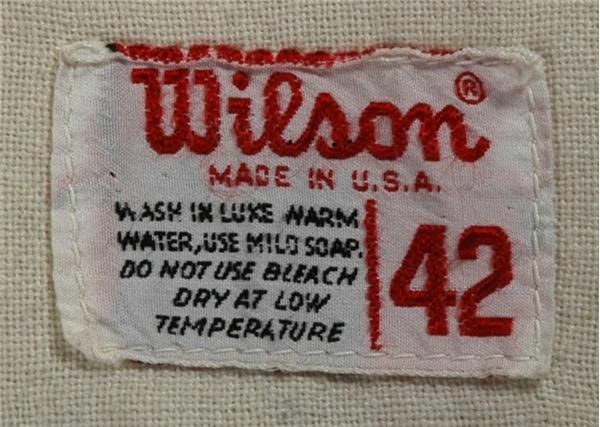 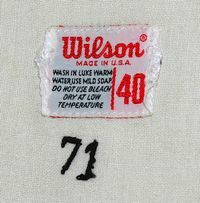 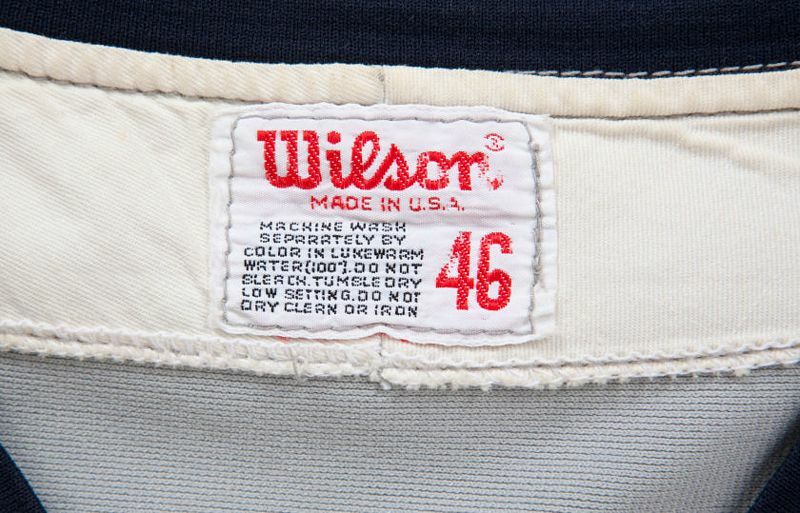 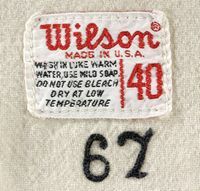 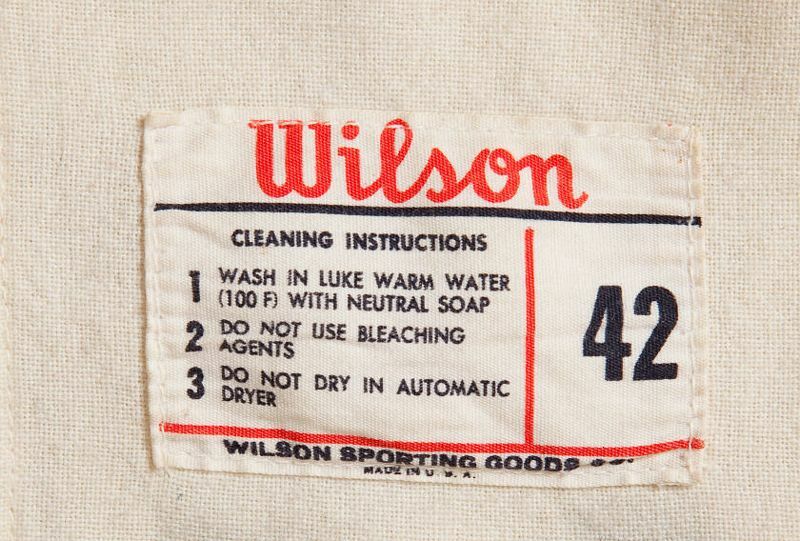 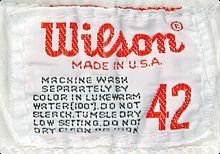 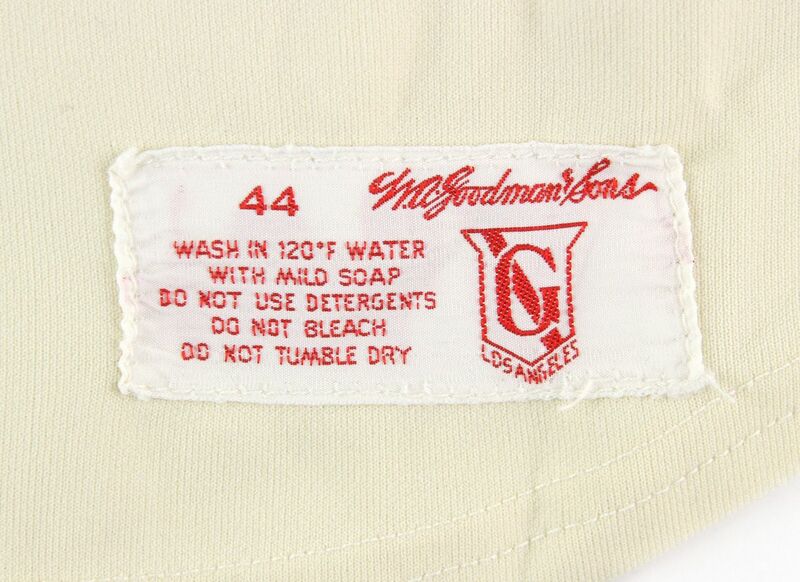 You can always tell Spalding knit jerseys by the thick sleeve stripes, much thicker than Wilson. That goes for all teams. 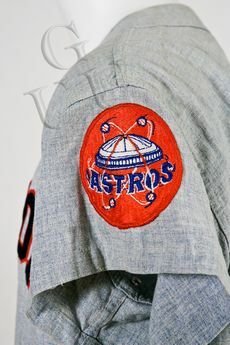 Sleeve patches are the same once again on both home and road uniforms. Home jersey NOB changed to orange with navy trim. NOB's are gone. 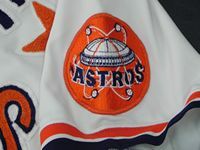 They were added back later in the season, at least on home jerseys. 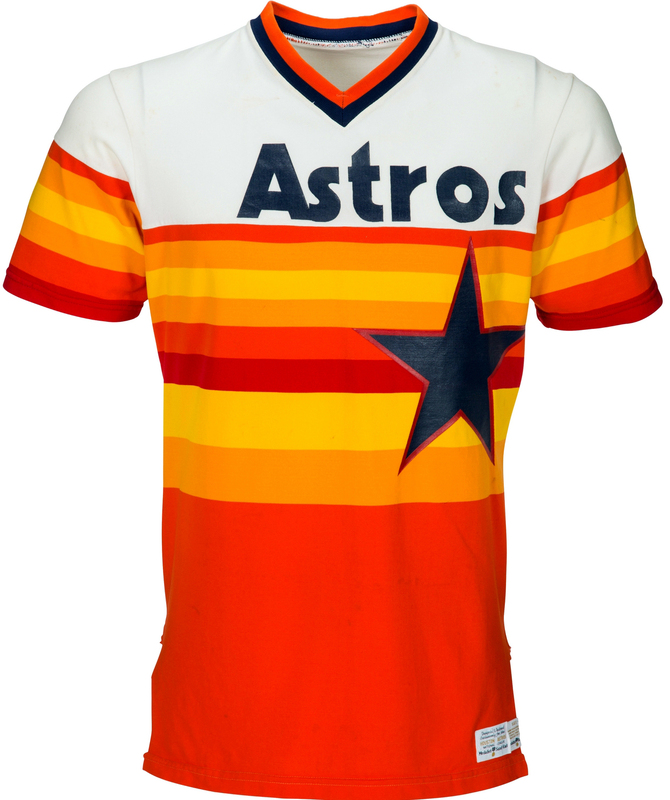 The rainbow jersey; no intoduction necessary. No need for separate home and road sets with these beauties. 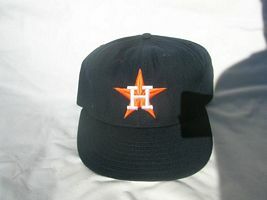 The cap gets brighter and turns nylon. 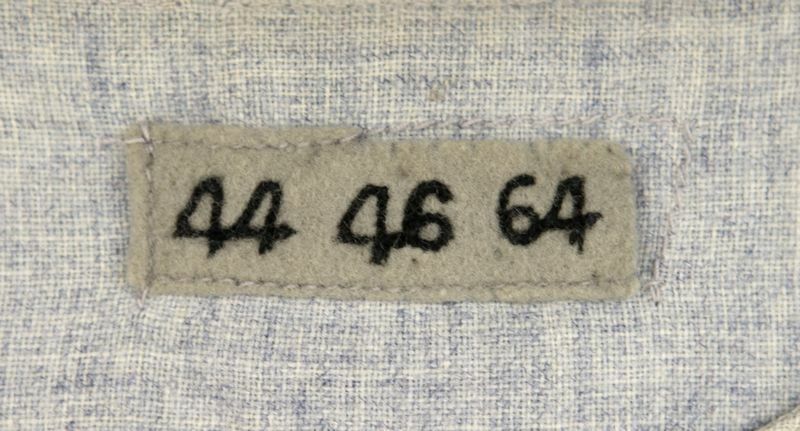 The back number returns to normal. The new owner's wife wanted them to tone it down, so a new light grey jersey debuts along with the return of the navy cap, now with a blue button. 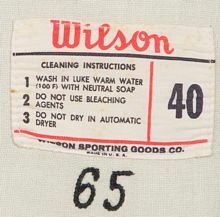 It's used on the road, as is the rainbow jersey occasionally. 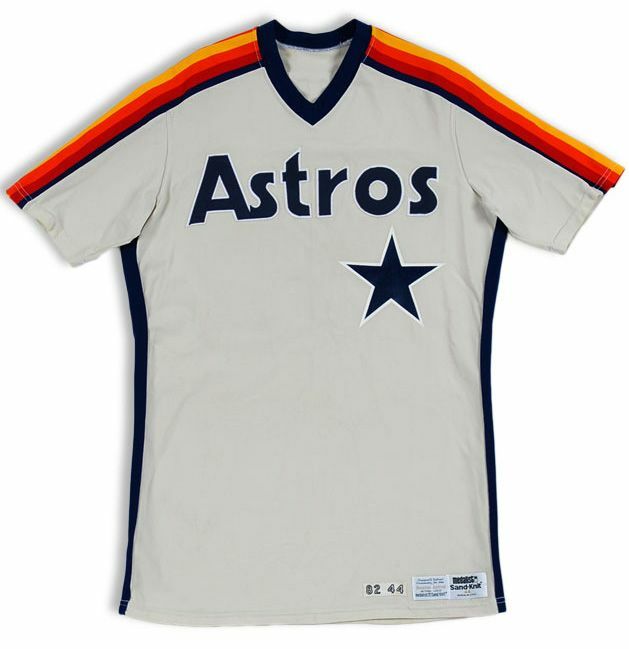 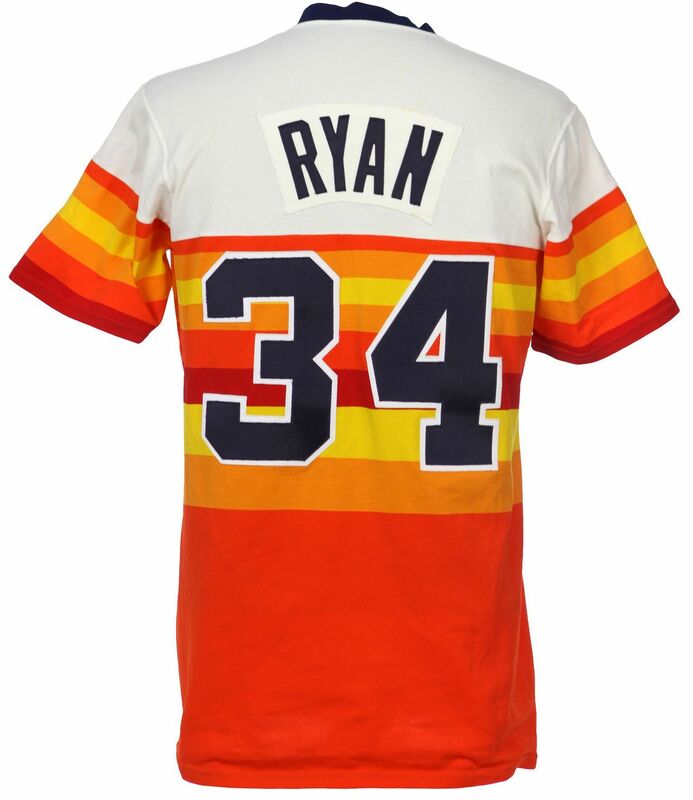 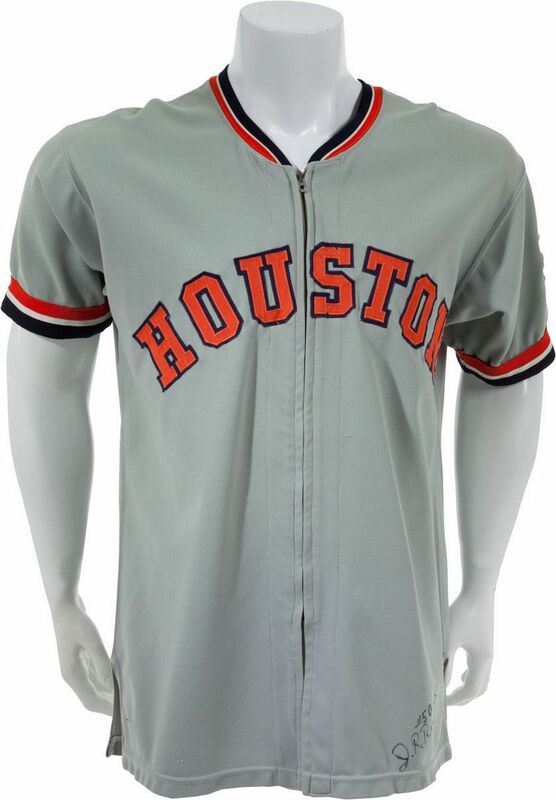 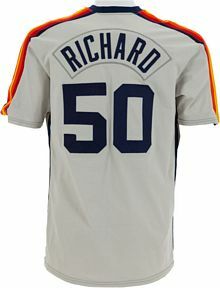 For home Sunday games, the Astros introduce an alternate white home jersey in the same style as the road one (anyone have a 1981 white?). 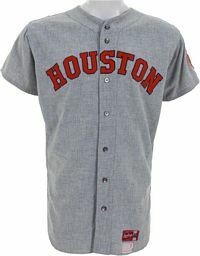 Grey is always worn on the road. 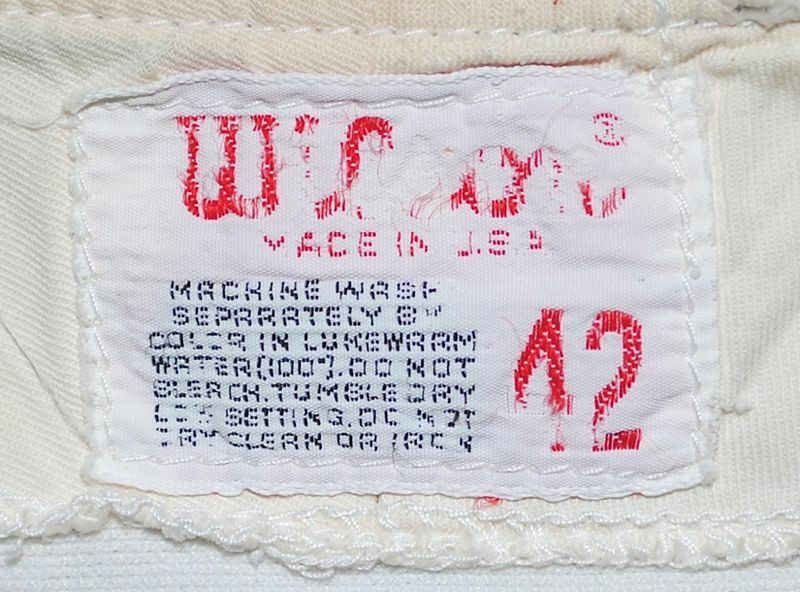 NOB has been removed on this one. 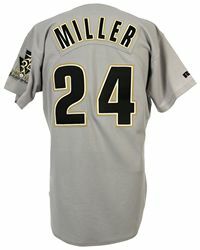 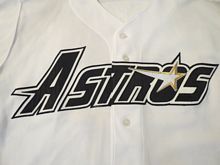 The star on all jerseys except home white now has a white outline. 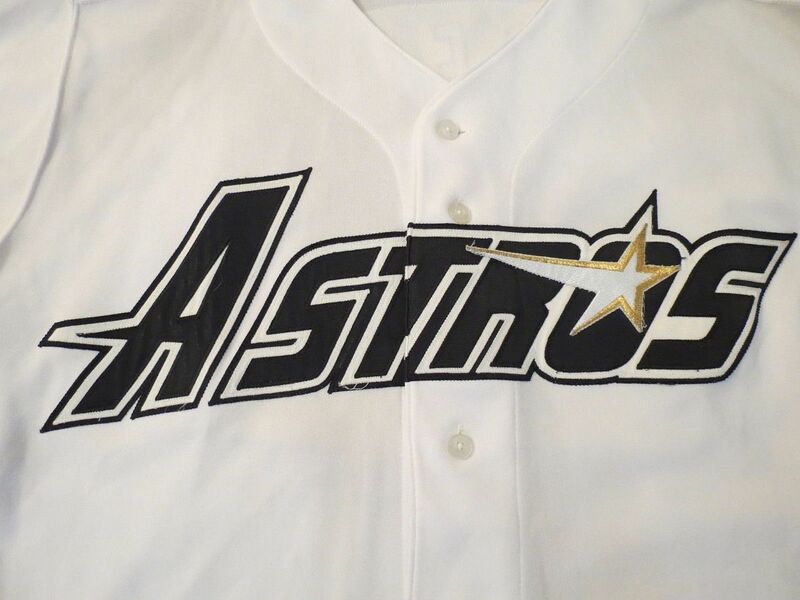 Lettering (but not the star) changes to tackle twill, and has a white outline on road jerseys. 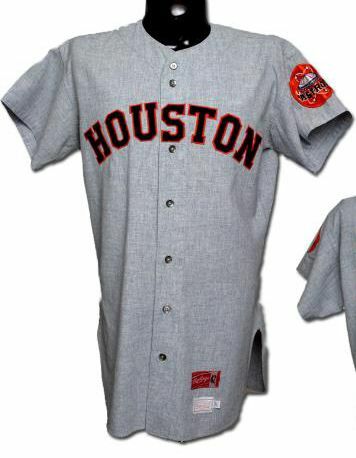 During the season, the grey road jersey changes to cream. 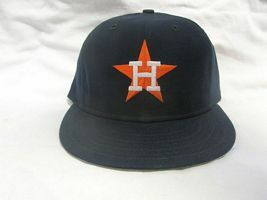 Orange cap is retired, navy is worn home and road. 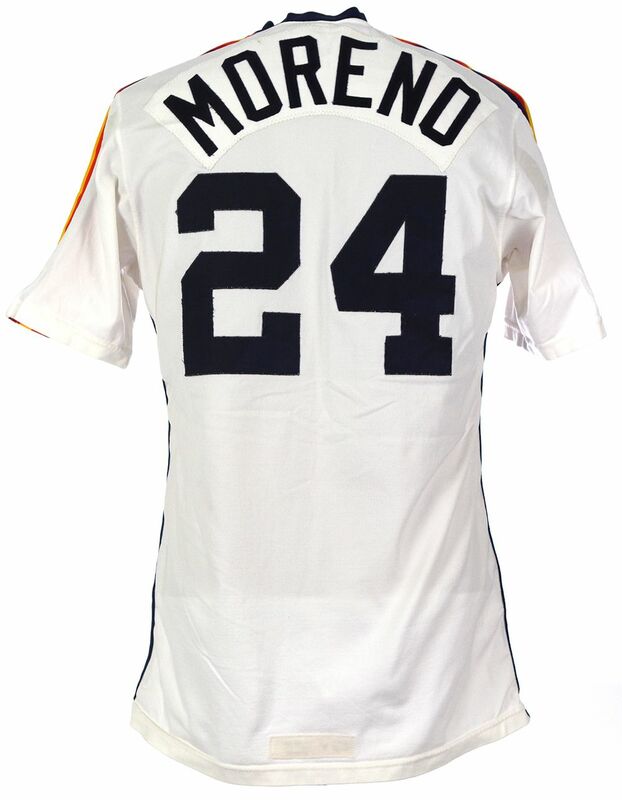 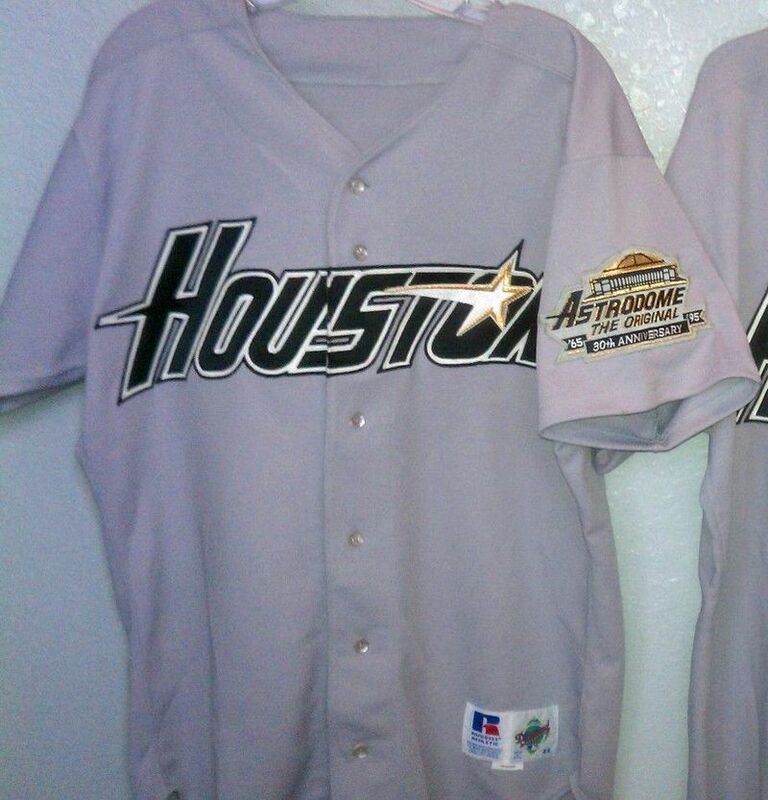 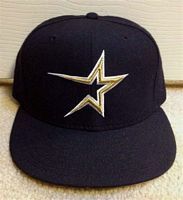 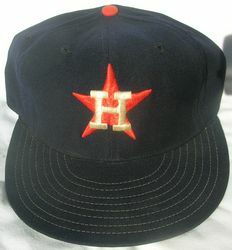 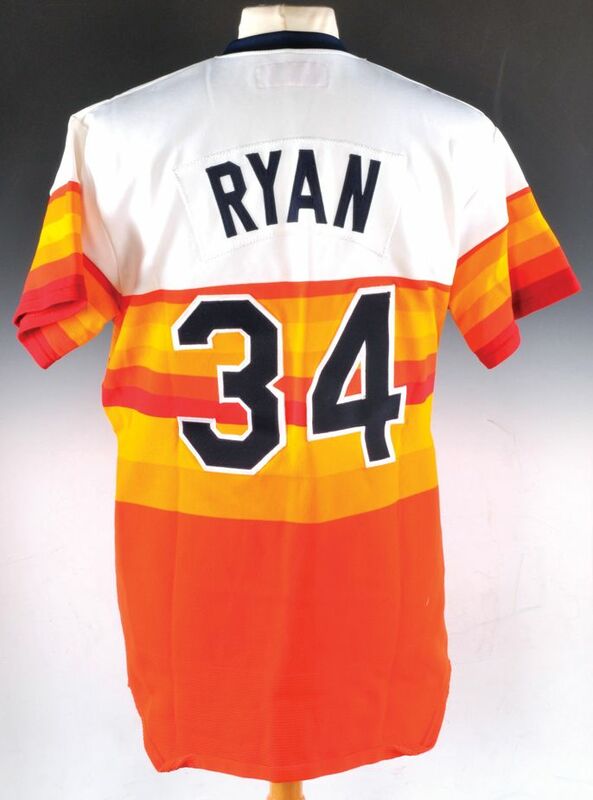 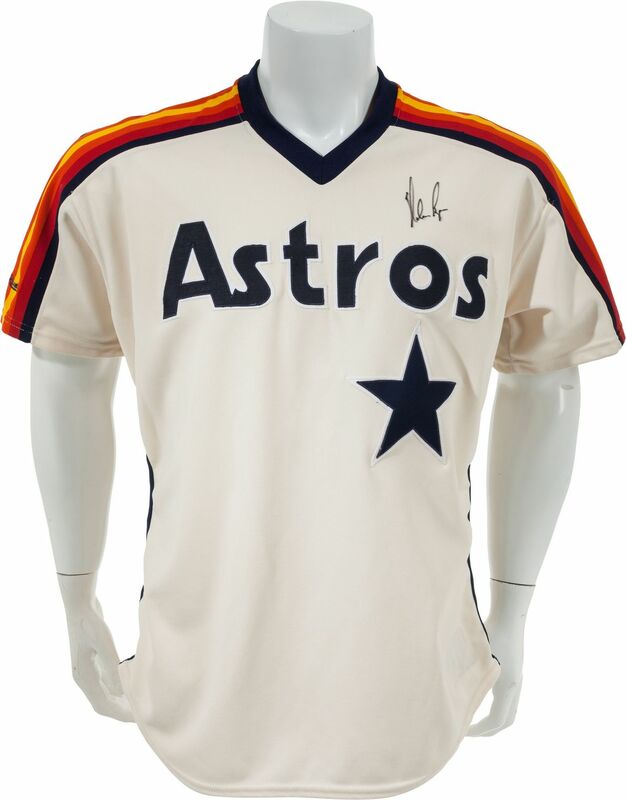 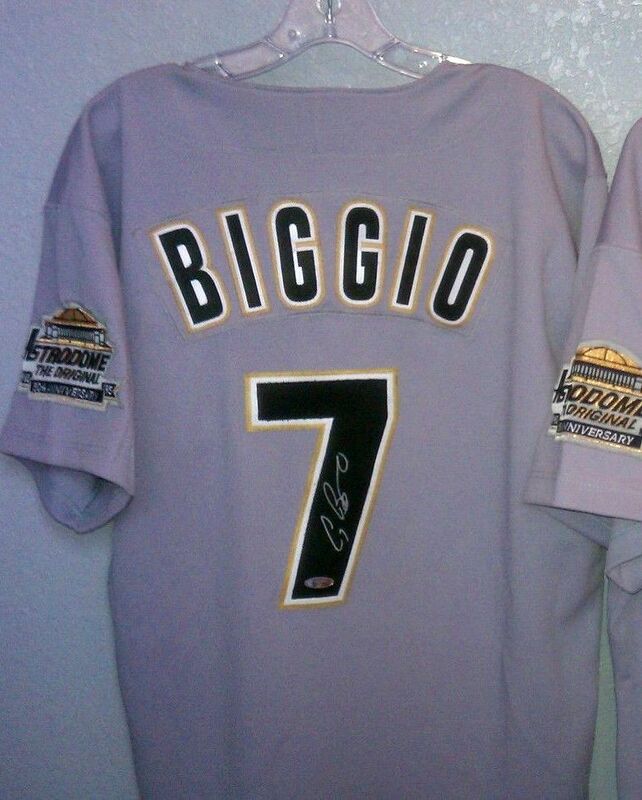 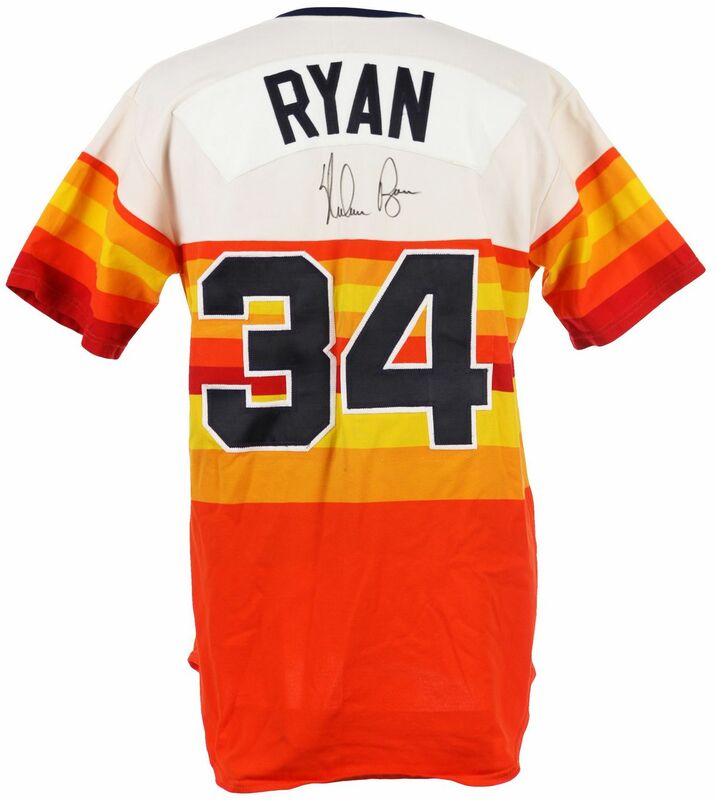 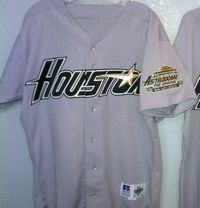 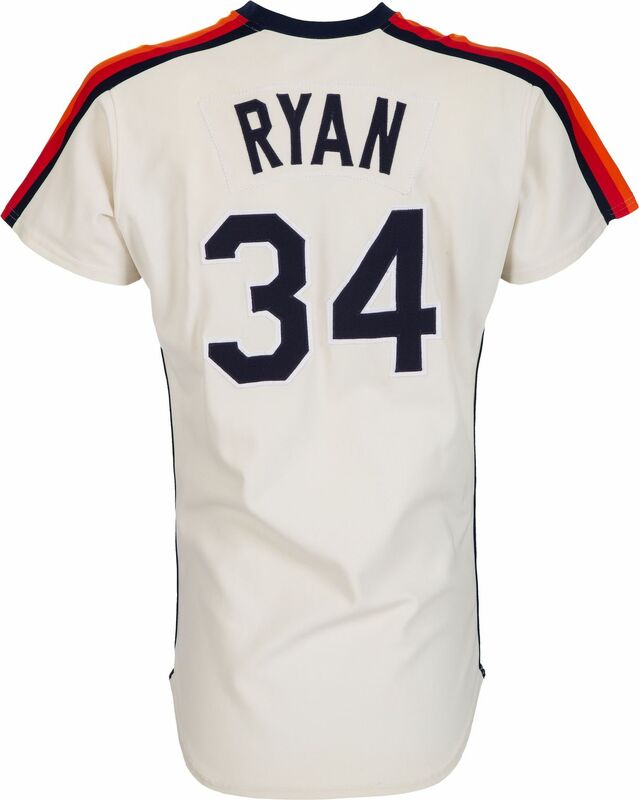 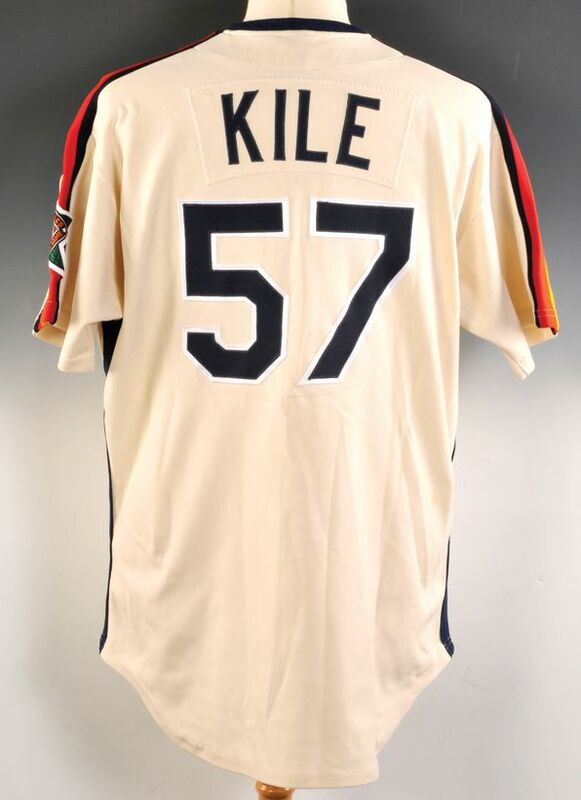 The home rainbow jersey star gets smaller and the "Astros" script gets larger and is centered. 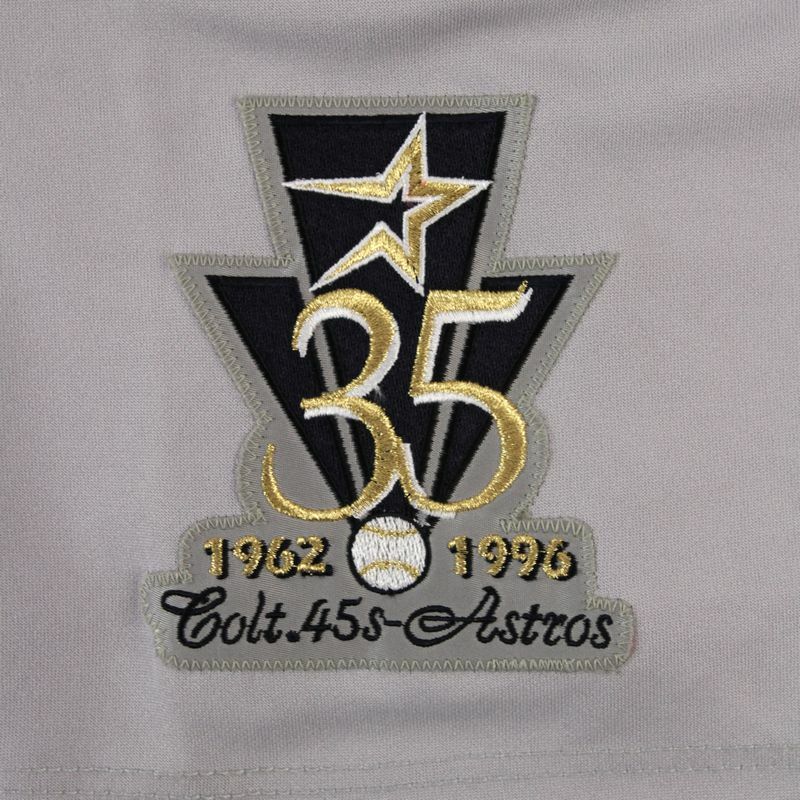 The star is now sewn on. 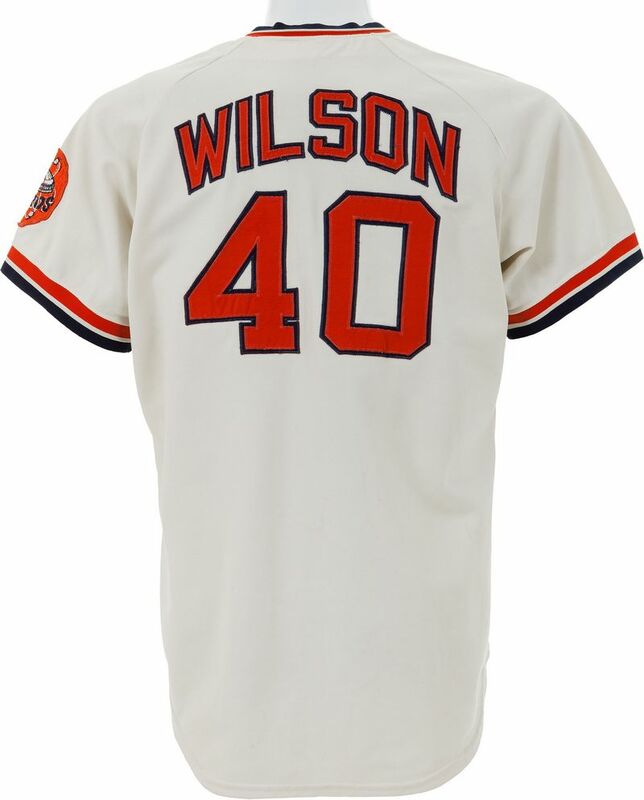 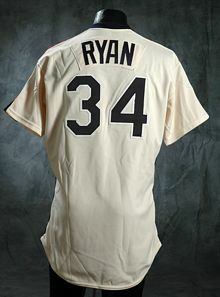 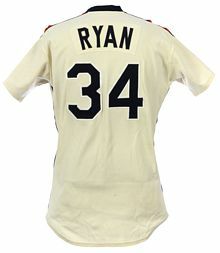 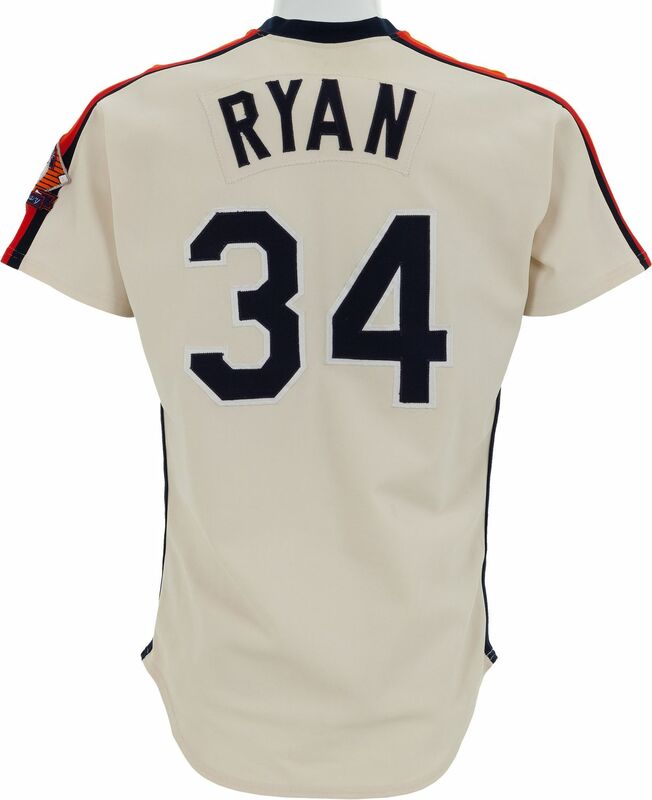 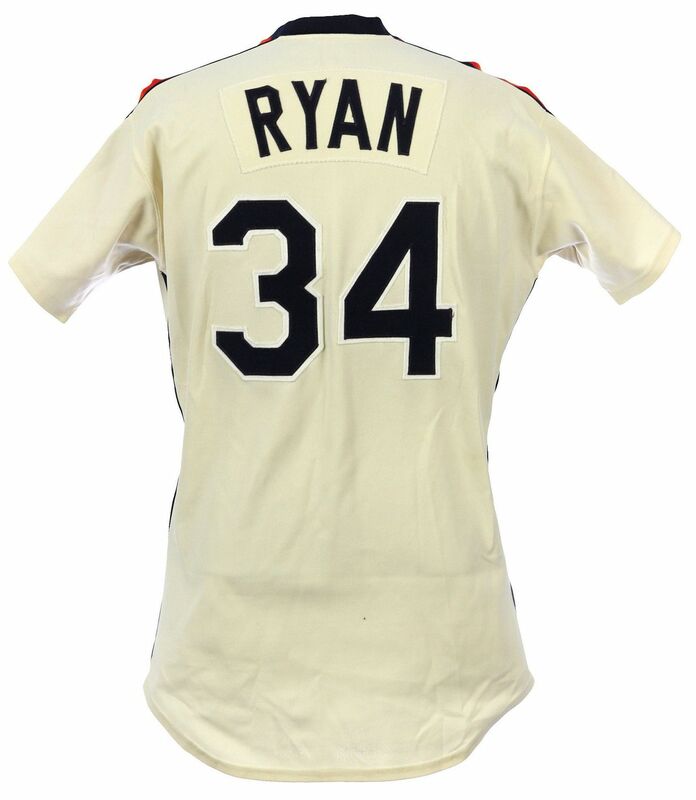 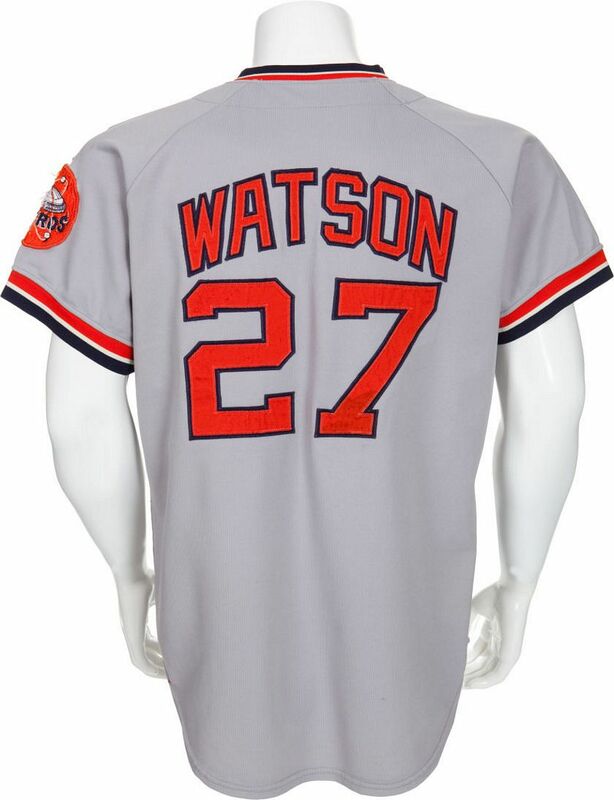 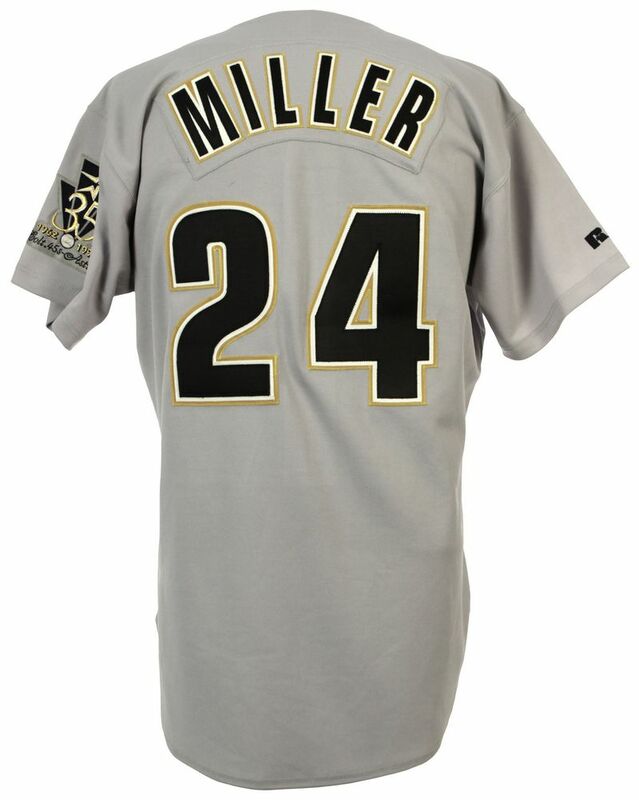 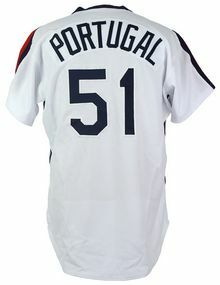 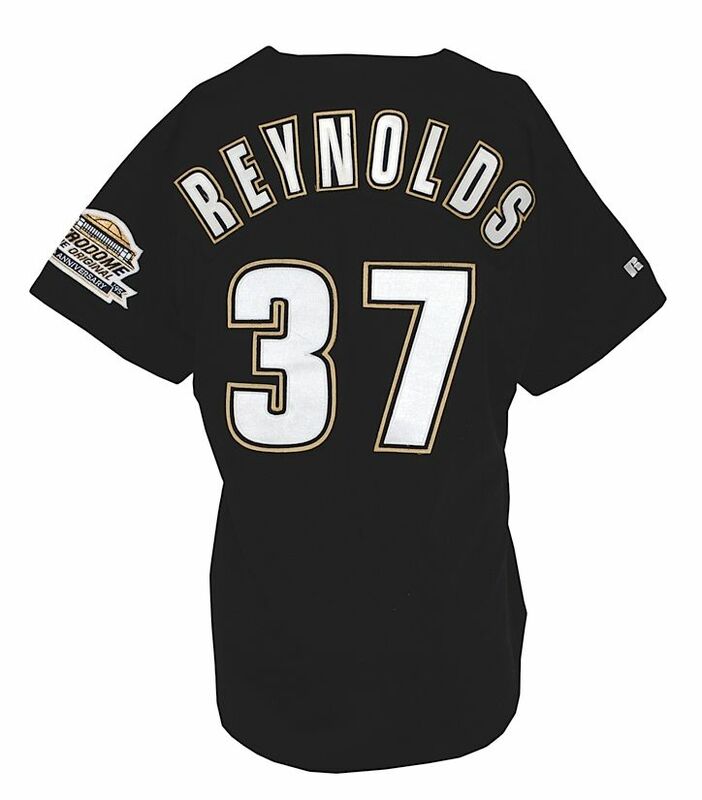 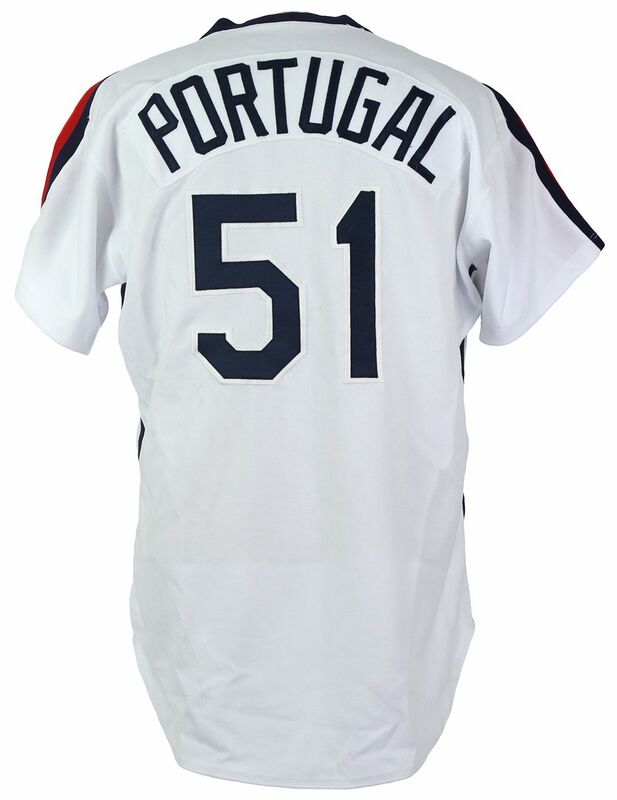 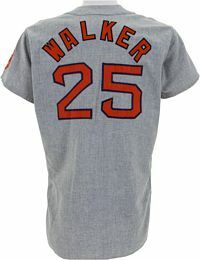 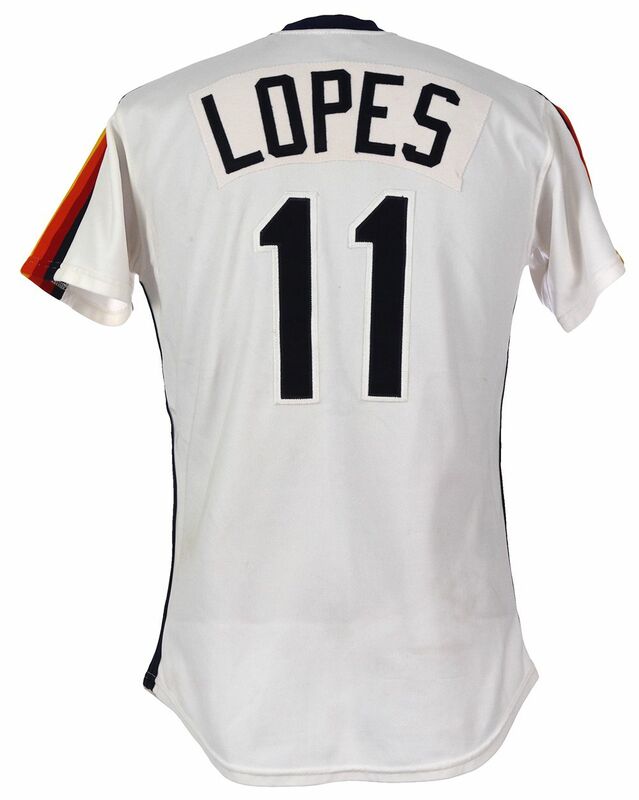 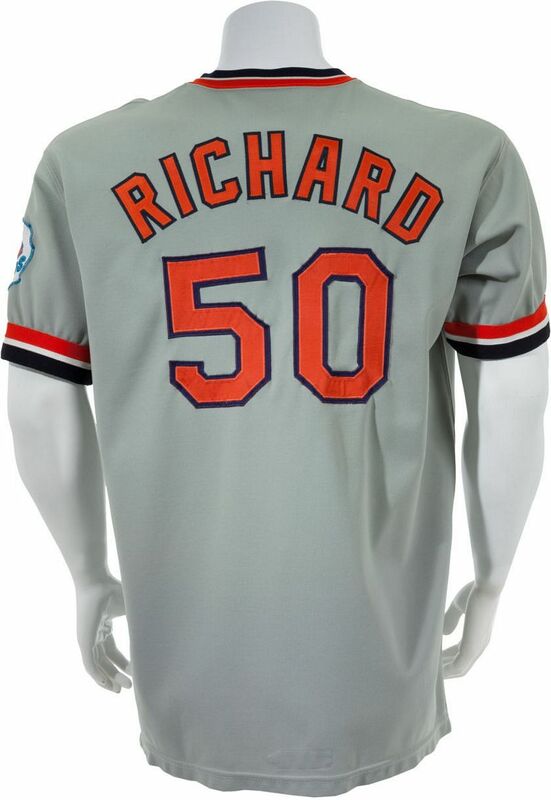 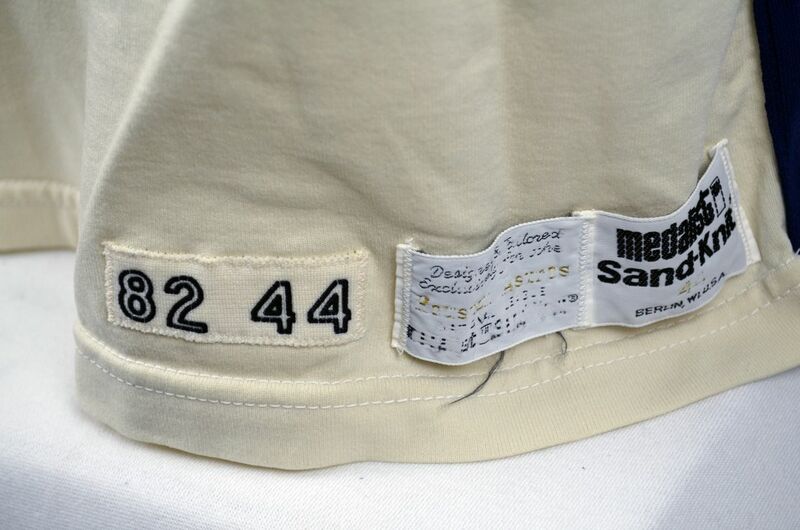 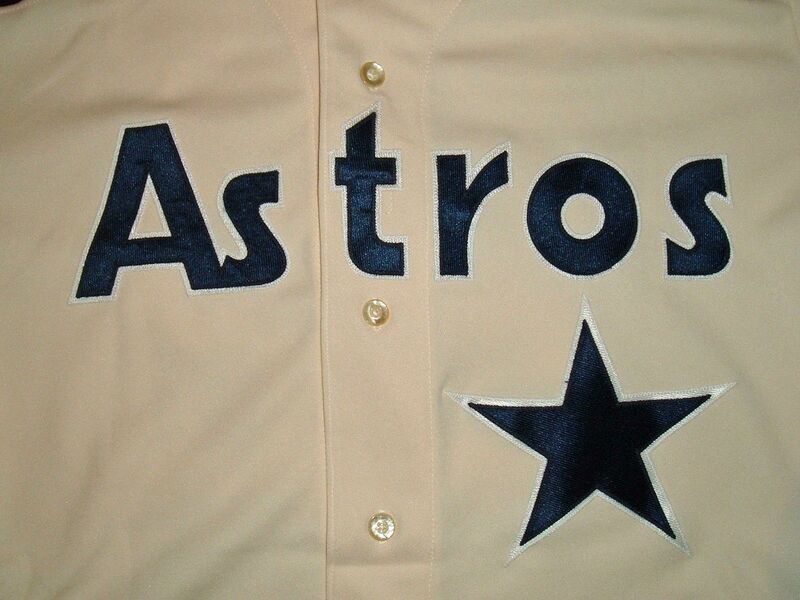 On the white jersey, the star and lettering get a bit smaller and white trim is added. 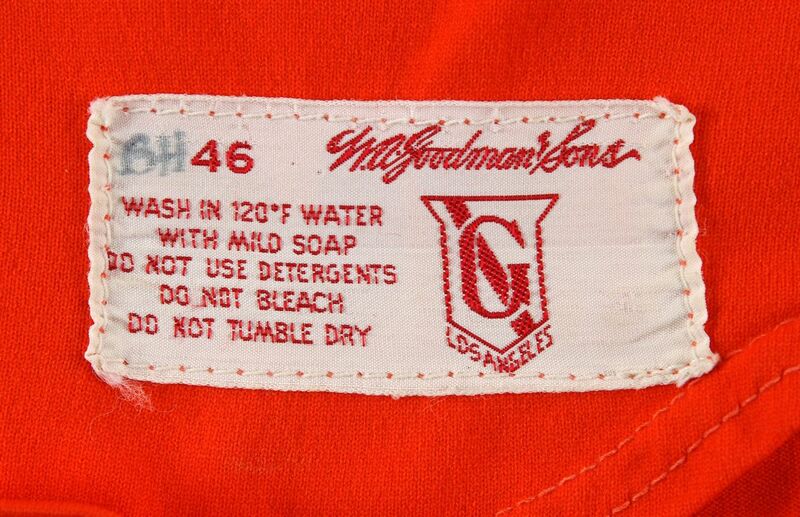 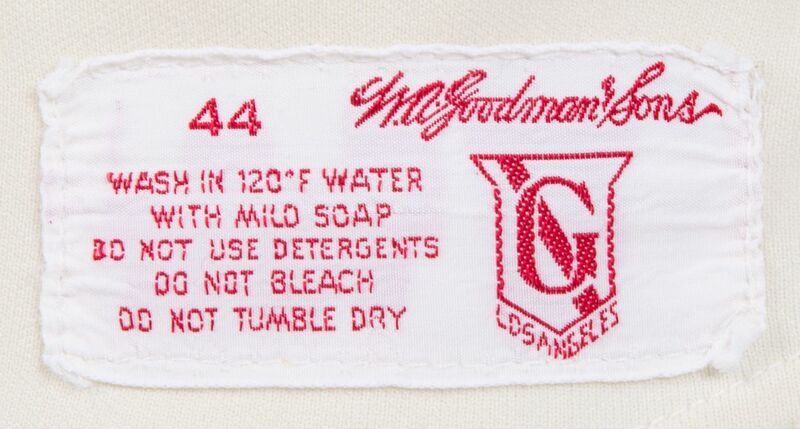 Goodman number font. 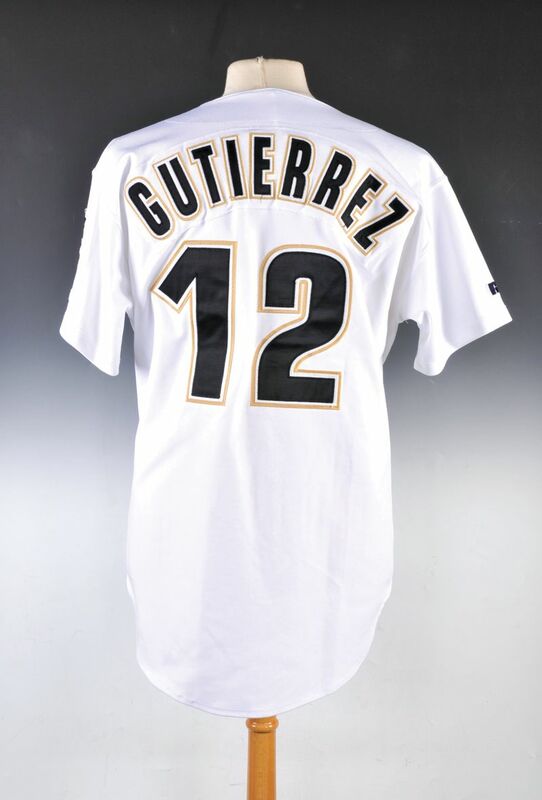 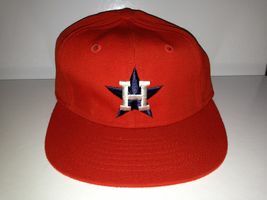 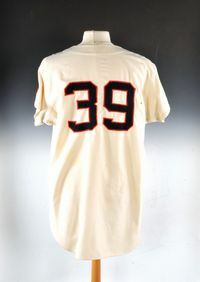 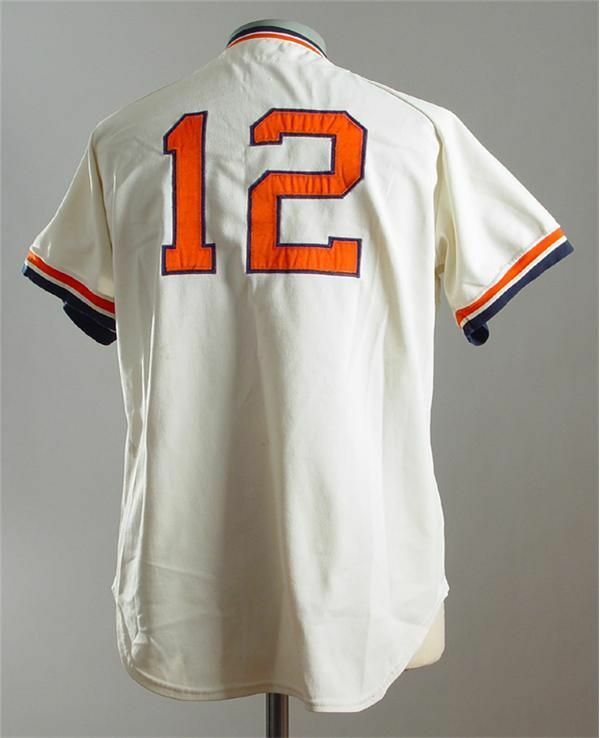 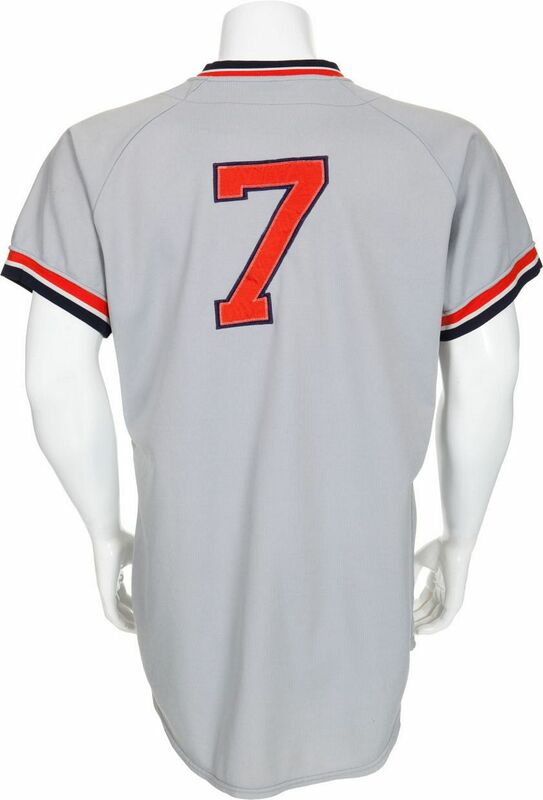 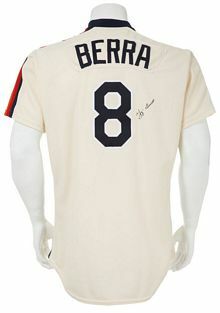 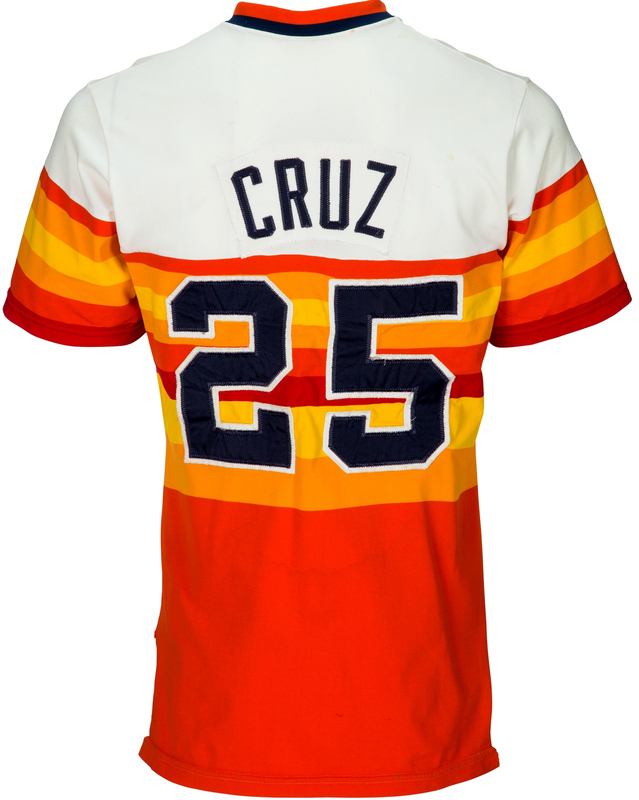 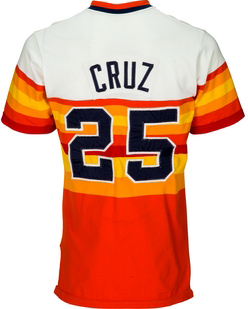 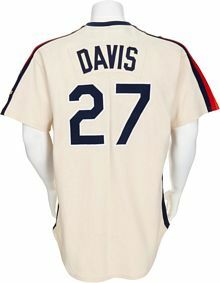 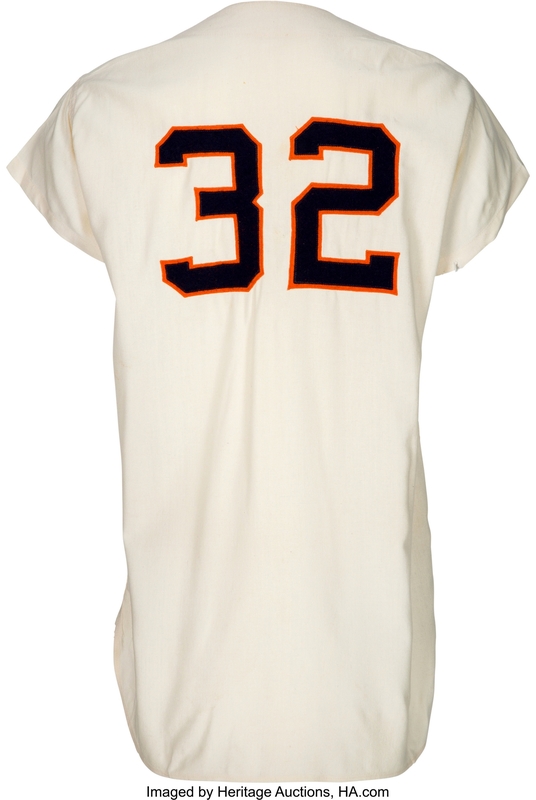 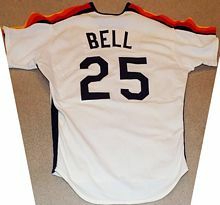 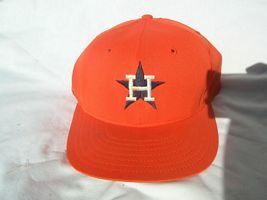 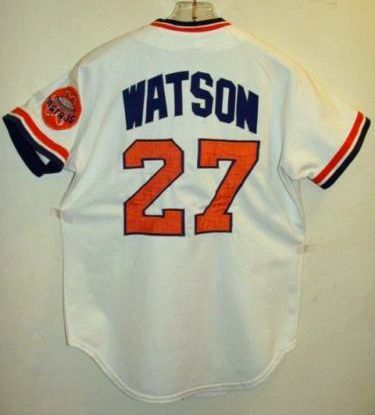 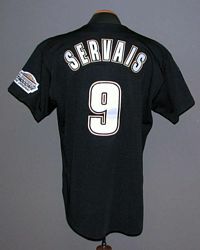 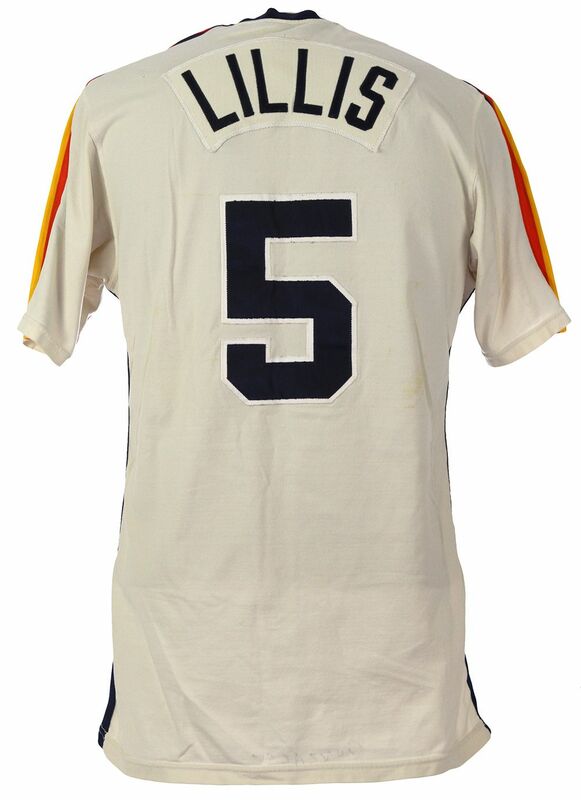 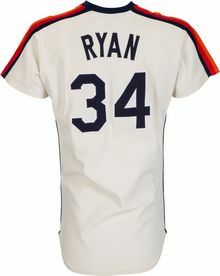 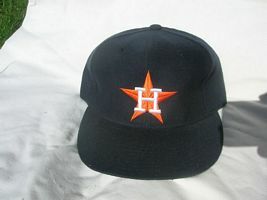 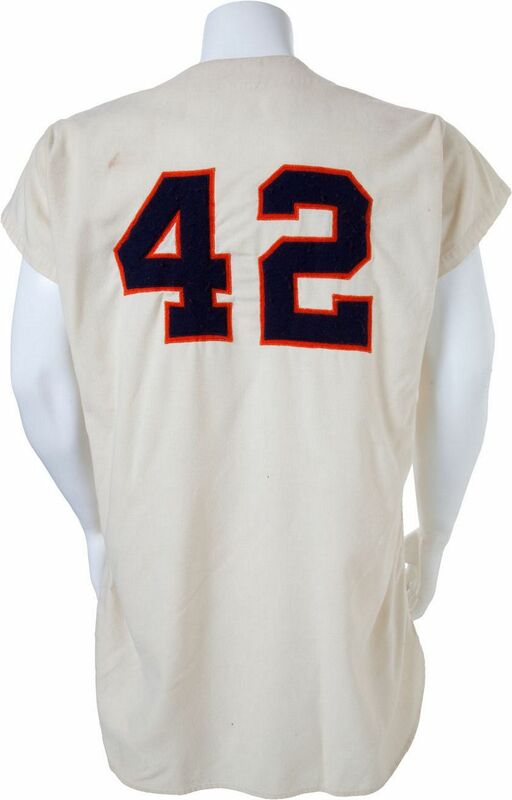 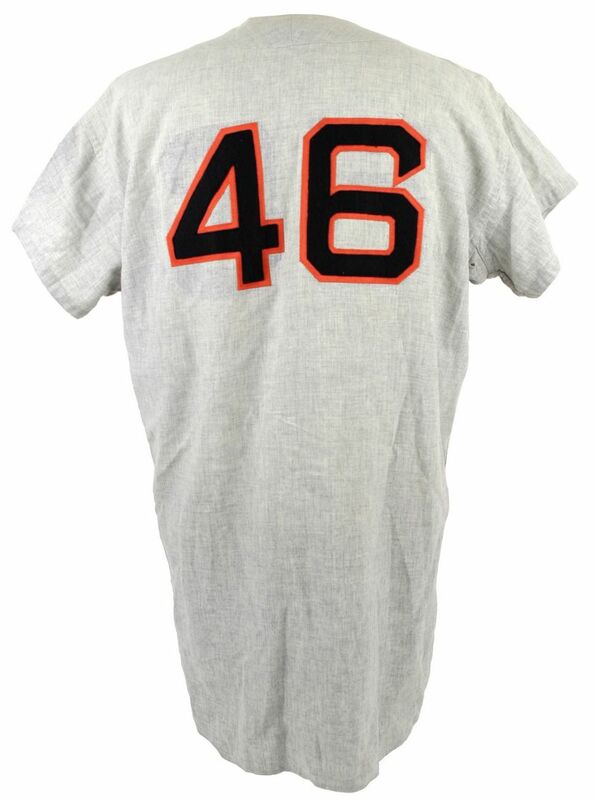 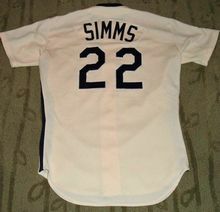 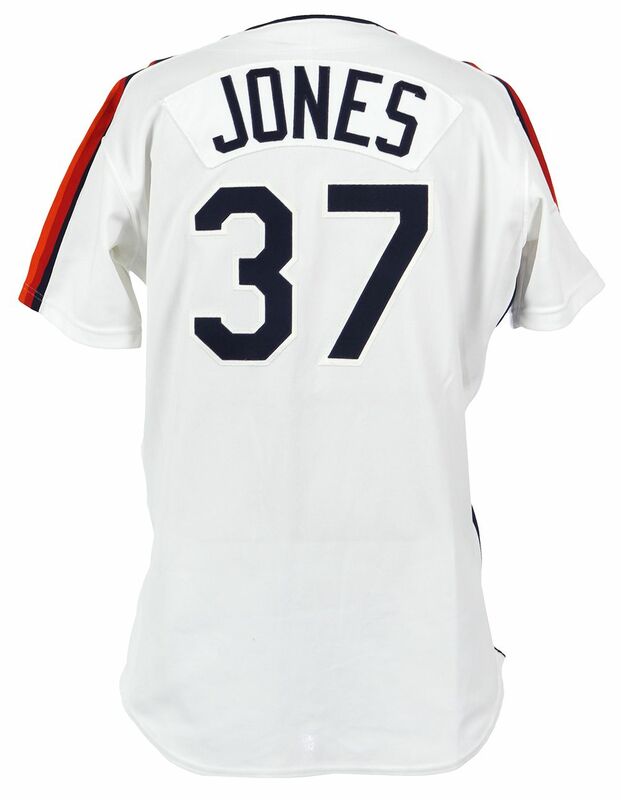 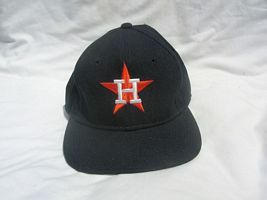 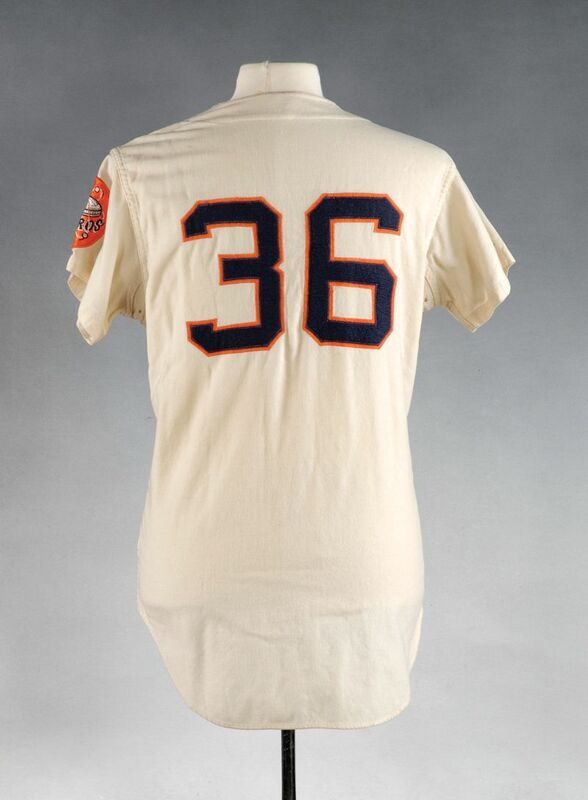 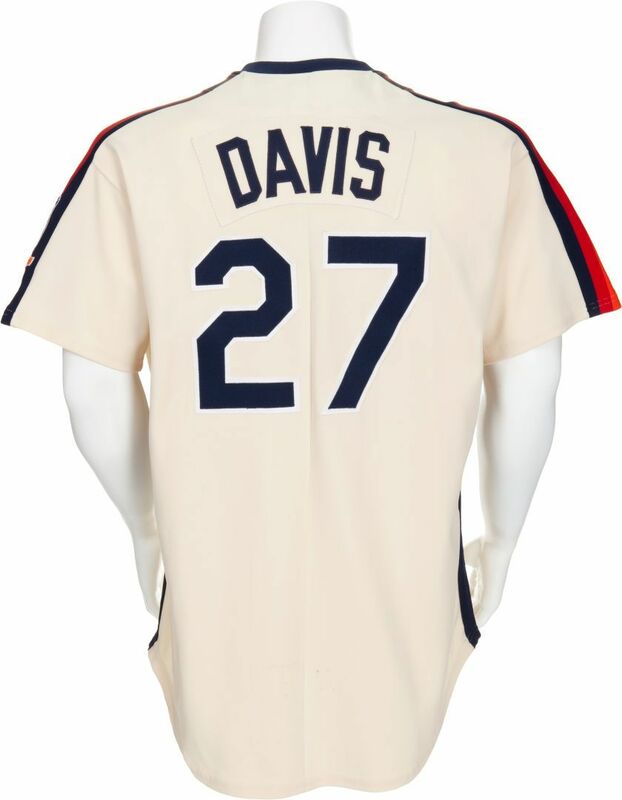 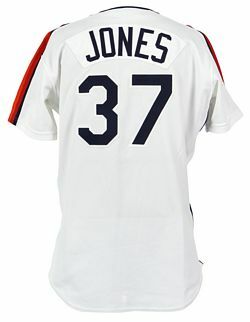 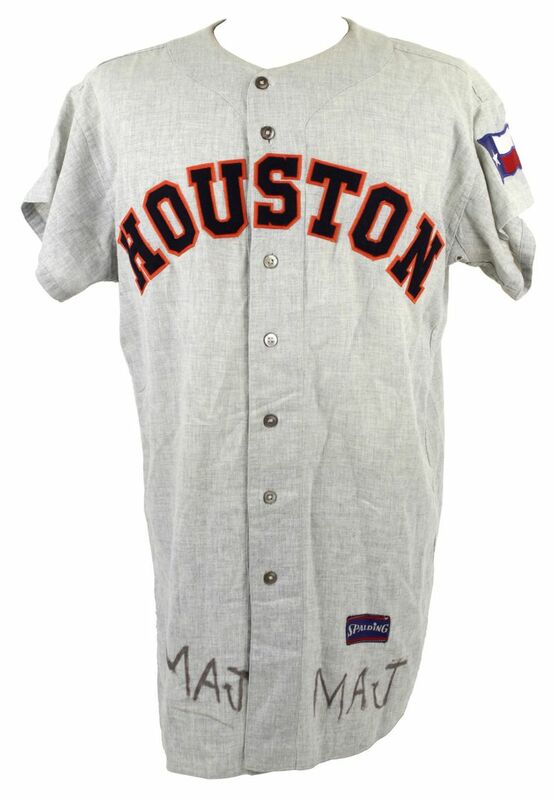 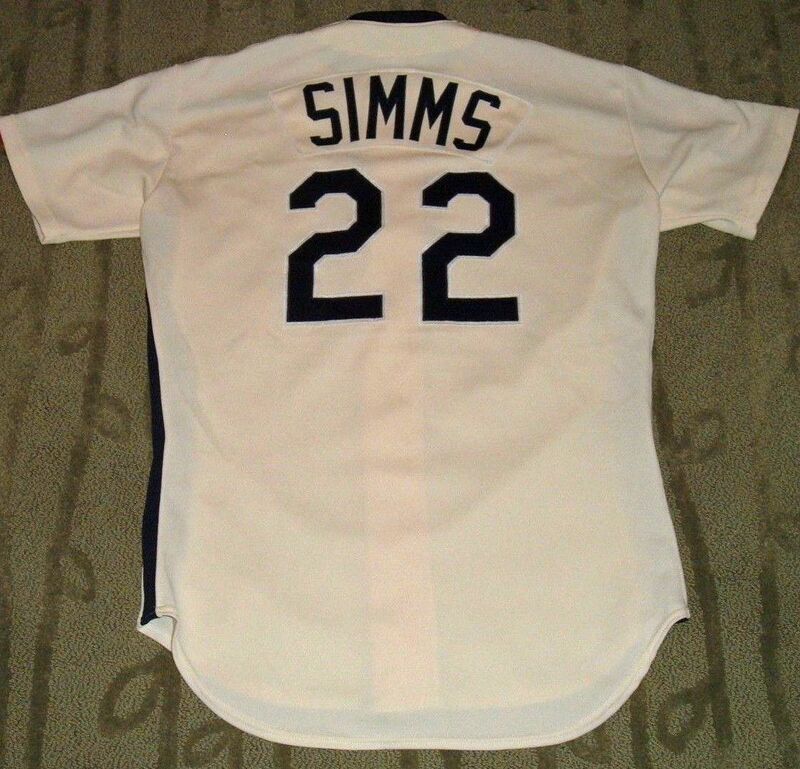 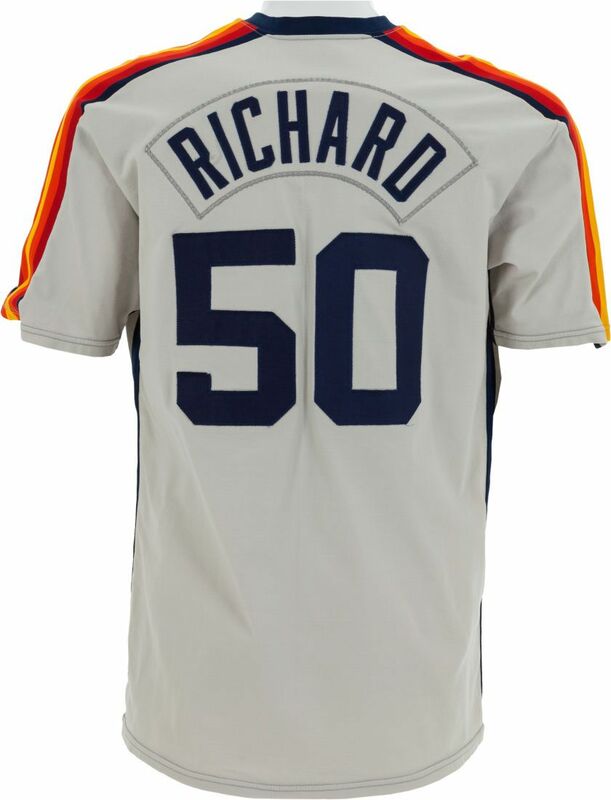 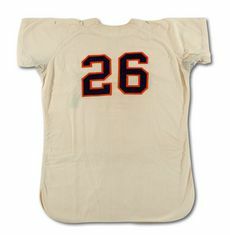 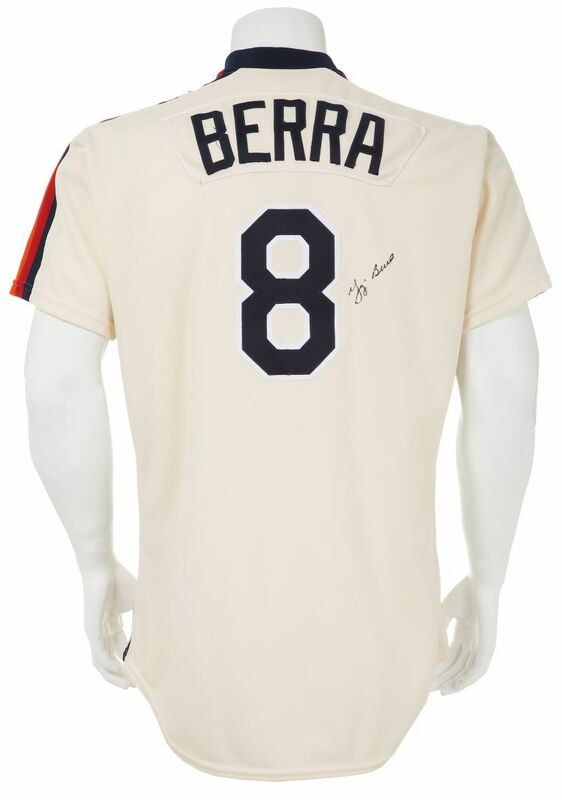 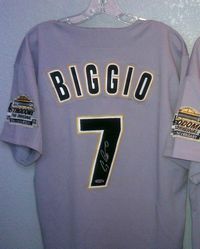 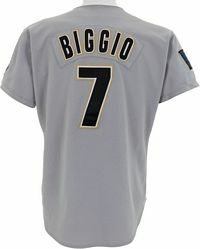 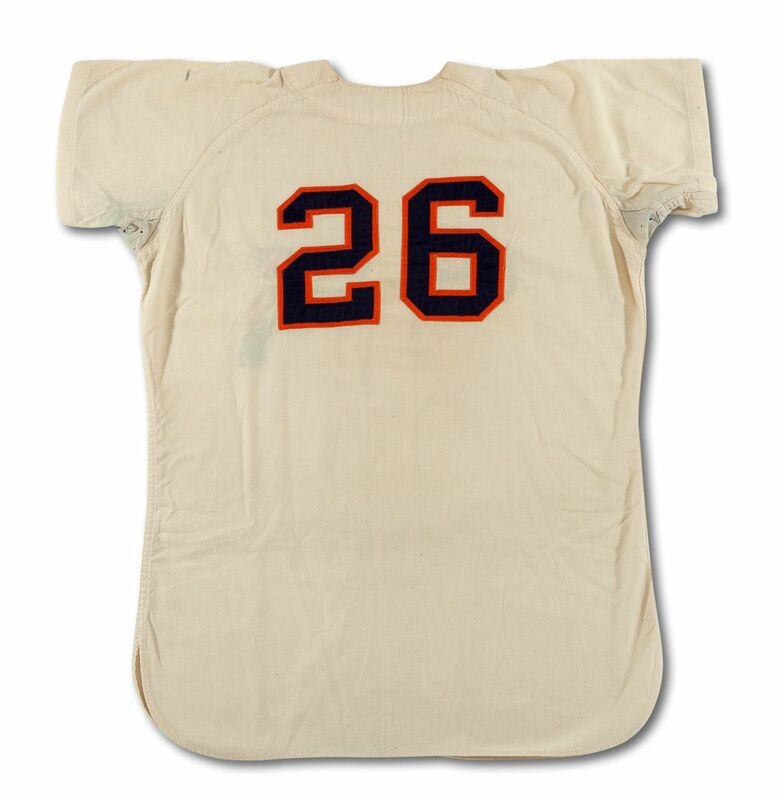 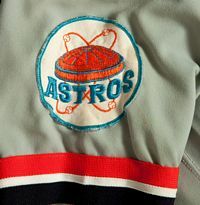 Home jersey "Astros" script returns to its left aligned position. 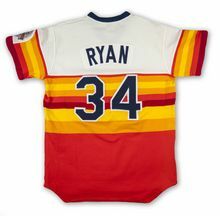 White jersey becomes the main home jersey, the rainbow jersey is officially an alternate, used less and less. 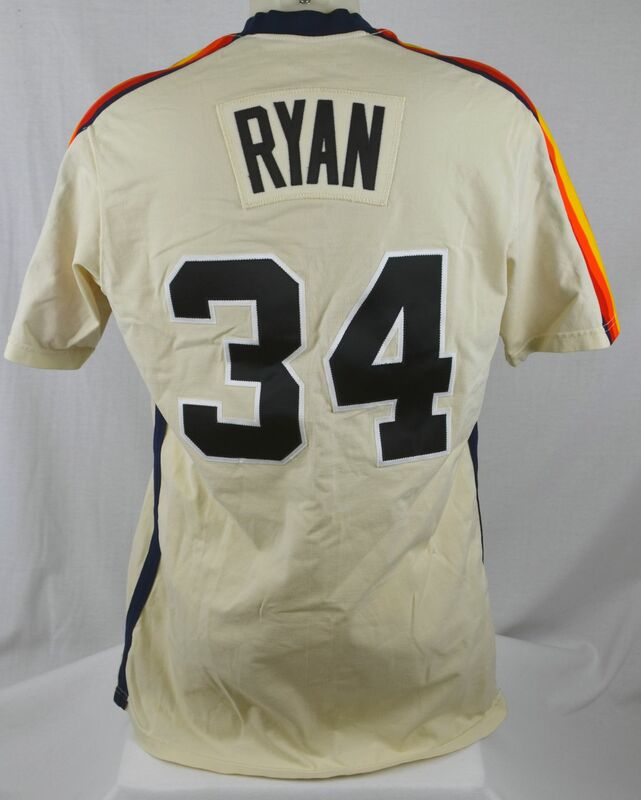 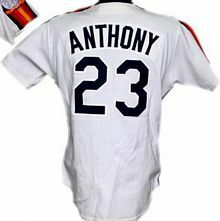 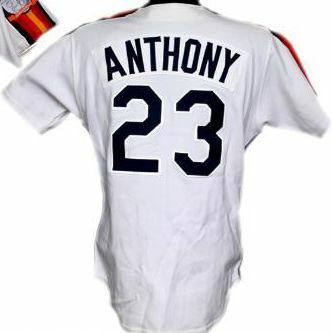 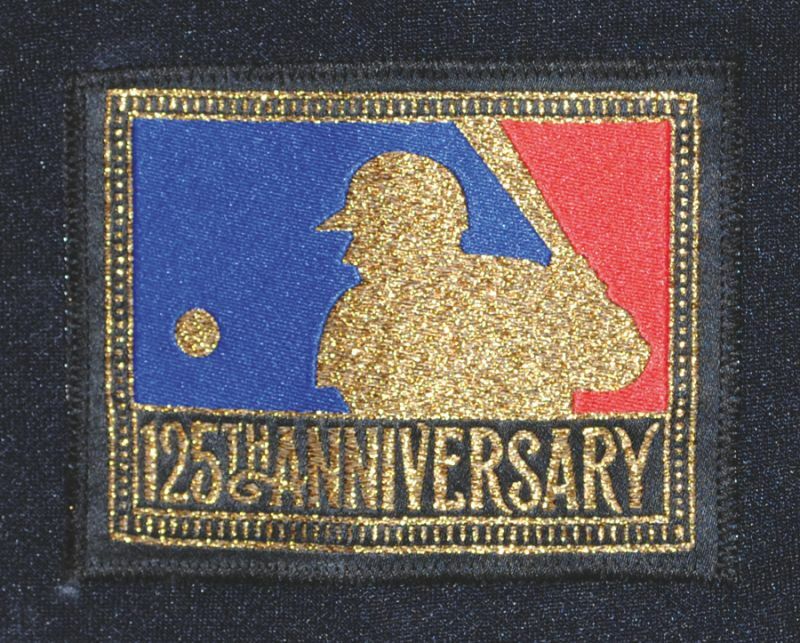 1986 home jerseys have All Star Game sleeve patch, road jerseys a 25th anniversary patch. 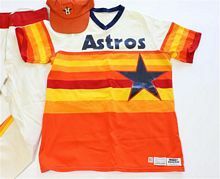 Bye bye rainbows - at least until the nostalgic 2010's. 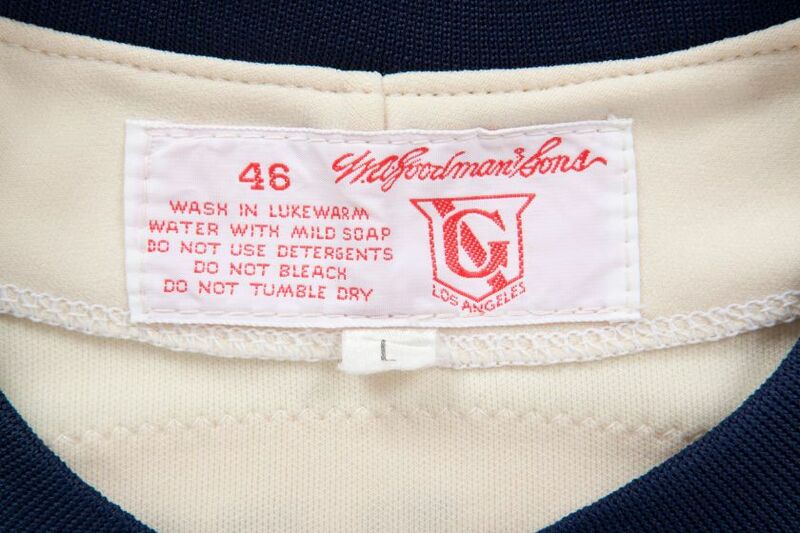 Pullovers give way to button-downs. 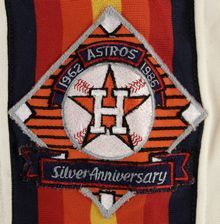 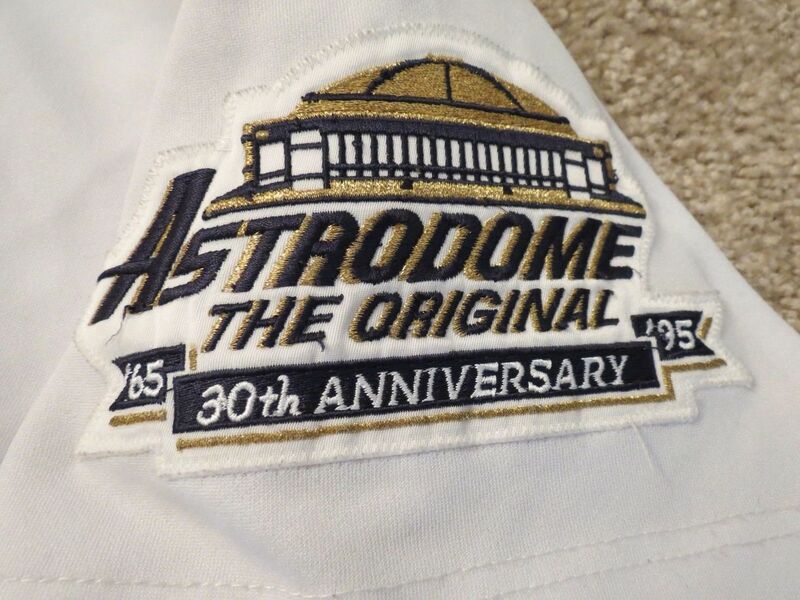 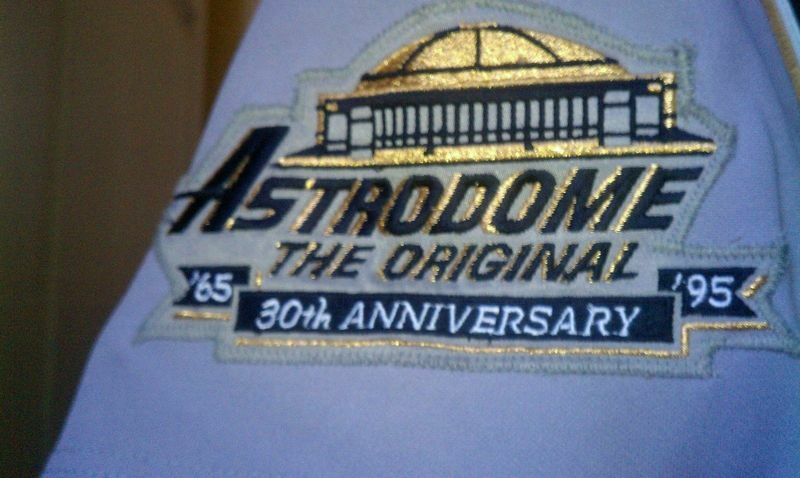 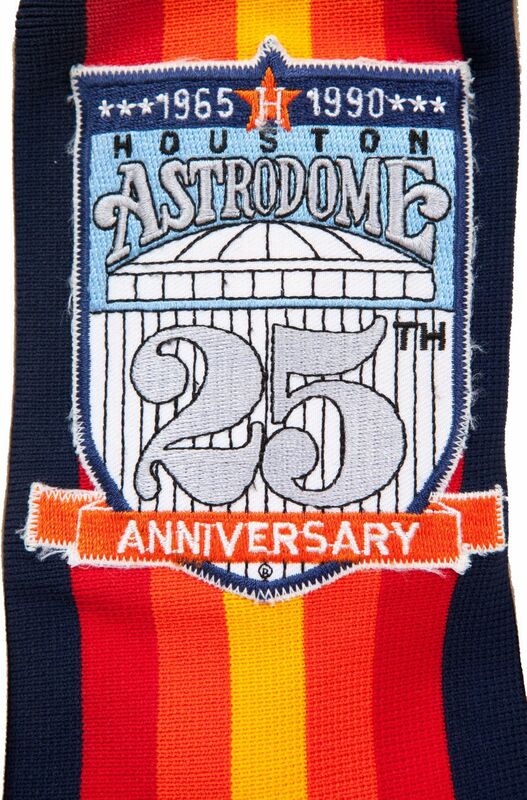 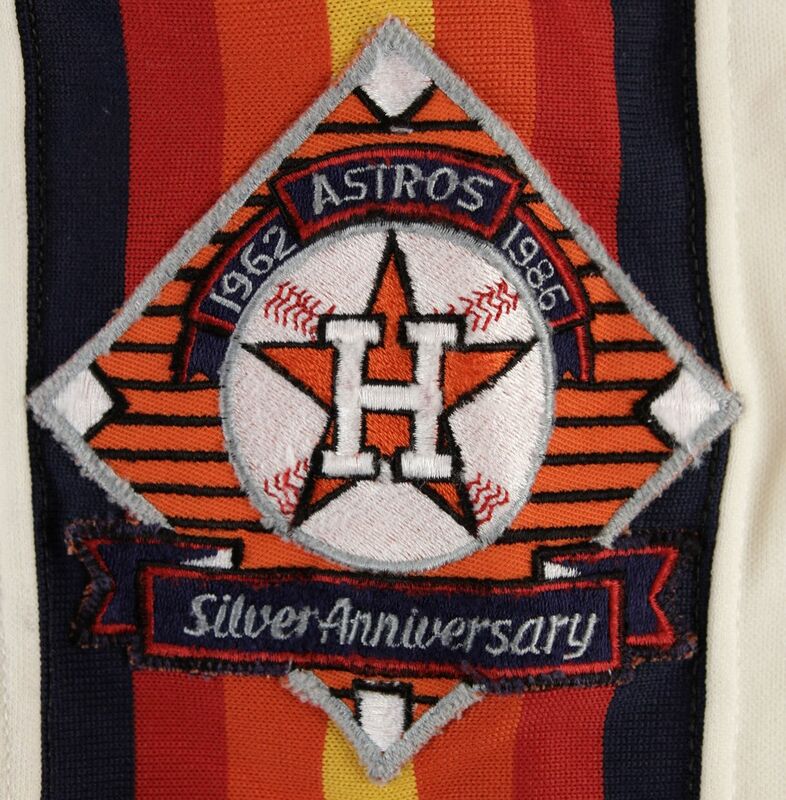 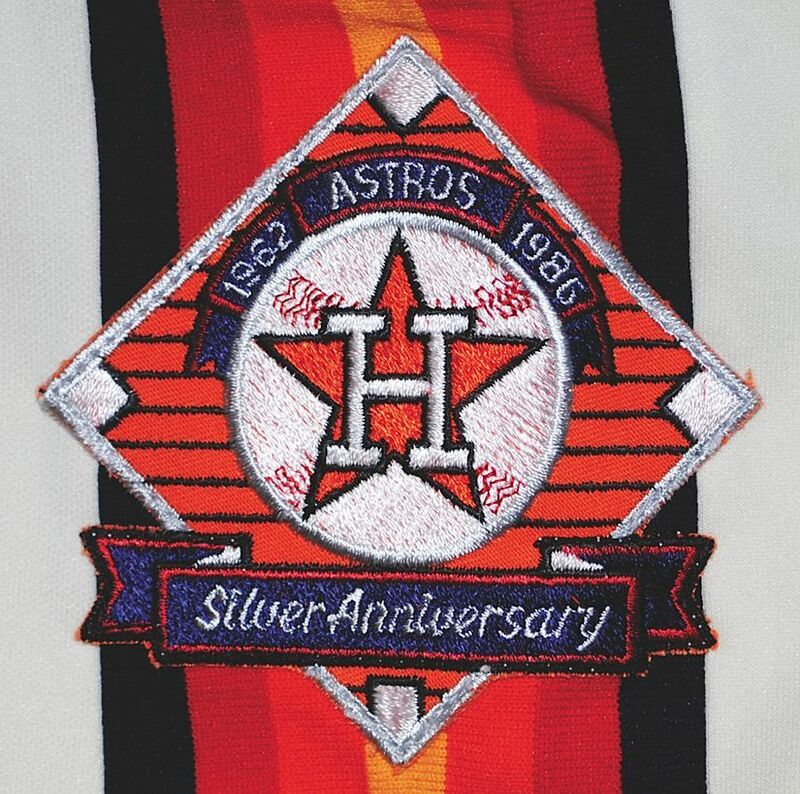 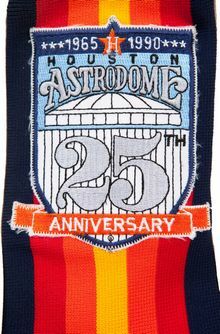 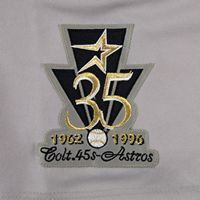 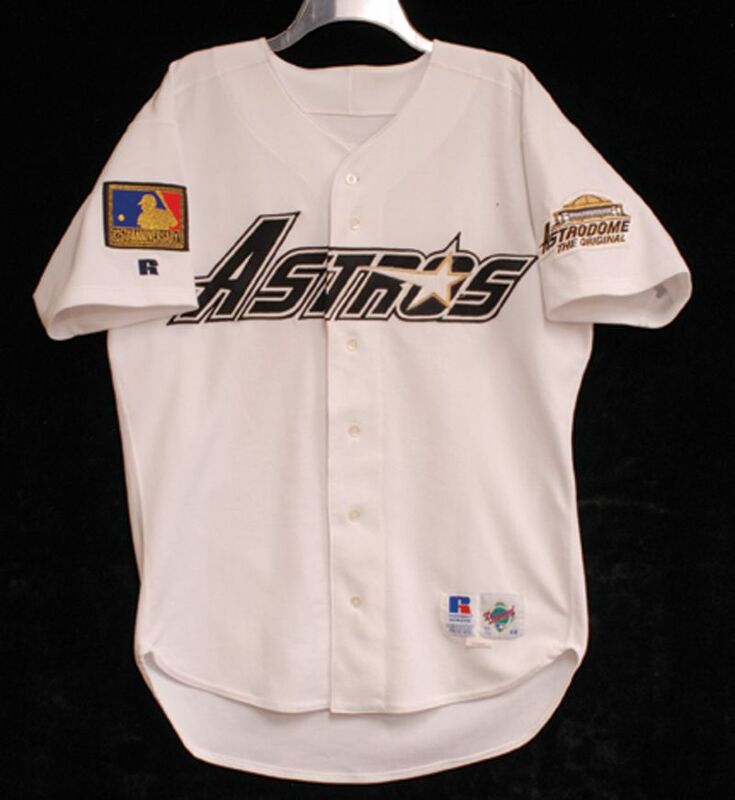 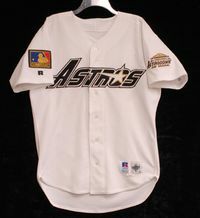 Astrodome 25th anniversary patch worn in 1990. 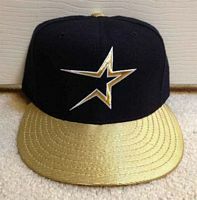 Drayton McLane buys the team and changes the look to a rather un-inspired navy and gold with a shooting star logo with a chunk of the star missing. 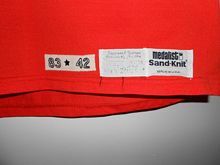 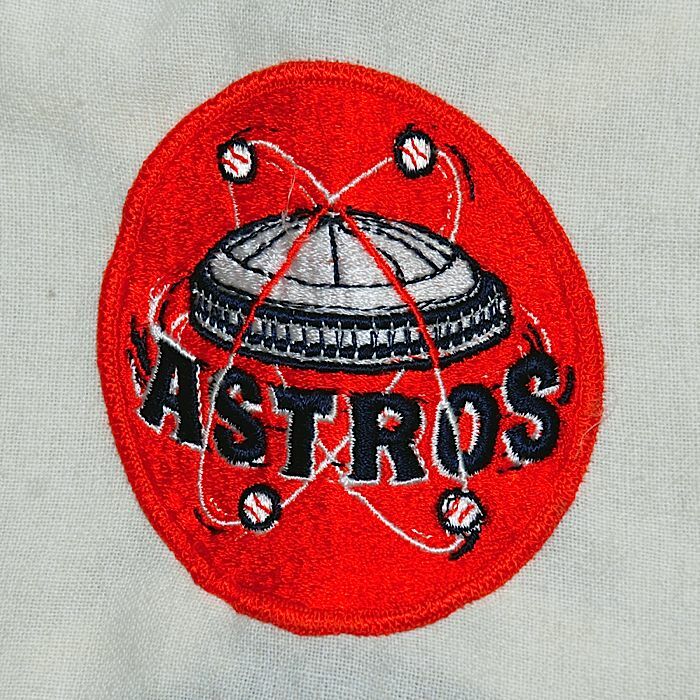 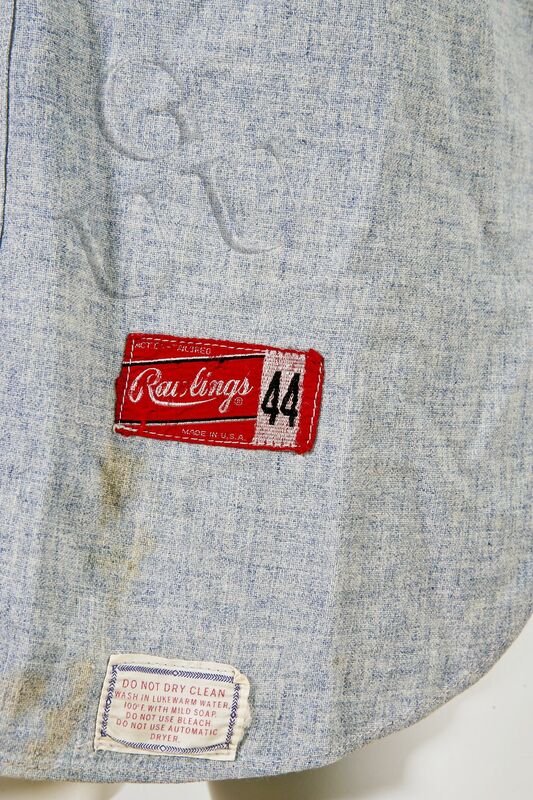 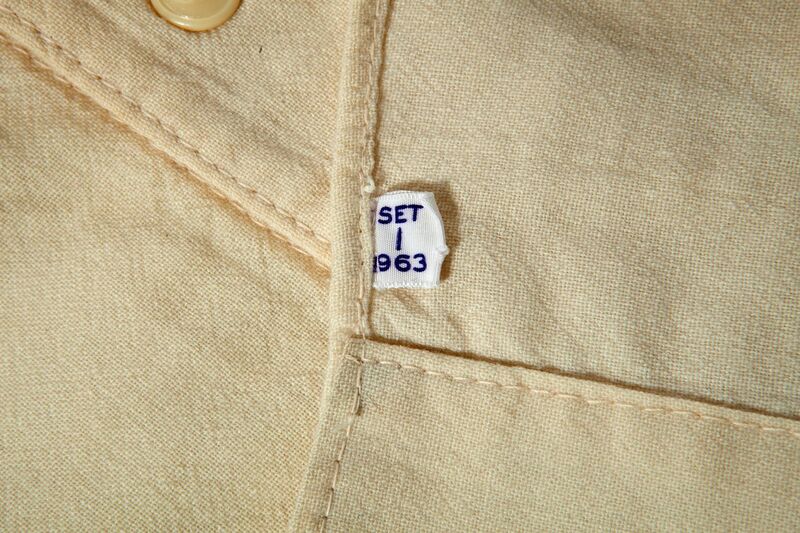 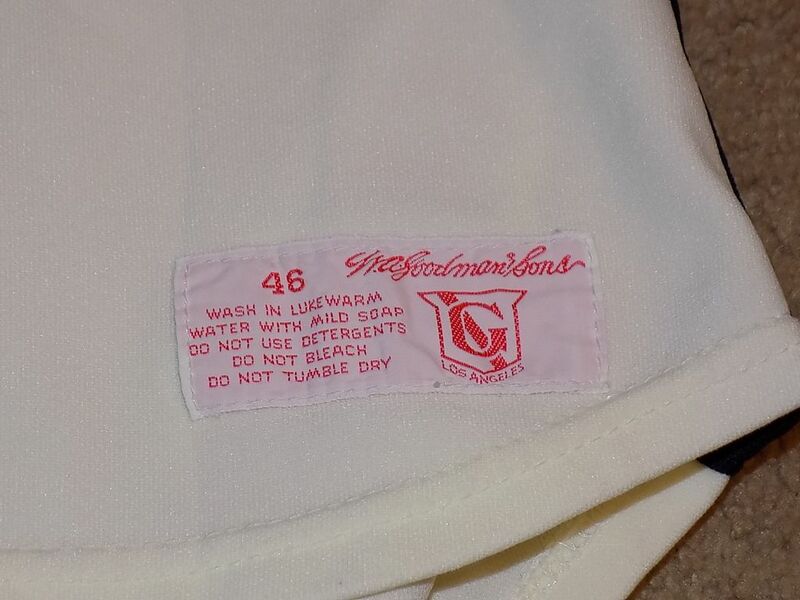 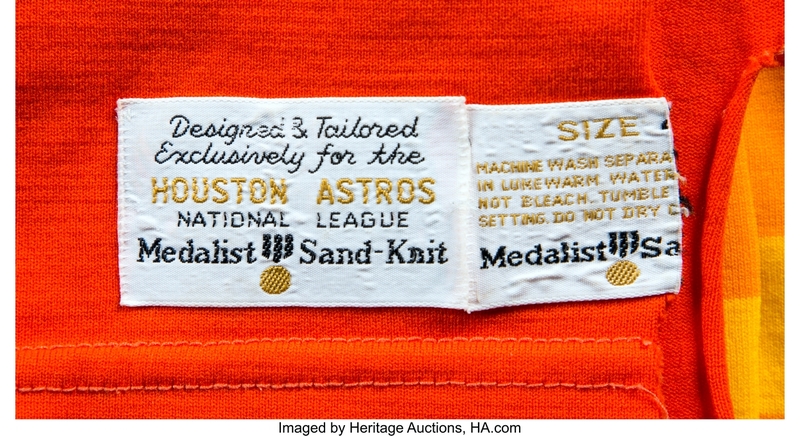 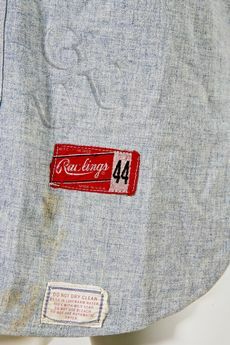 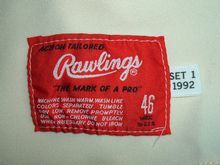 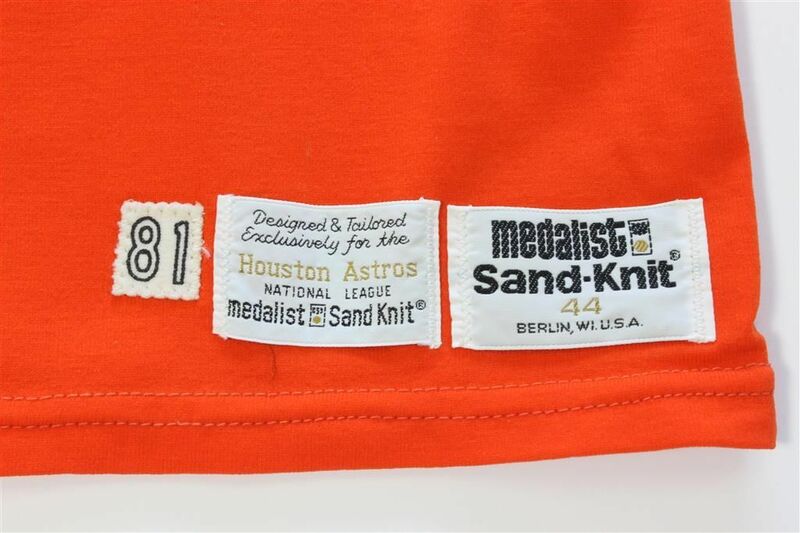 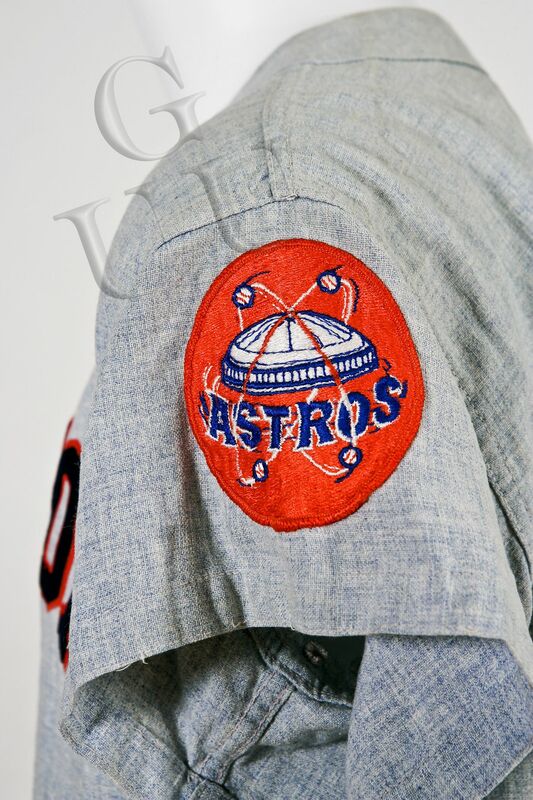 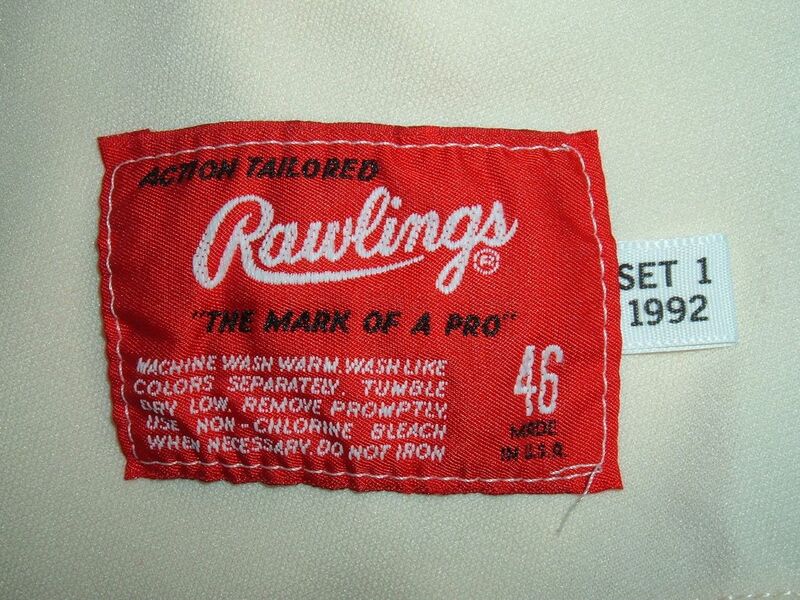 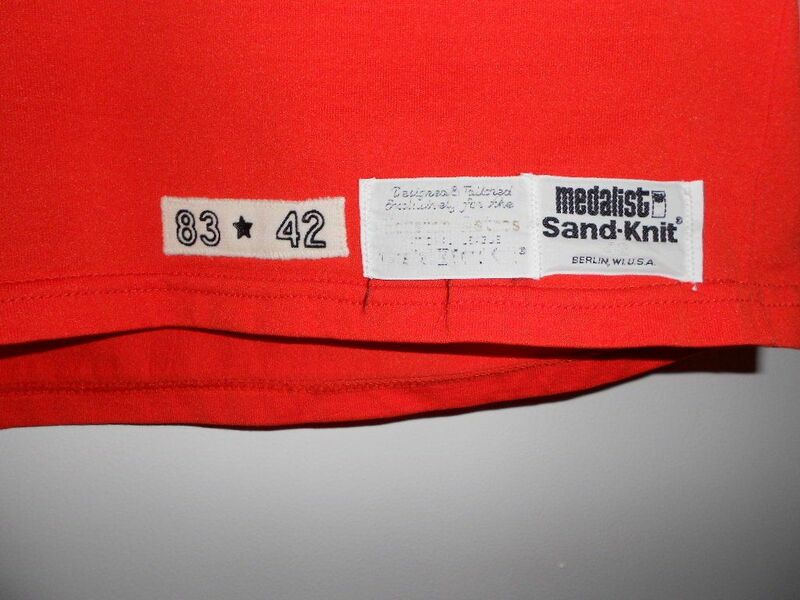 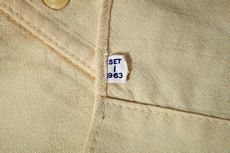 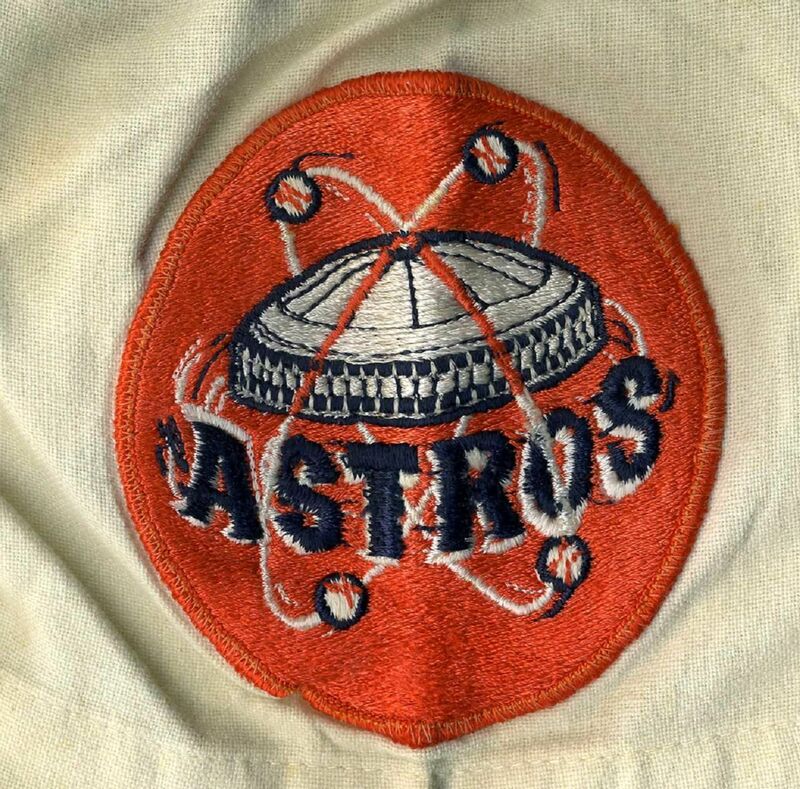 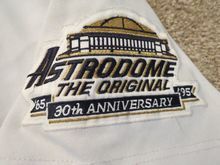 An Astrodome patch is worn on the sleeve. 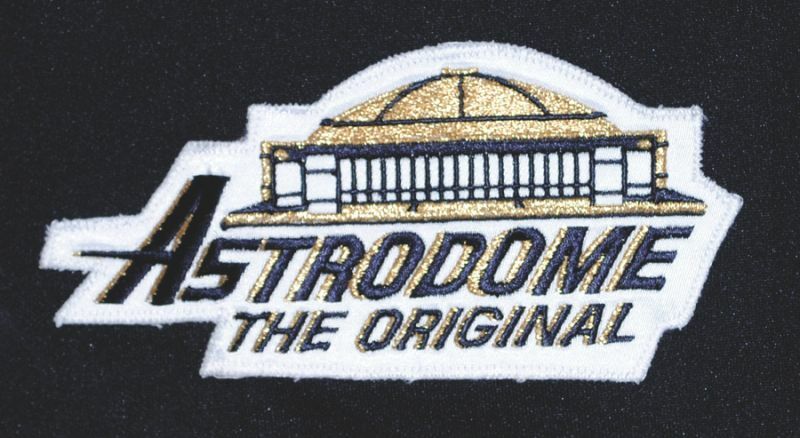 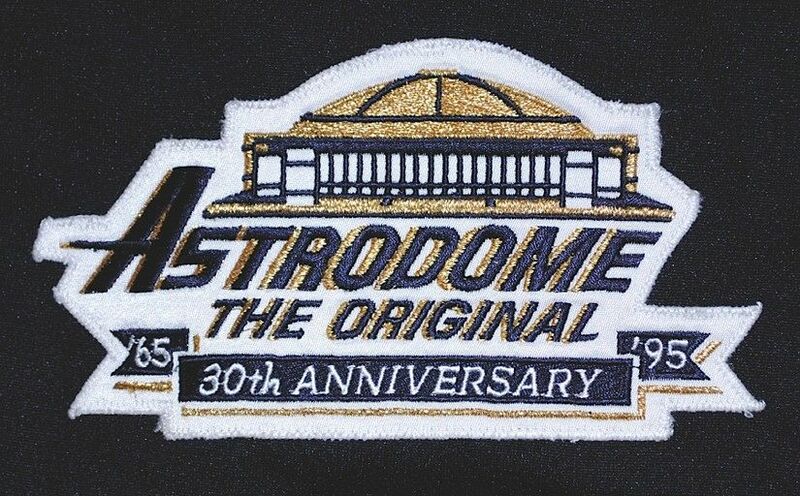 Astrodome patch modified in 1995 for 30th anniversary. 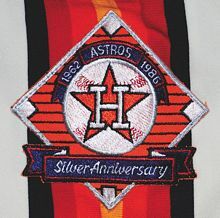 35th anniversary patch worn 1996.